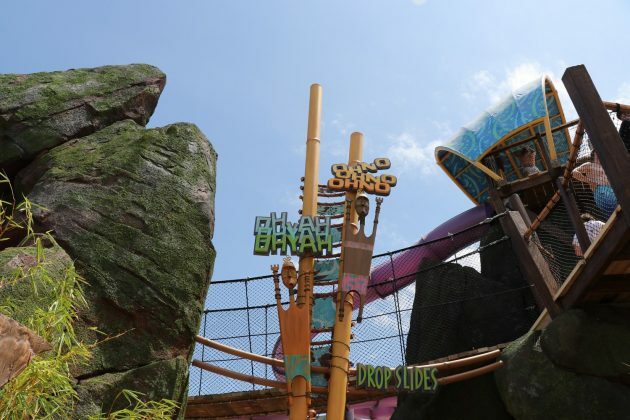 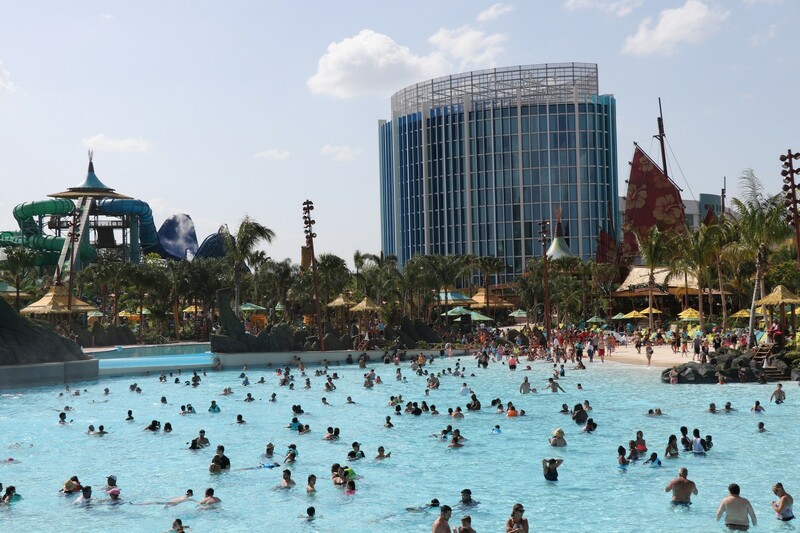 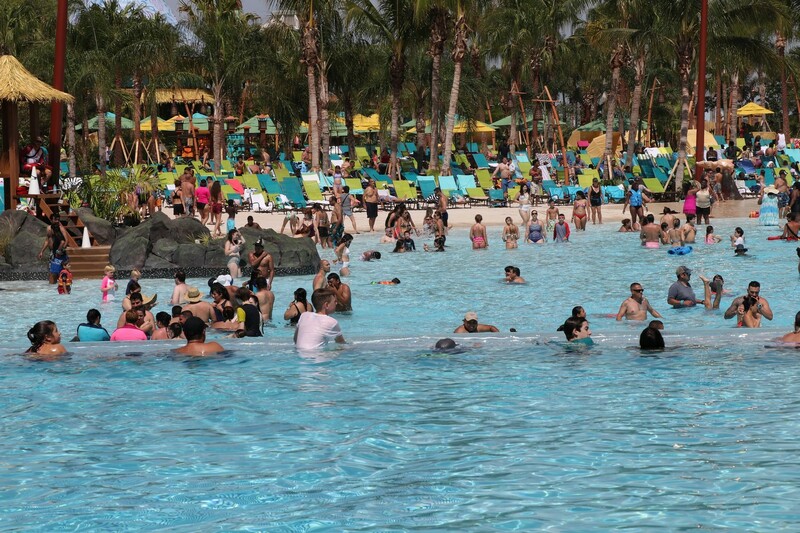 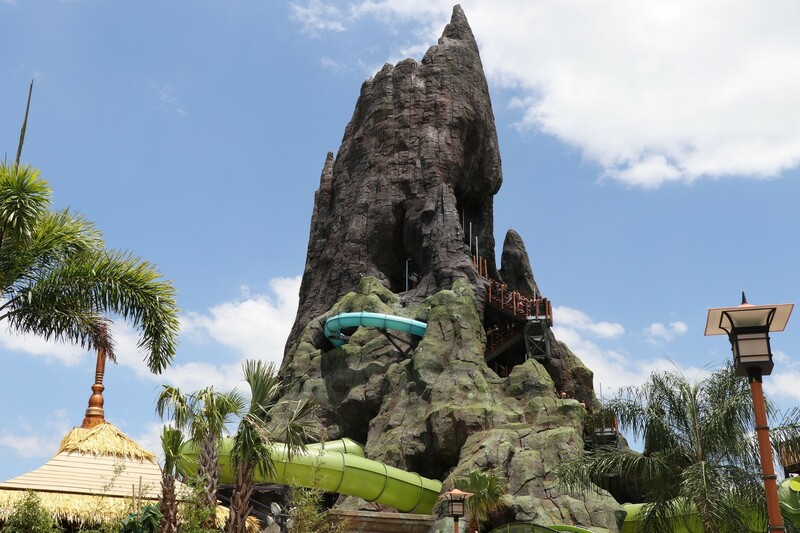 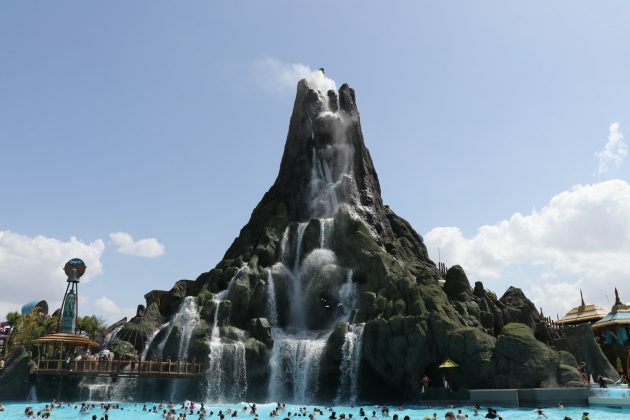 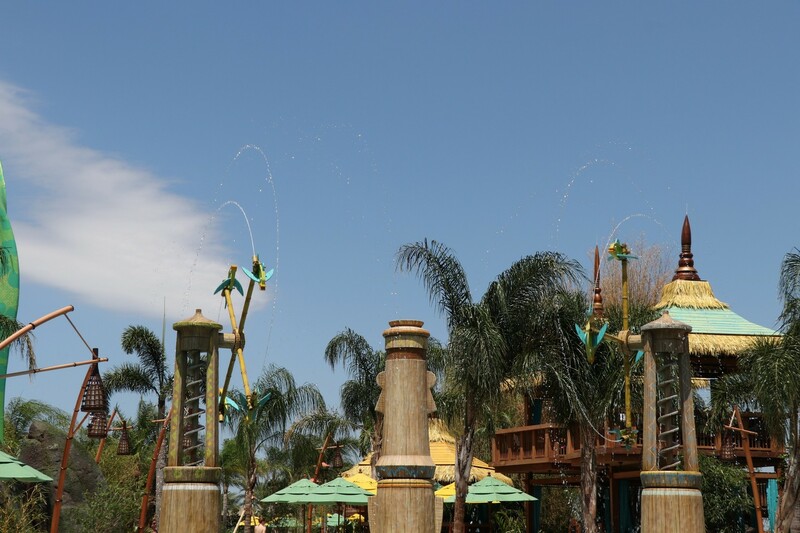 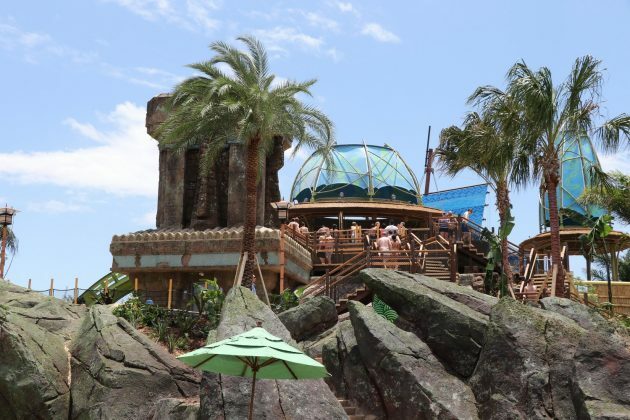 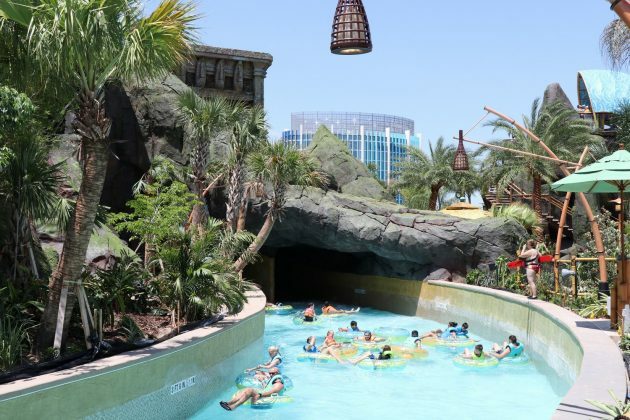 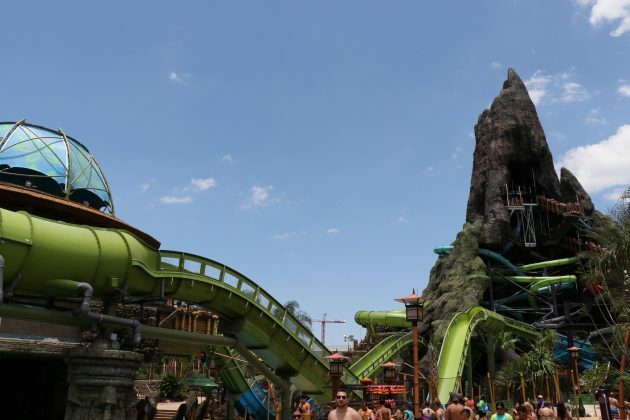 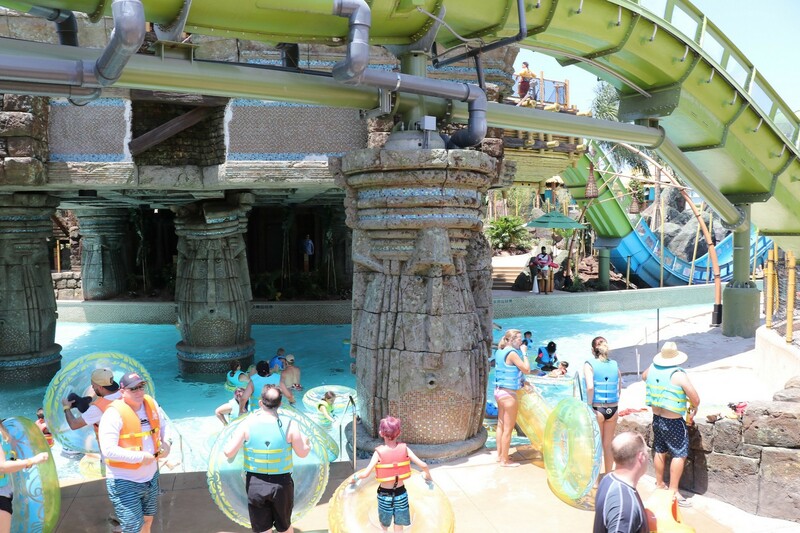 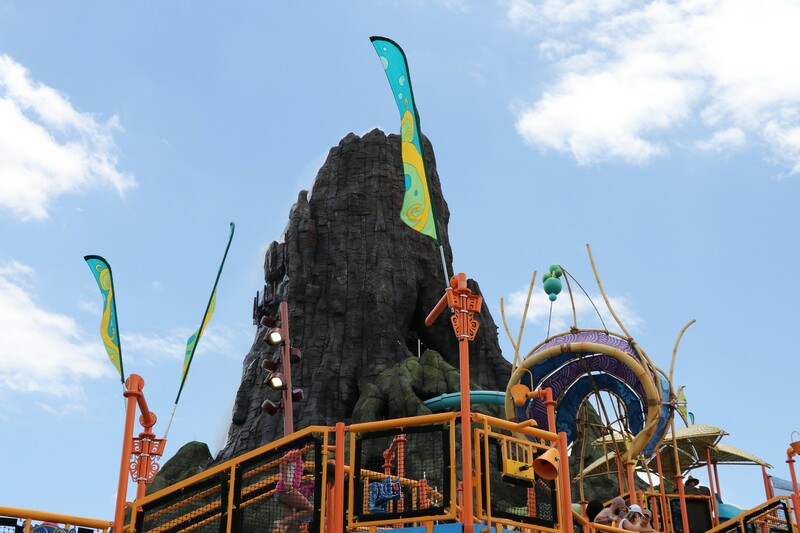 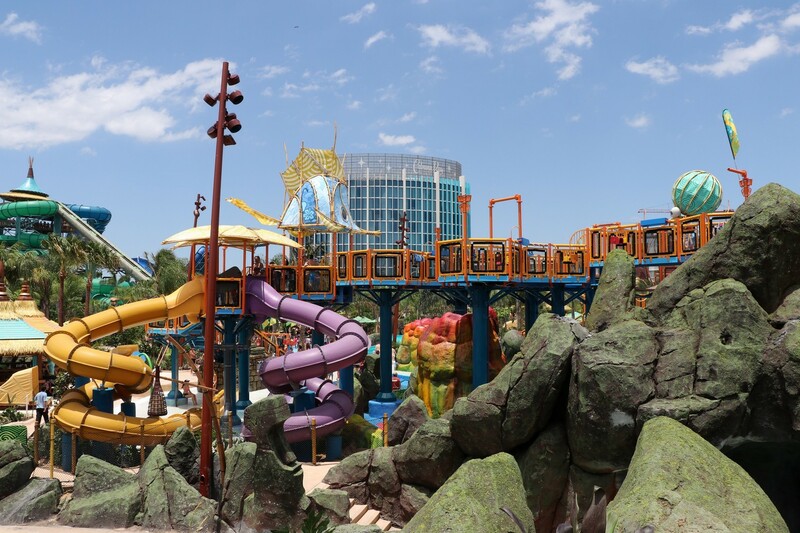 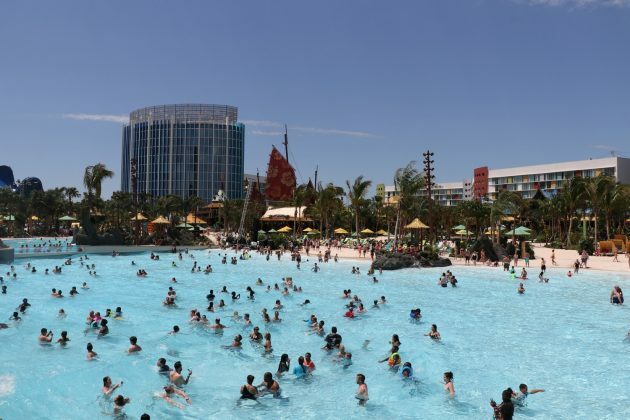 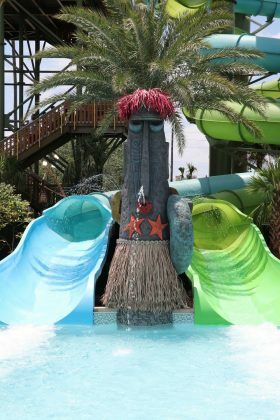 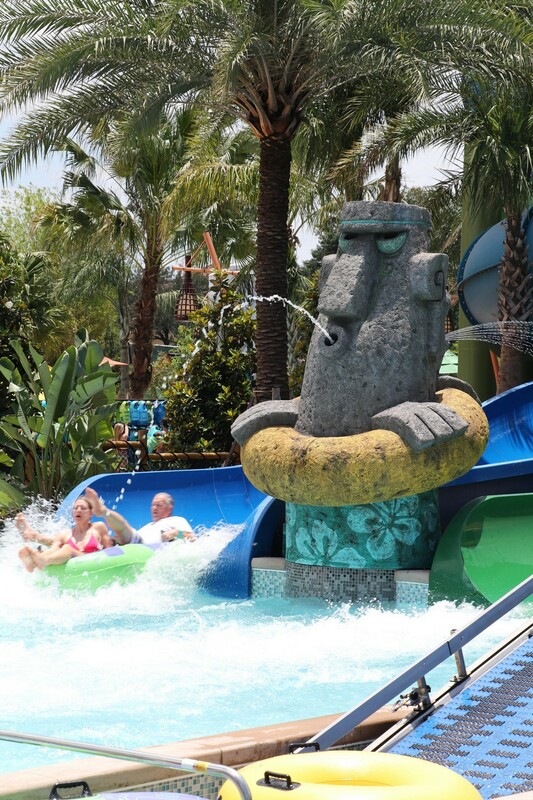 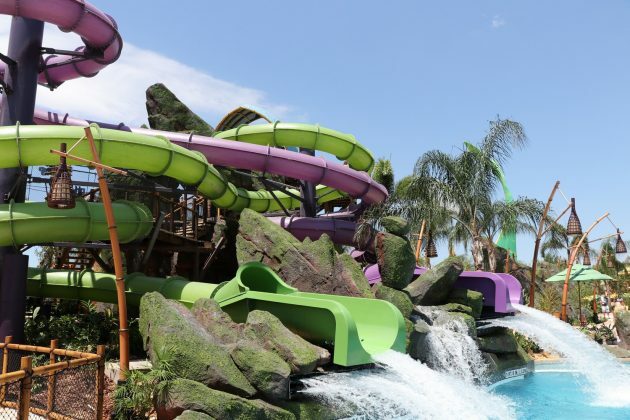 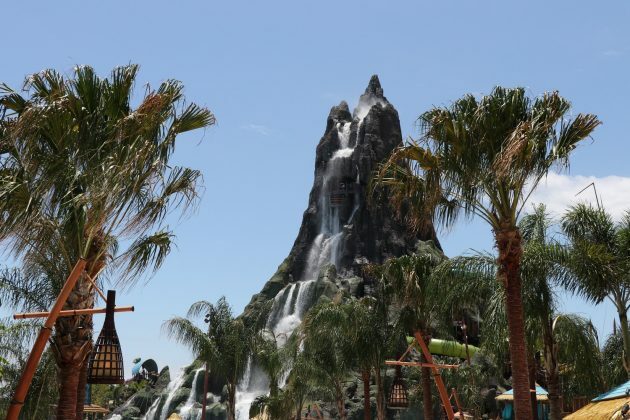 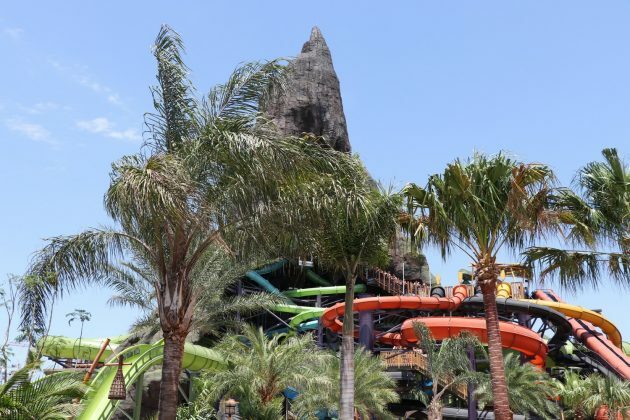 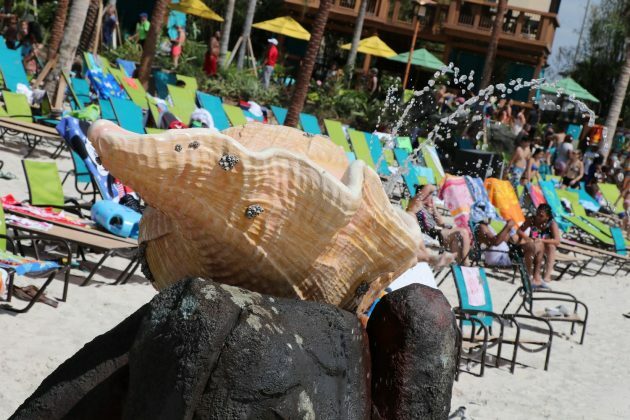 Universal’s Volcano Bay opened on May 25th, marking a big milestone for Universal Orlando as they continue to grow their resort into a premiere destination. 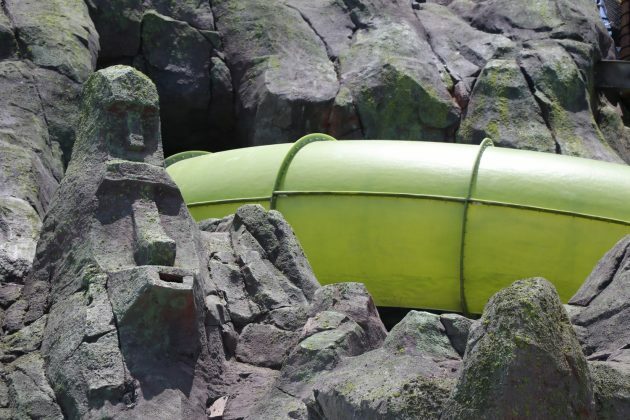 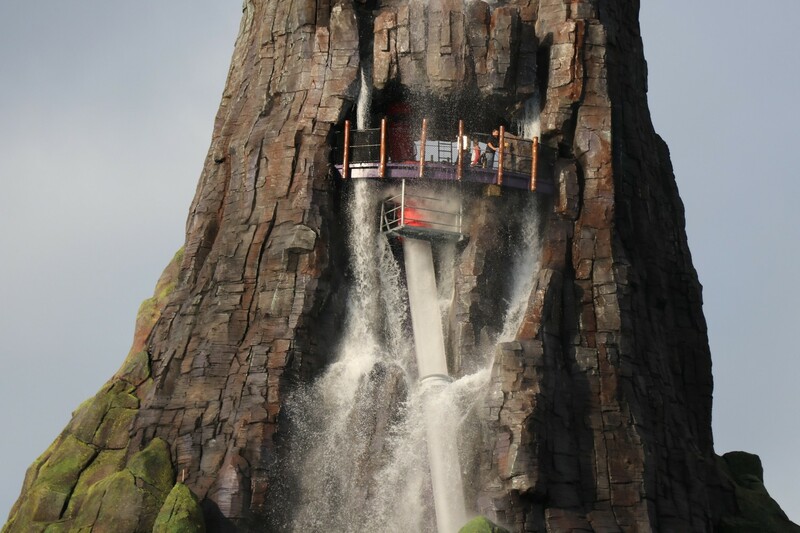 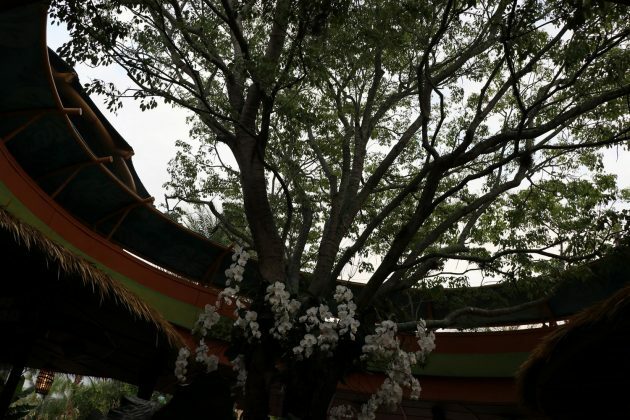 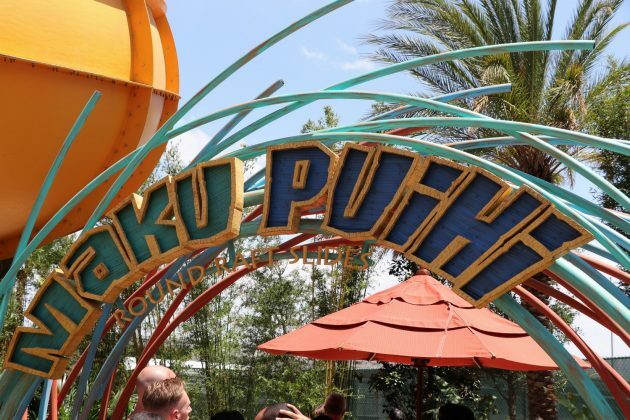 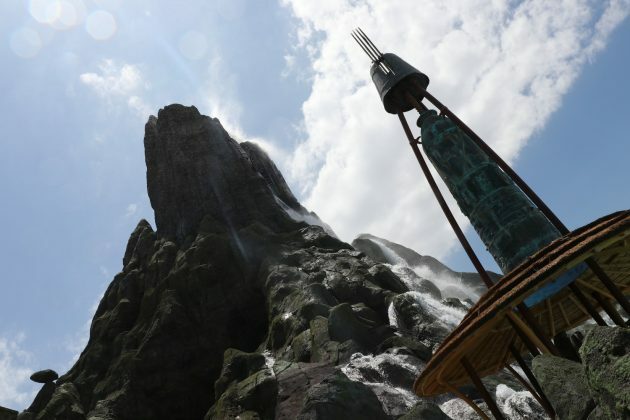 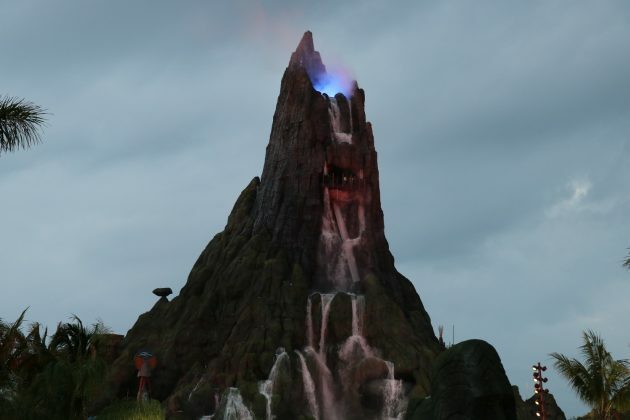 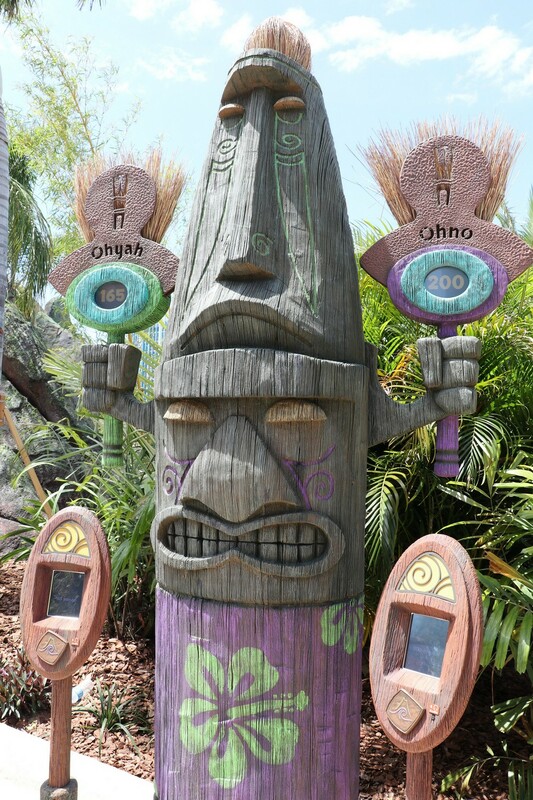 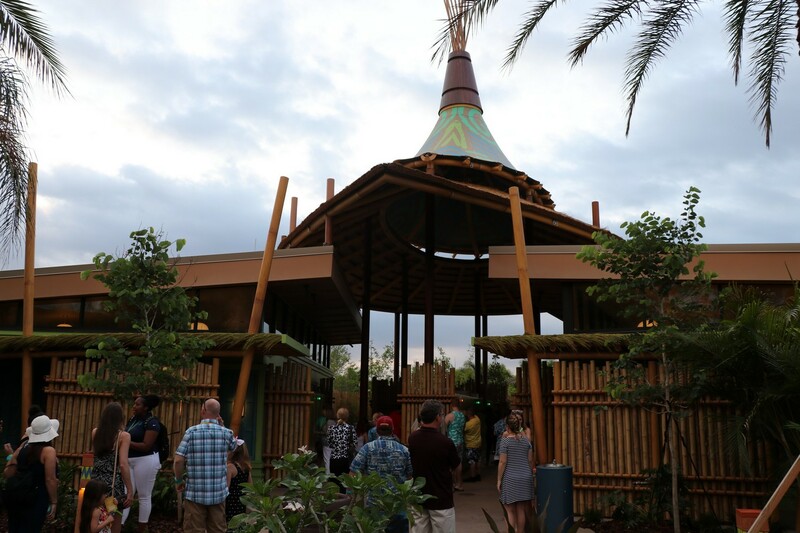 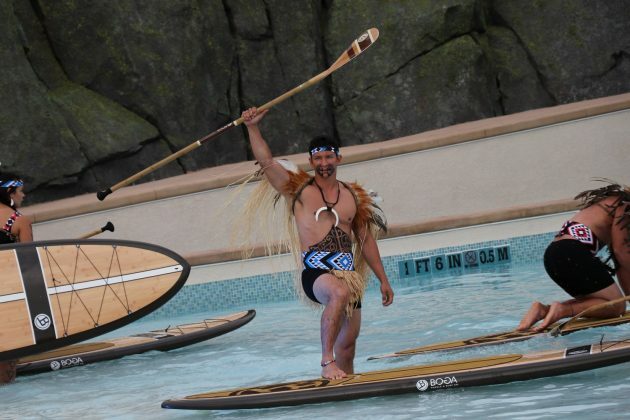 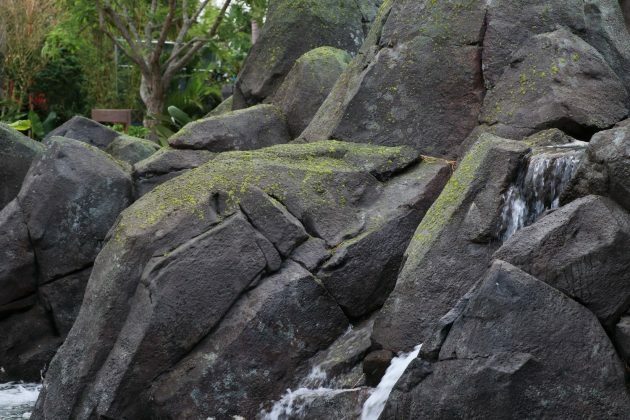 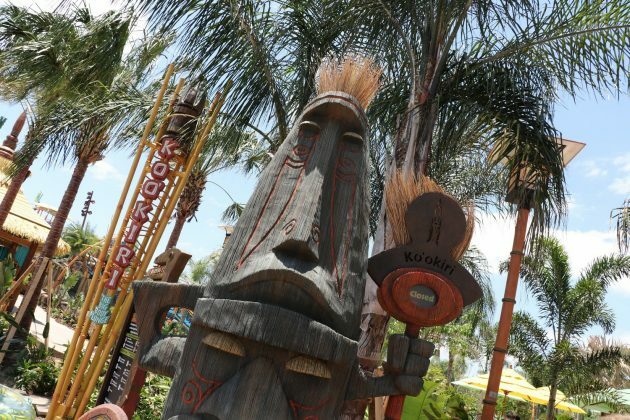 The new park features 30 attractions spanning across 25 acres, and introduces the virtual queue concept to an entire park using TapuTapu technology to go along with an immersive backstory. 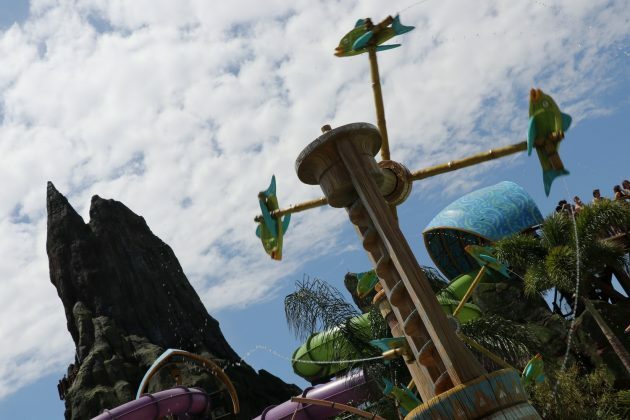 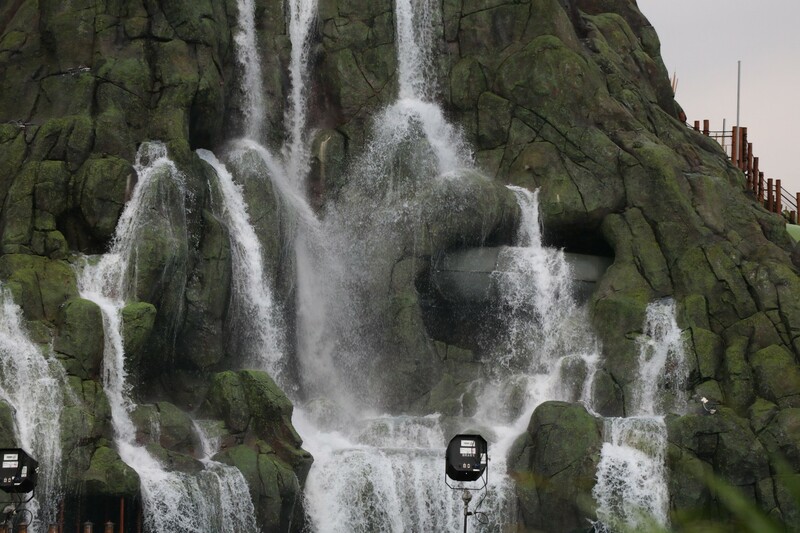 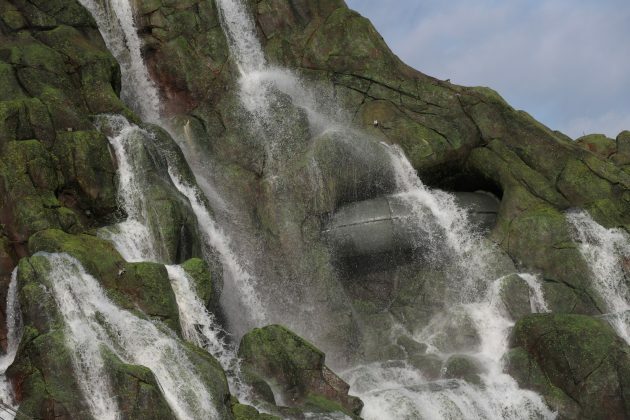 Marketed as their 3rd park, a “Water Theme Park”, Universal opened themselves to some high expectations, with many wondering if they would be able to deliver and carry out their promises. 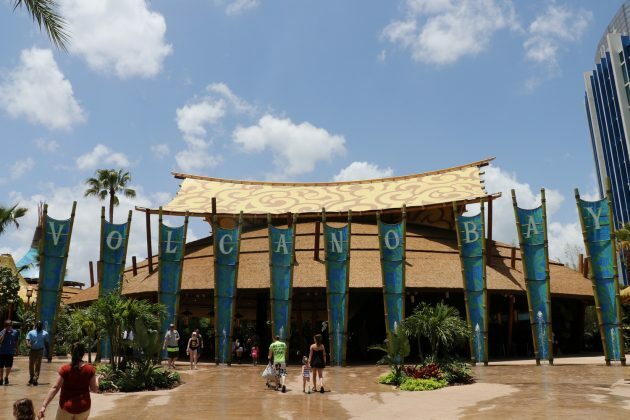 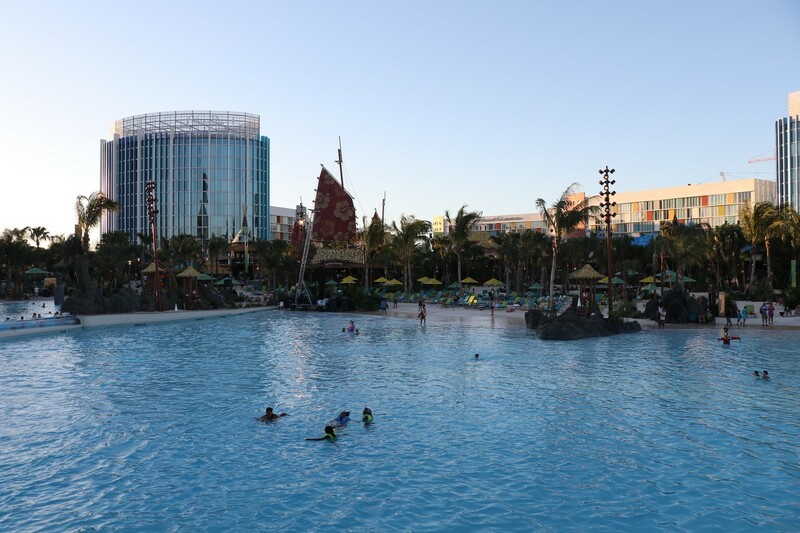 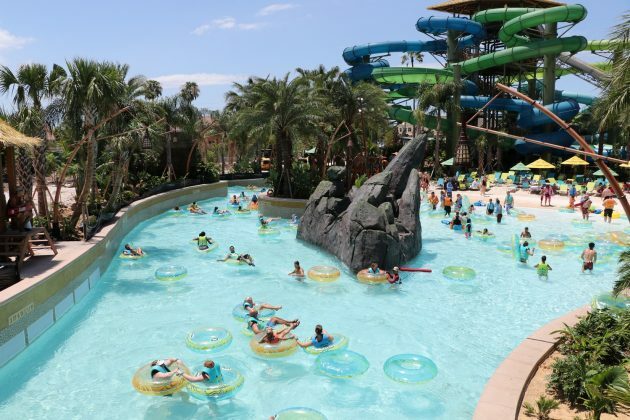 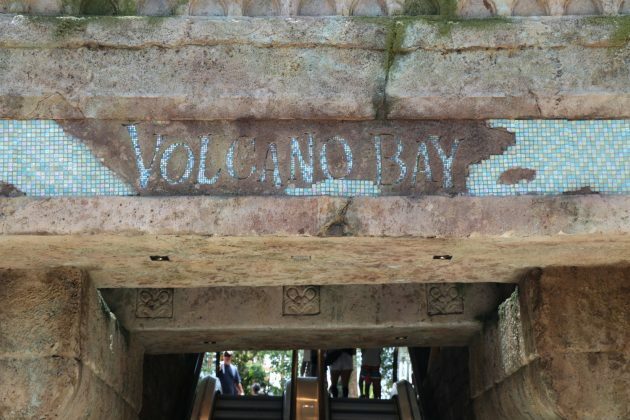 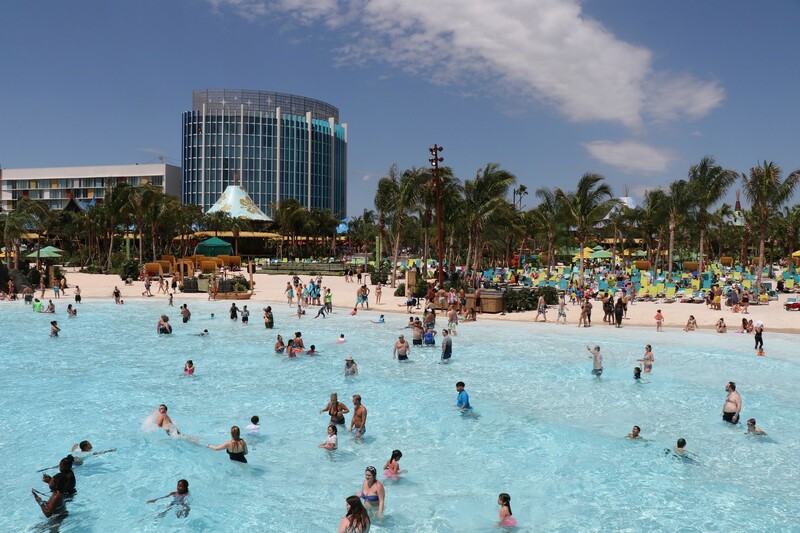 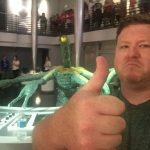 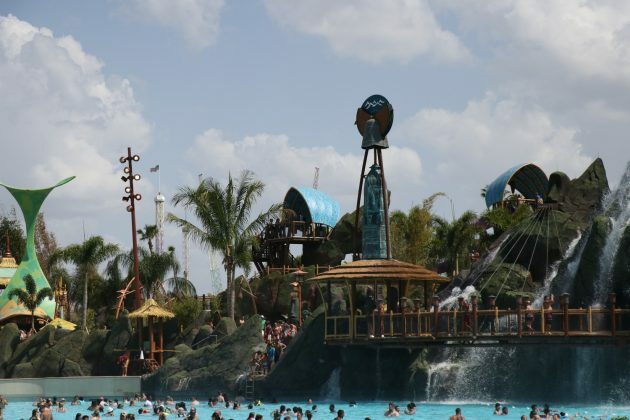 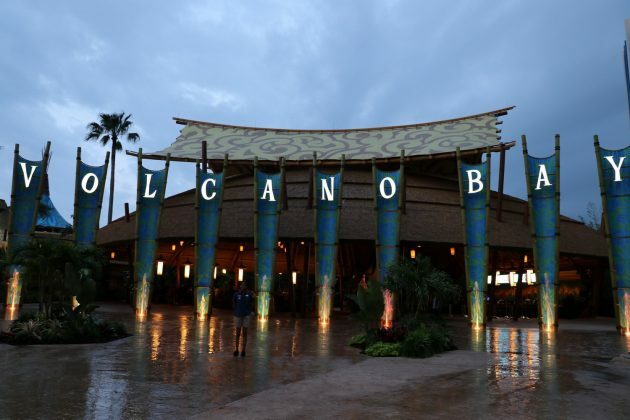 After spending 2 days at Volcano Bay, what did we think? 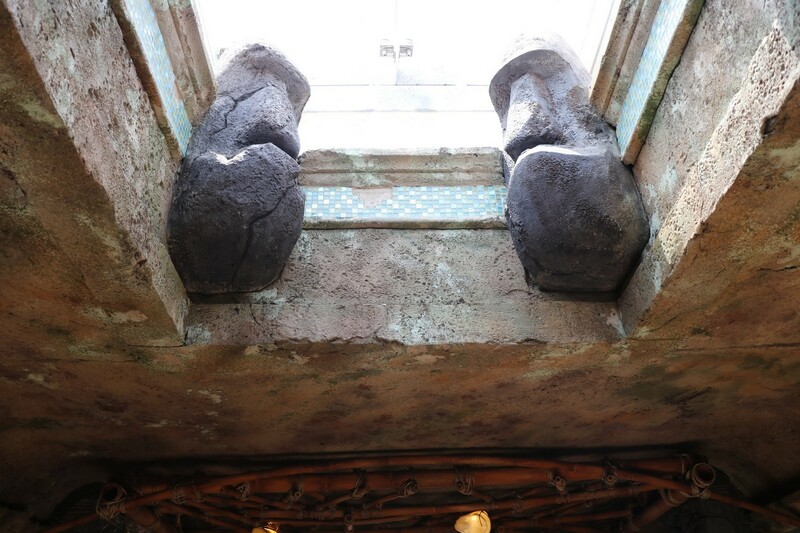 Before going into it, let’s address the 2 elephants in the room. 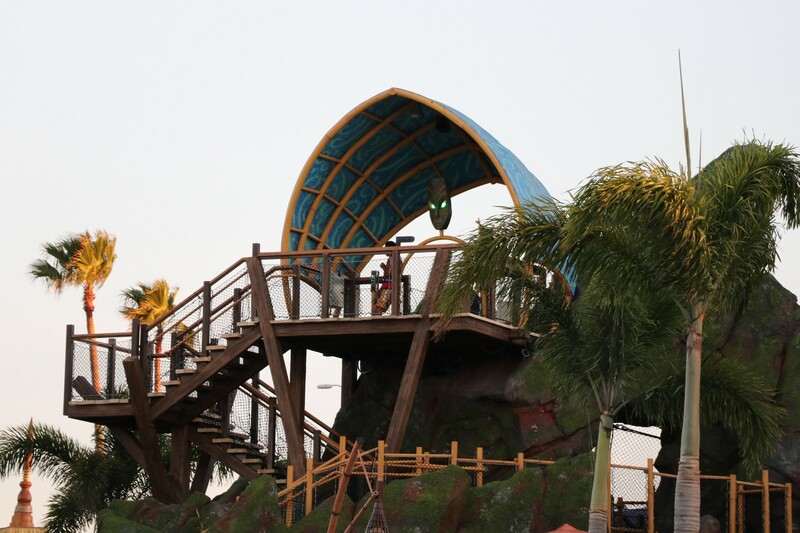 Firstly, Universal raced to the finish line to get Volcano Bay open, where construction crews were working well into the morning of Opening Day to finish what they could. The park, while beautiful, is incomplete; especially as you make your way to the backside areas of the Krakatau – the 200 foot volcano centerpiece. 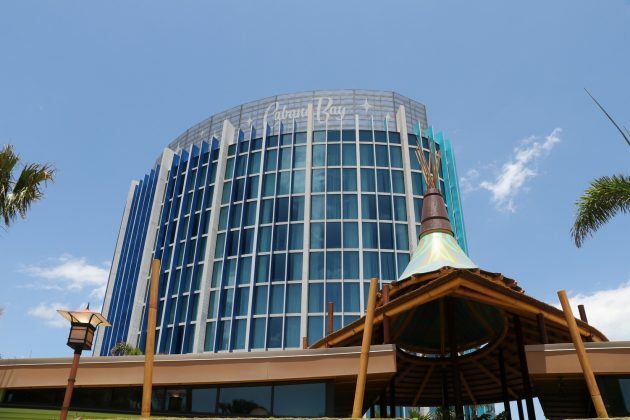 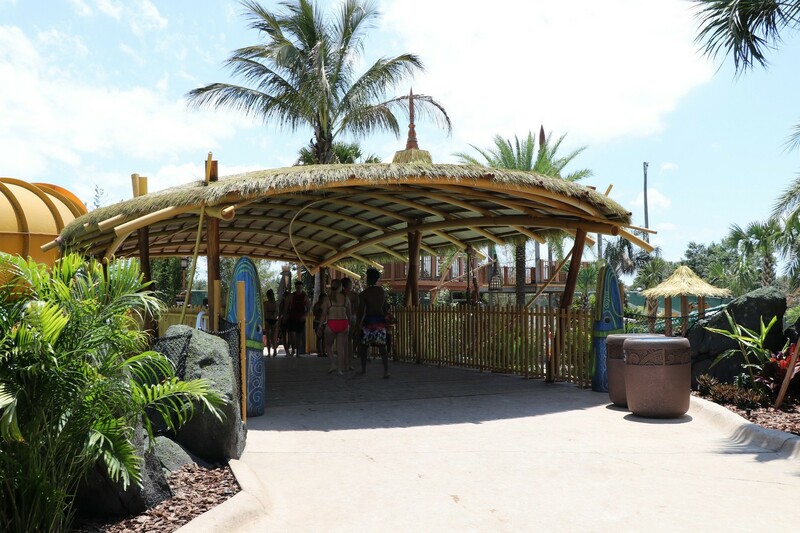 There are still areas left to finish, water features to complete, and finishing touches to add; but since Opening Day, the construction has not impacted guests, or our own, satisfaction. 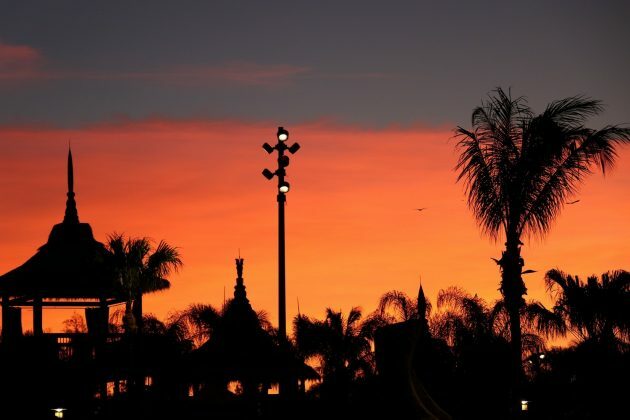 It’s a beautiful park. Secondly, since opening, guests feel unsatisfied with the high wait times at many of the slides, and wondering how exactly the virtual queue works. TapuTapu virtual queue was meant to eliminate waiting in long, physical queues, not eliminate waits all together. 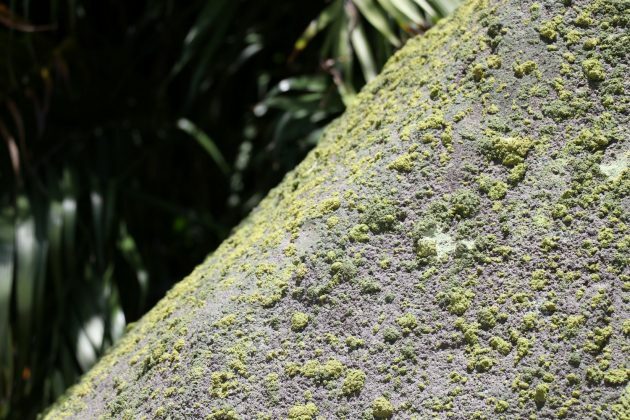 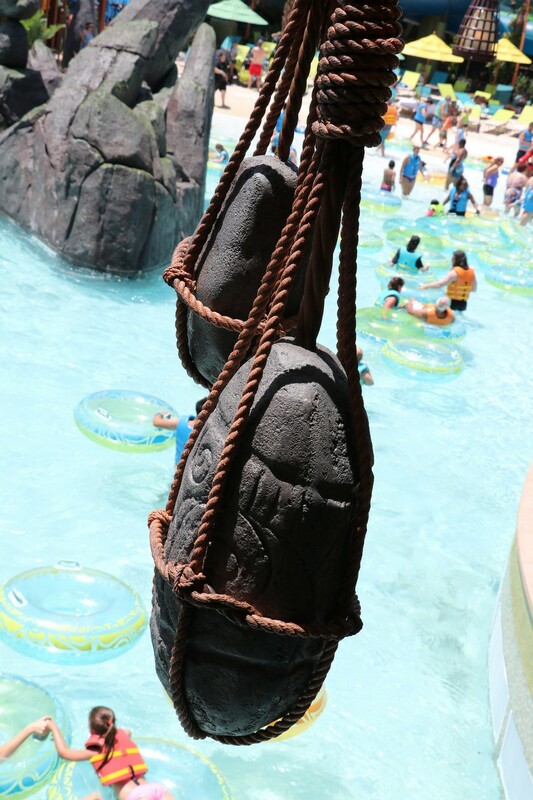 Reserving a spot with TapuTapu only allows a guest to reserve a spot for one ride. 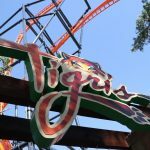 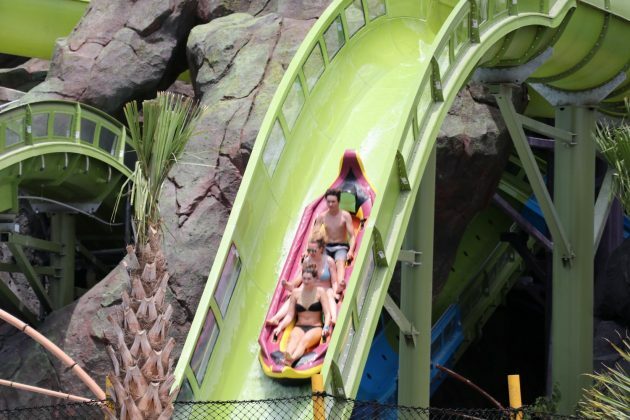 With it being Opening Weekend of Memorial Day Weekend, guests saw slide wait times get as high as 350-400 minutes, which prevented them to do much more than a handful throughout the day. 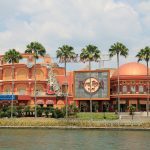 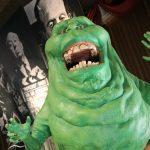 As of now, Universal has stopped selling Express to try to alleviate the waits, but anyone who has already purchased Express is still allowed to use it during their visit. 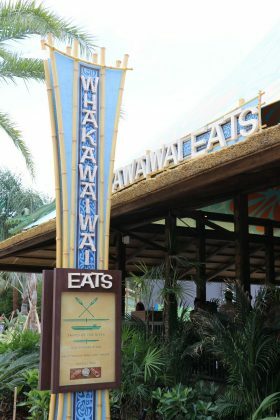 With that said, our visits were not impacted by the waits so we cannot speak from first-hand experience. 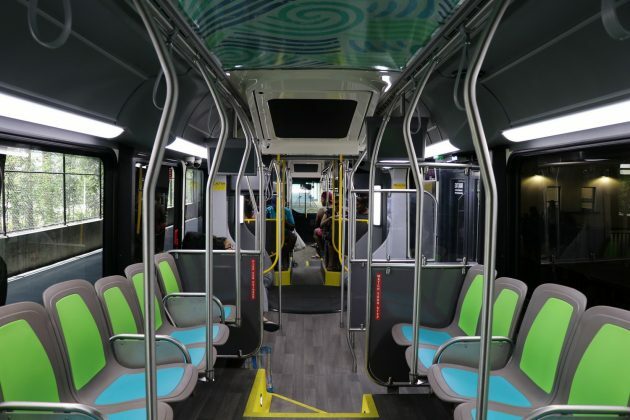 Universal has gone to great efforts adding accommodations for Volcano Bay seamlessly into their Resort – expanding their parking toll booths and converting the first level of the south parking garage as a dedicated transportation hub, with buses running non-stop to Volcano Bay. 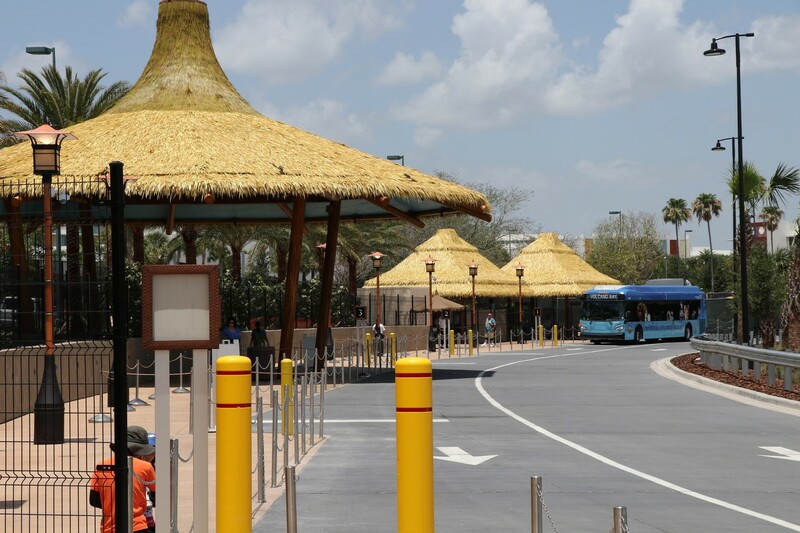 Guests staying on-property will be happy to know that there is bus service running from each hotel to the new park; save for Cabana Bay, which has its own dedicated entrance. 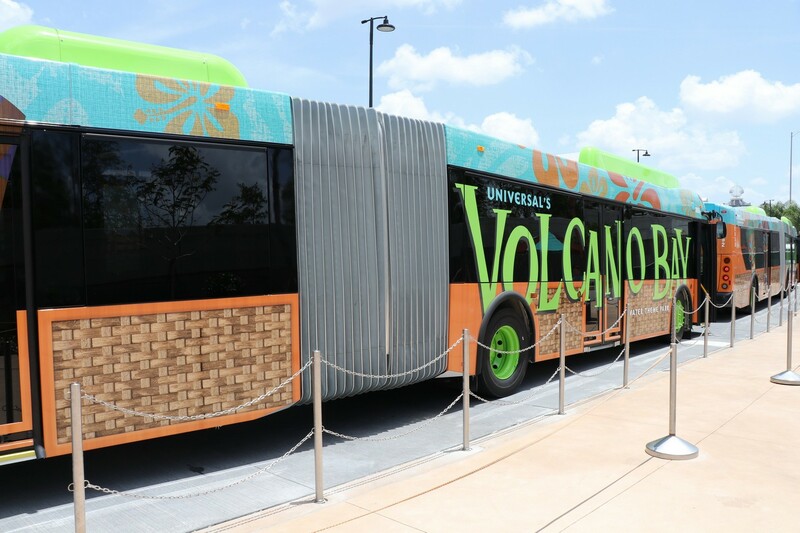 During our 2 visits, there was always a bus loading guests, with another right behind ready to be next. 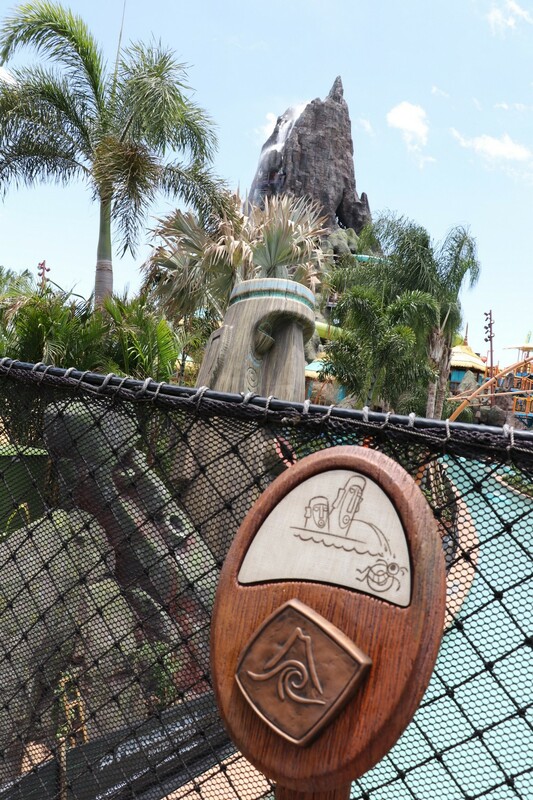 Once you enter Volcano Bay, you are handed a TapuTapu wearable immediately. 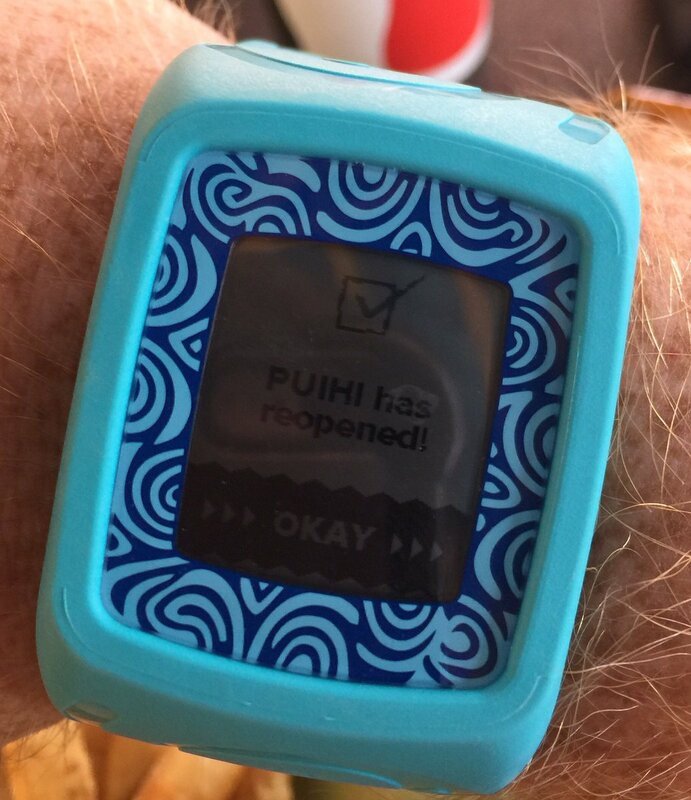 The band itself is thick and durable, but wasn’t an inconvenience to wear. 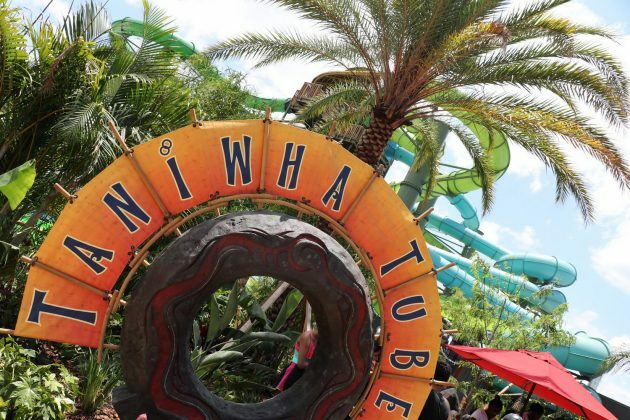 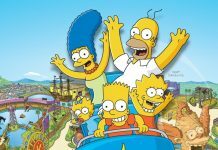 Universal is betting big on the technology, hoping this to be the “next big thing” of theme parks and helping increase guest satisfaction. Other than the wait time kinks, we found the technology to work perfectly. When renting a locker, it was extremely easy to select one and link our TapuTapus together in seconds. The TapTu pay system also worked extremely well during our visit, having no issues with paying for lunch, drinks or dinner. 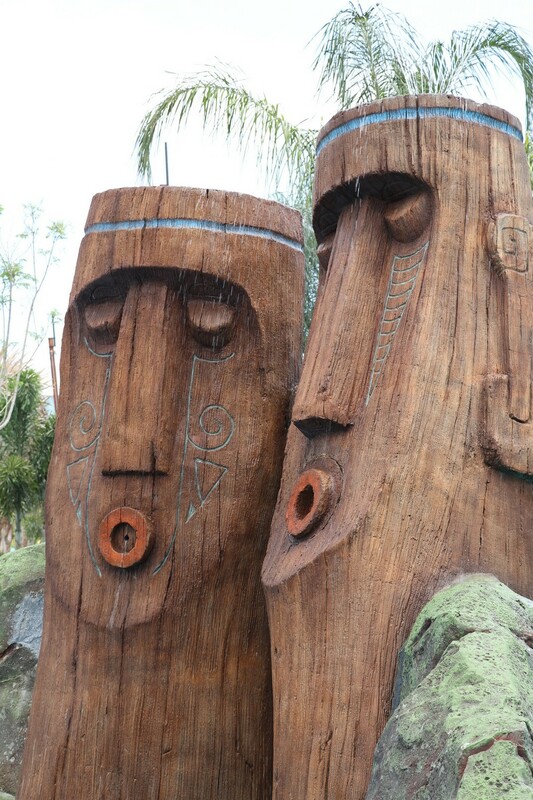 A heads up however – if you do link your wallet/pass to TapuTapu, it will not work if you setup your info on the day of your visit as it takes a day to load into the system. 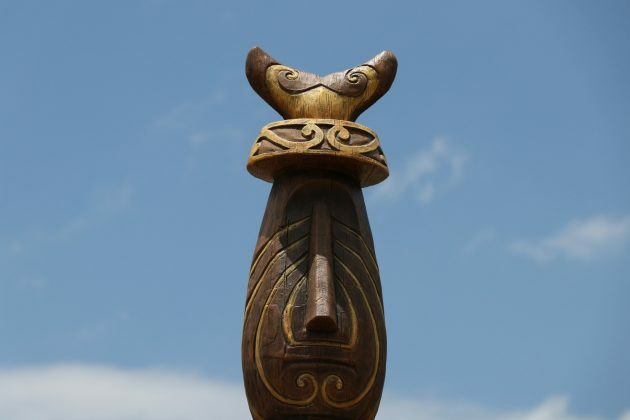 So if you plan on using TapuTapu as your source of payment, set it up the day before. 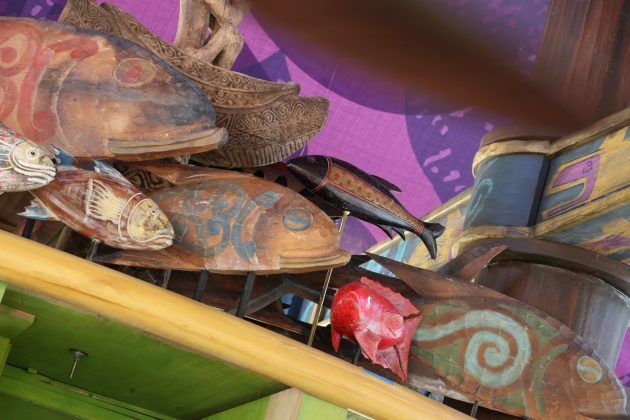 We are under the impression that there will be a fix for this soon. 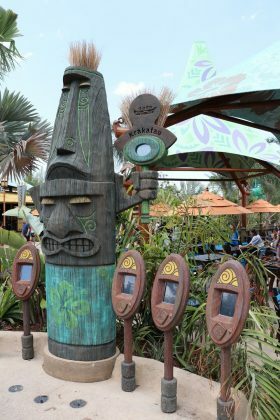 To reserve your spot in a queue, just hold the wearable up to the dedicated station for a couple seconds, and your wait time is reserved. On your wearable, you will see a notification on the screen indicating the name of the ride you selected and how much longer your wait is. 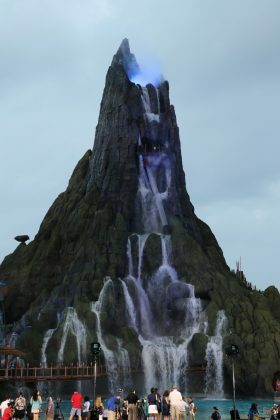 If a ride goes down, you will be notified of its closure. Your spot in line will still be held, but you do have the option of waiting it out, or choosing another slide. 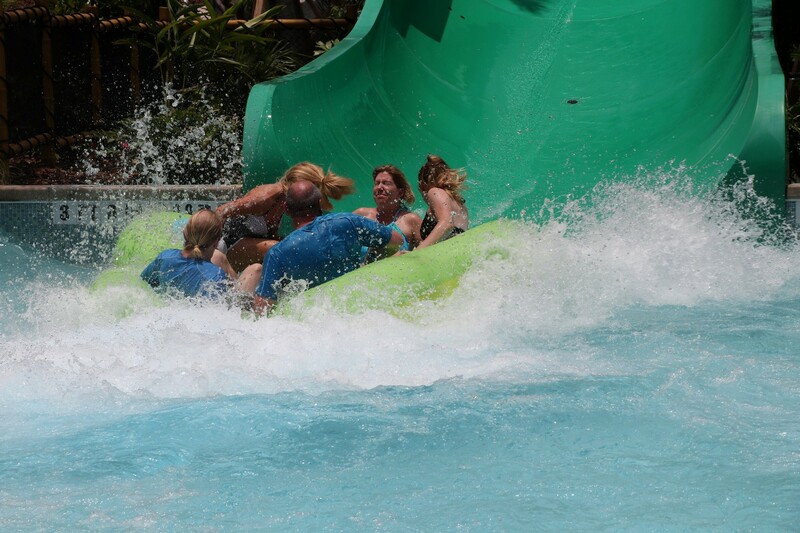 For example, during the late afternoon, we had reservations for the Puihi raft slide. While eating dinner, we were notified the slide had broken down. 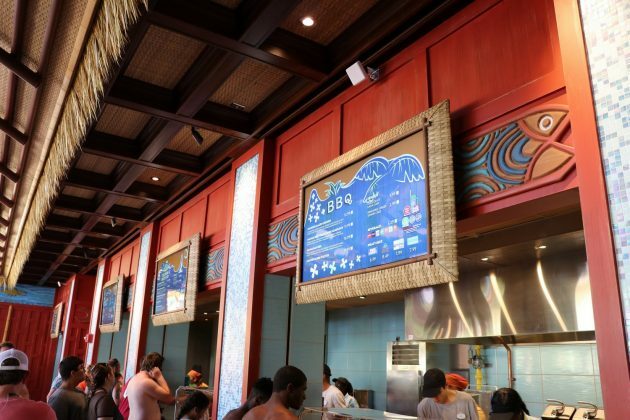 As we finished our meal, we got another notification saying it was back open; which we found to be a really fantastic touch of the tech’s potential. If we had some criticism, it would be that the wearable does not give you the time of day; and while not a critical opinion – the wearable is pretty thick so you may end up with a TapuTan if you aren’t mindful of the sun. 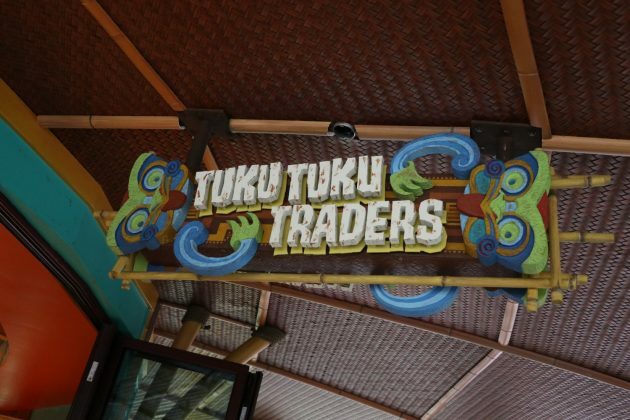 Once the opening issues are worked out for the wait times, the future of the TapuTapu tech will know no bounds. 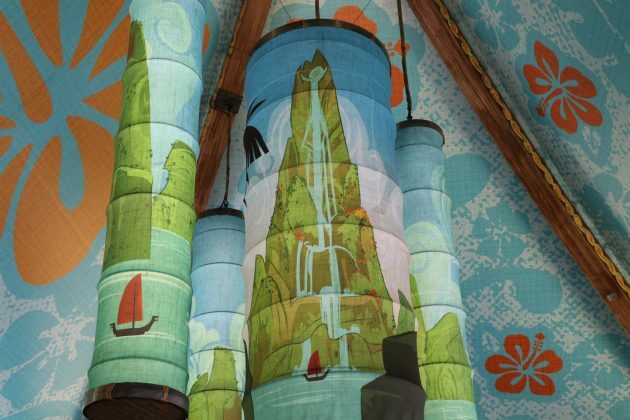 Everything about Volcano Bay is based off of South Pacific/New Zealand lore, with the names, design, and story drawing huge inspiration from their culture. 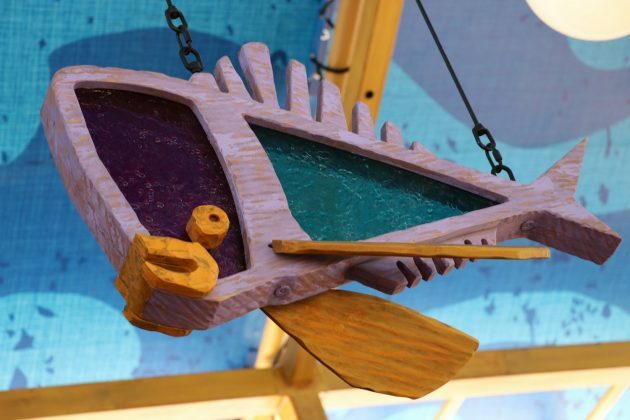 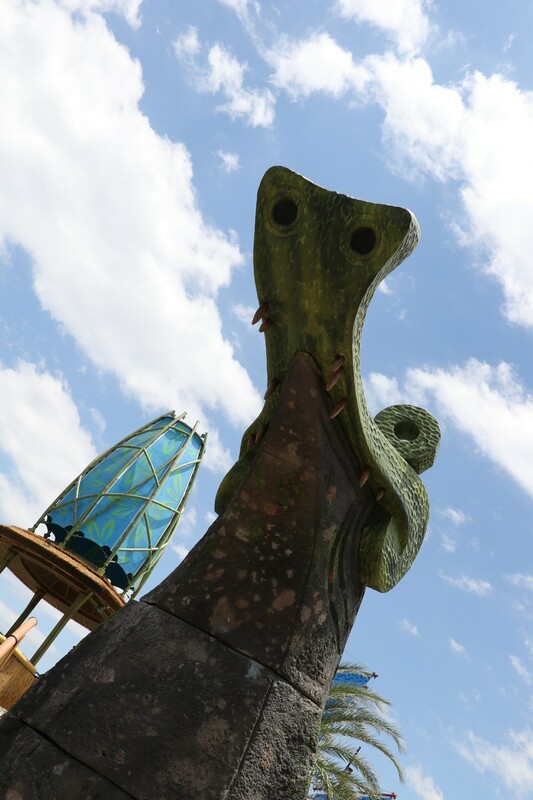 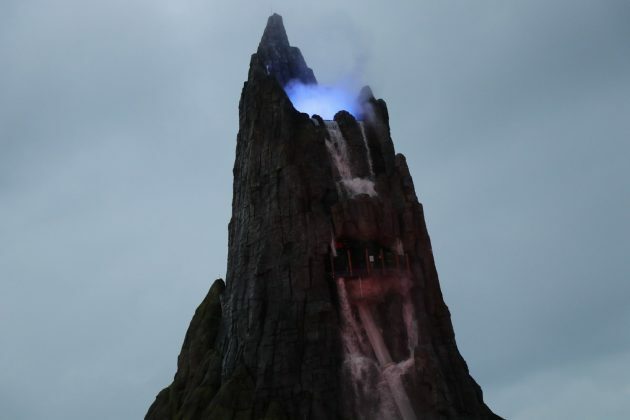 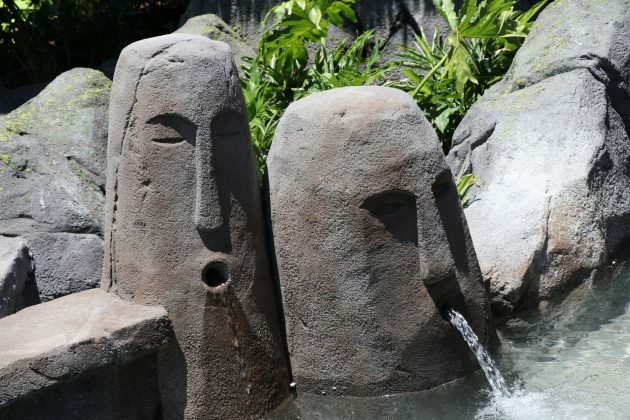 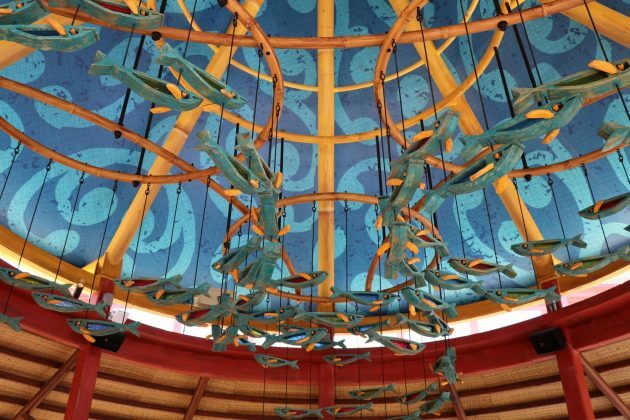 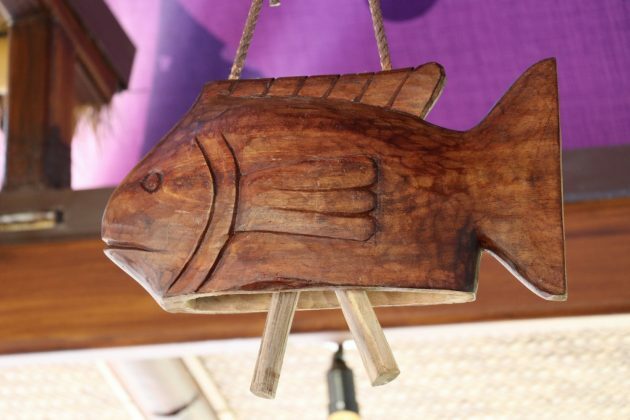 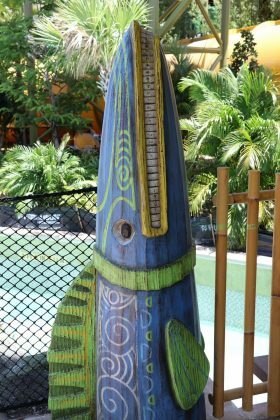 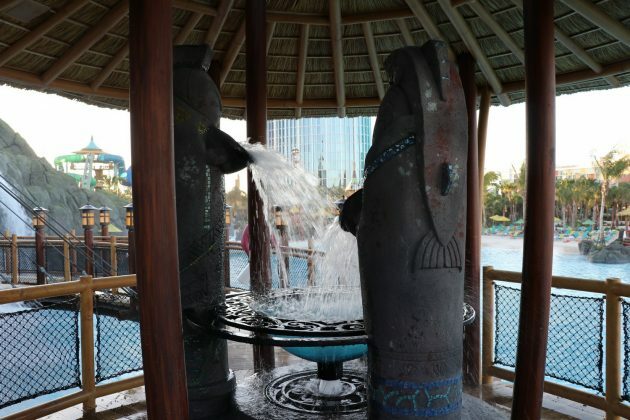 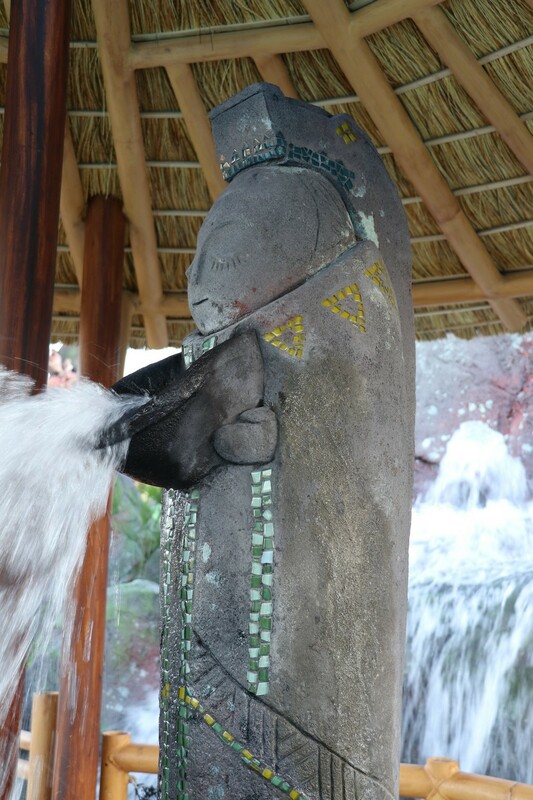 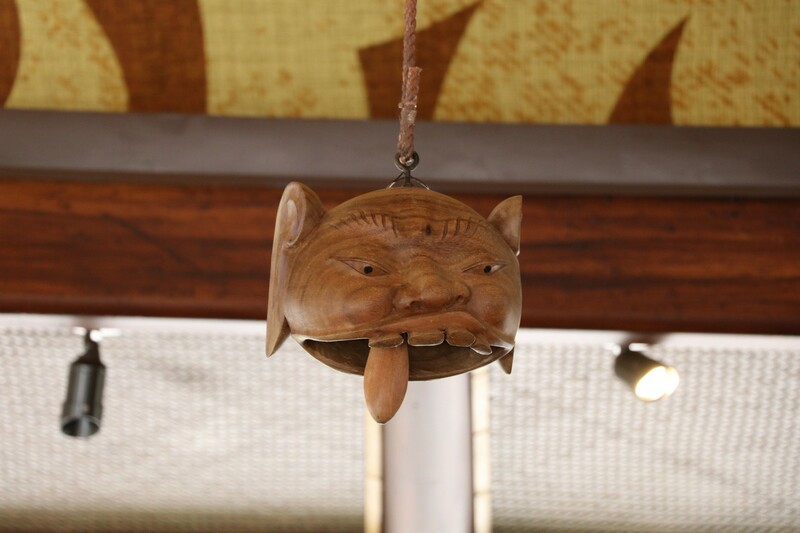 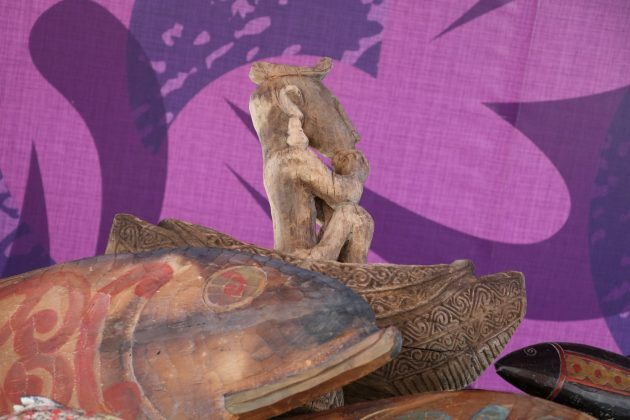 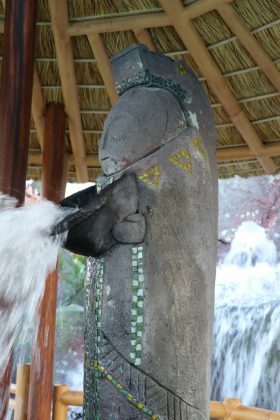 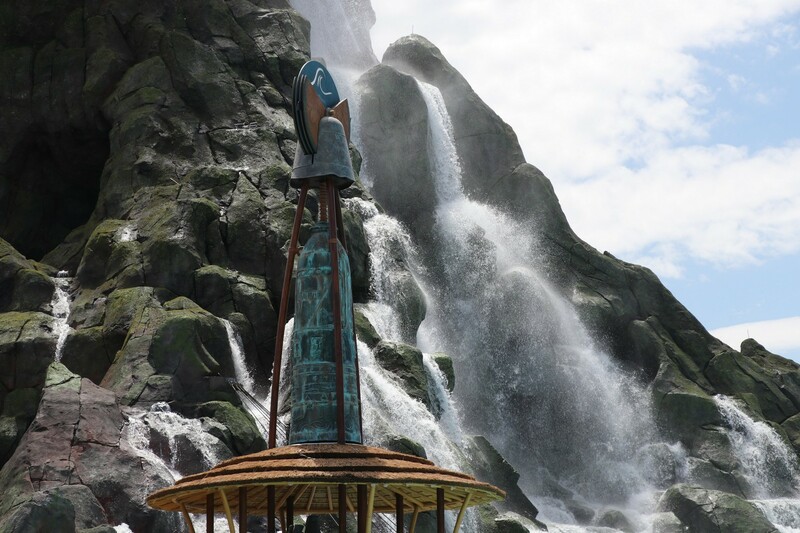 As the story goes, the Waturi are the inhabitants of the island, and have made Volcano Bay their home from the guidance of Kunuku, a mystical fish who was destined to lead them there; so you will see a lot of references to both throughout the park. A word you will hear a lot of during your visit is “Kia Ora”, which is the Māori language greeting meaning to “be well/healthy” – which is used as both a greeting or as a farewell. 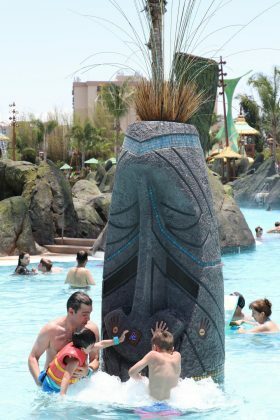 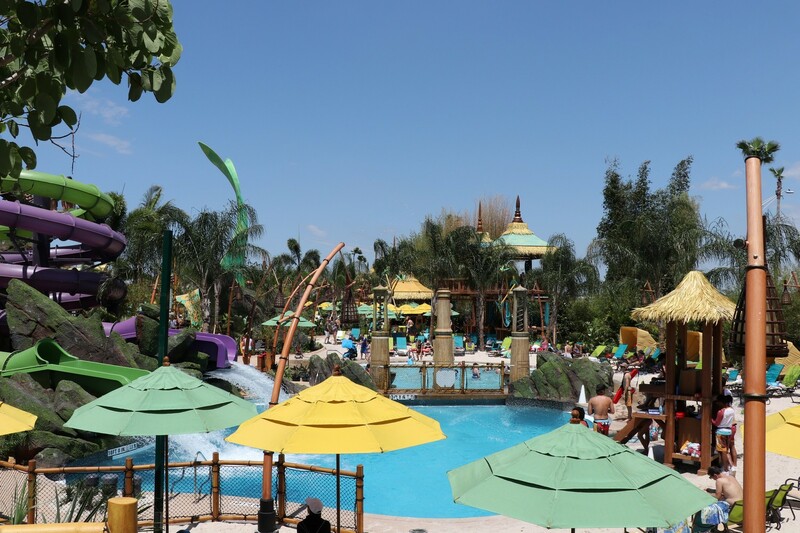 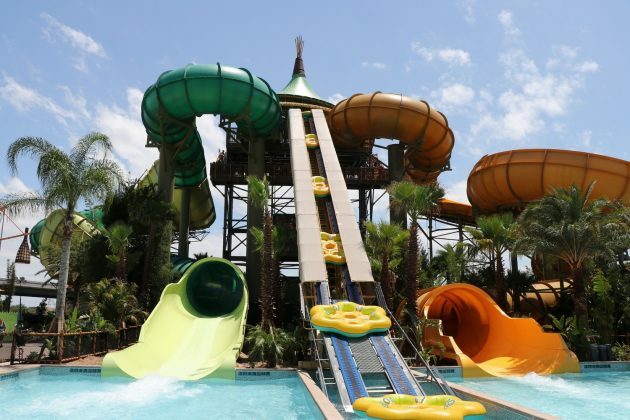 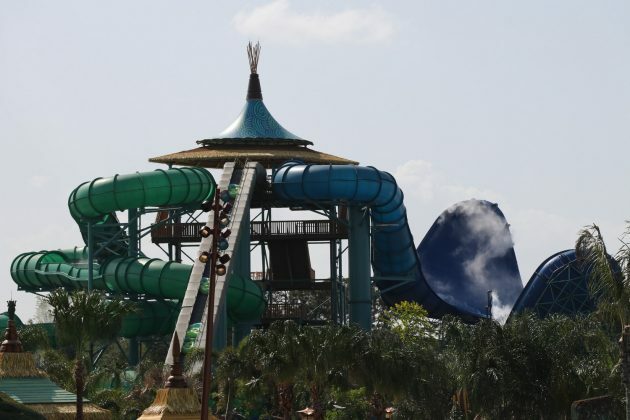 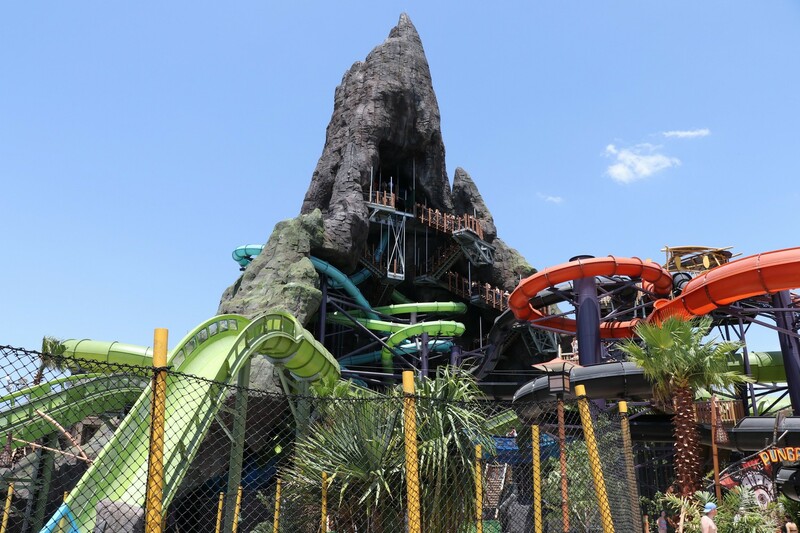 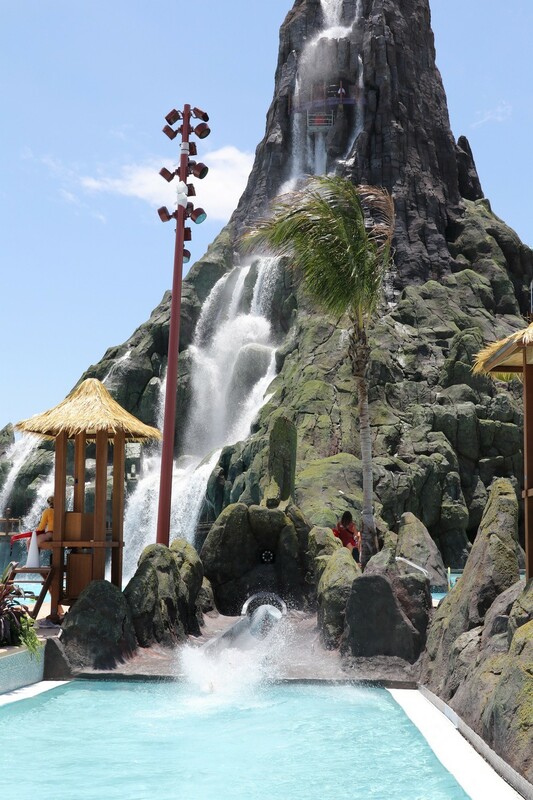 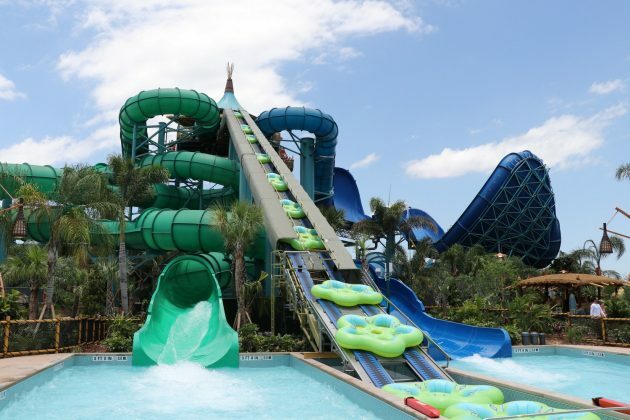 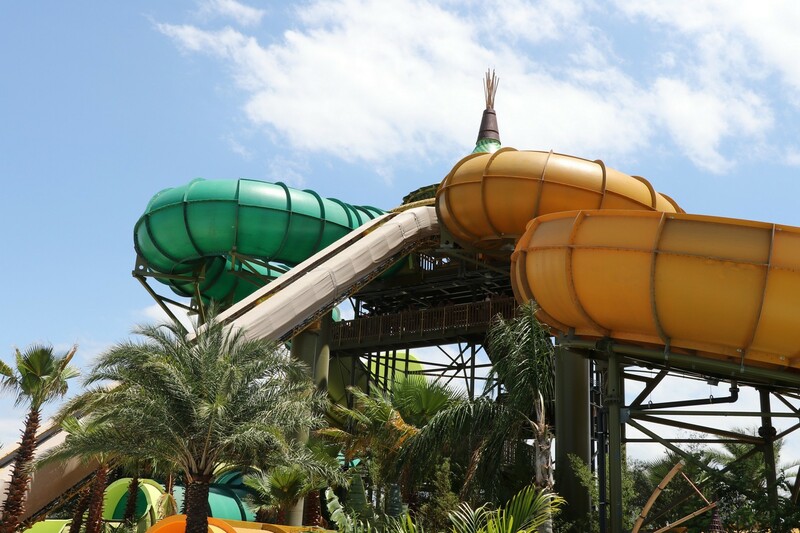 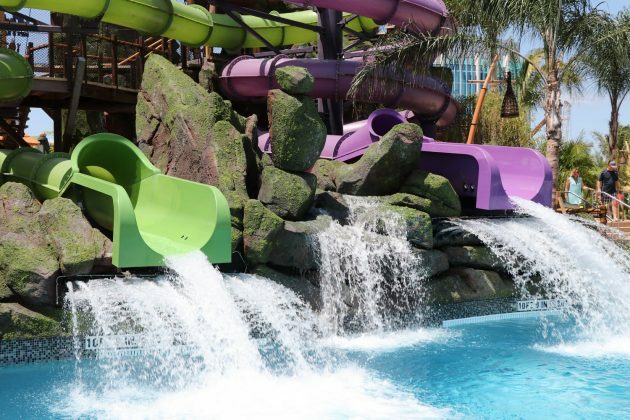 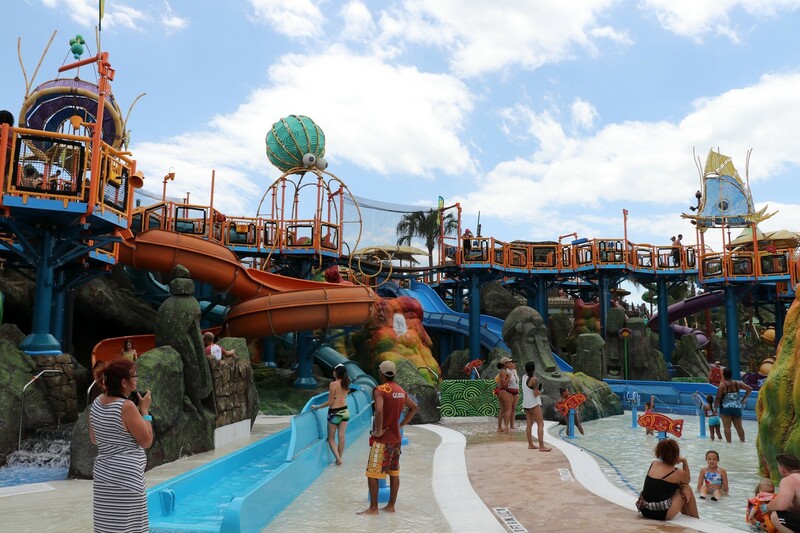 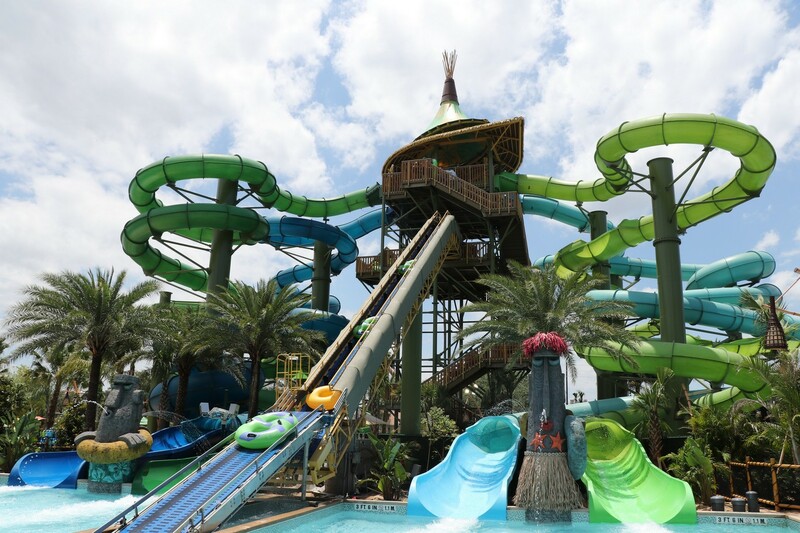 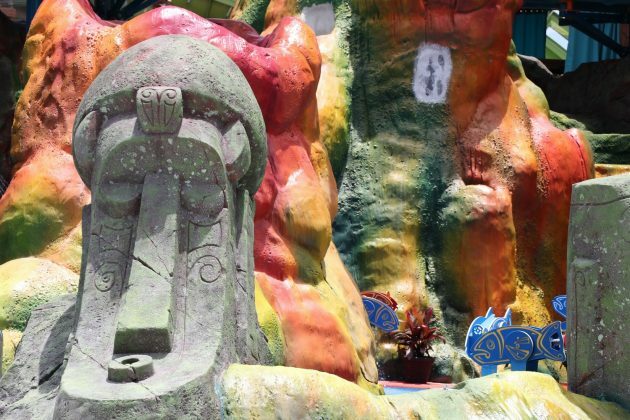 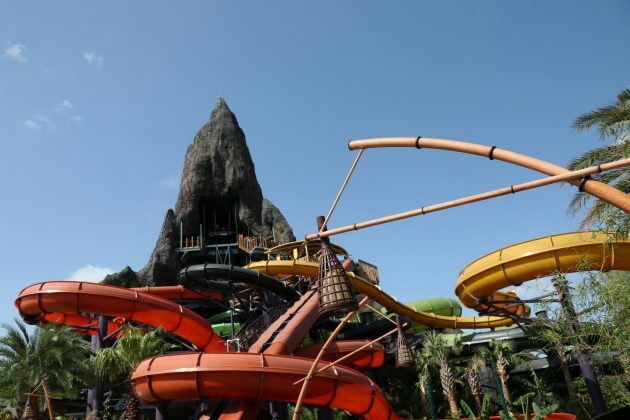 Volcano Bay is separated into 4 areas ; Krakatau – the area around the Volcano, Wave Village – the 2 wave pools, River Village – featuring more family slides and activities, and Rainforest Village – which features more thrilling slides. 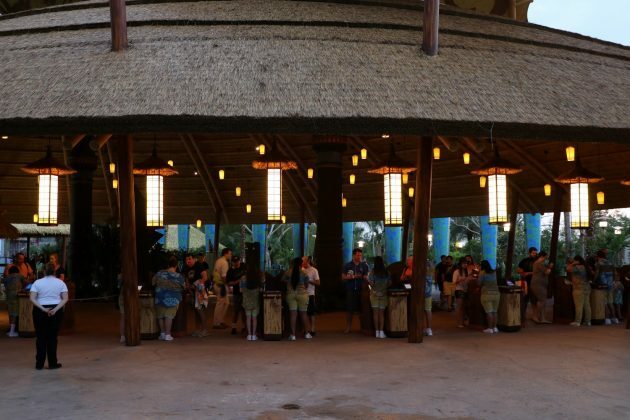 While the themeing is beautiful, there is no way to discern the difference, especially between the River and Rainforest Village. 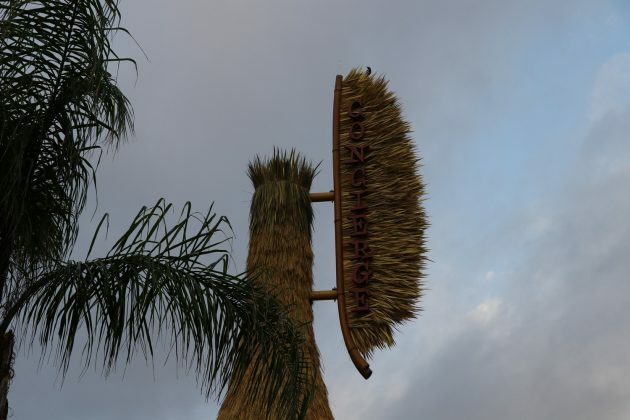 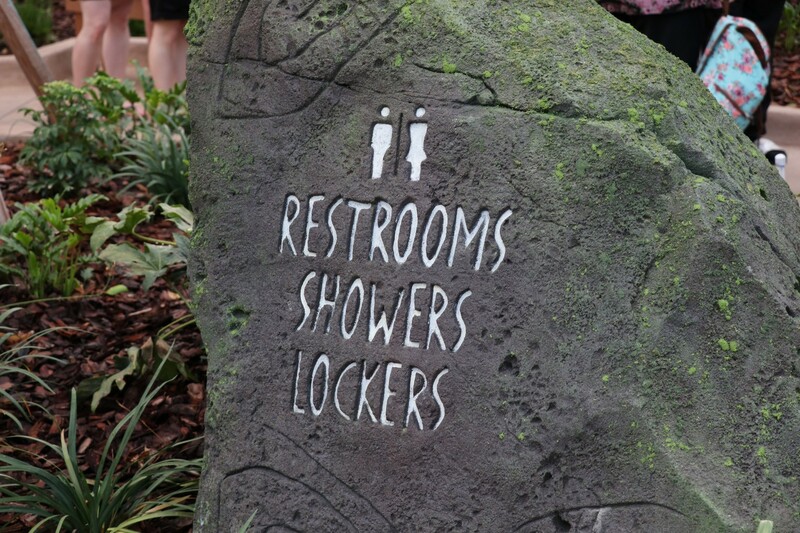 We’re not sure if it was intentional, or just a matter of Universal adding some more finishing touches. Either way, as we’ve stated many times, it’s a beautiful park; and as the foliage begins to grow as time goes on, the lush greenery will not only offer some great visuals, but some great shade. 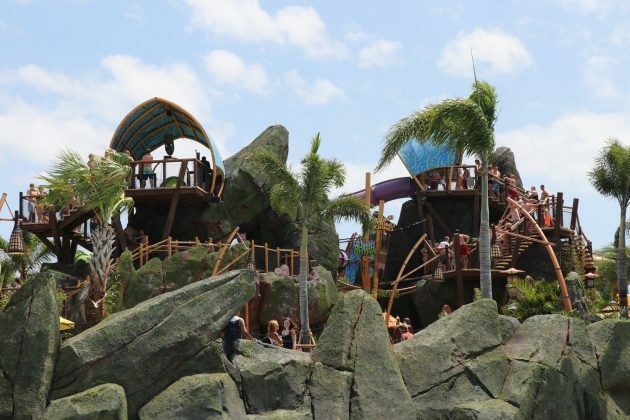 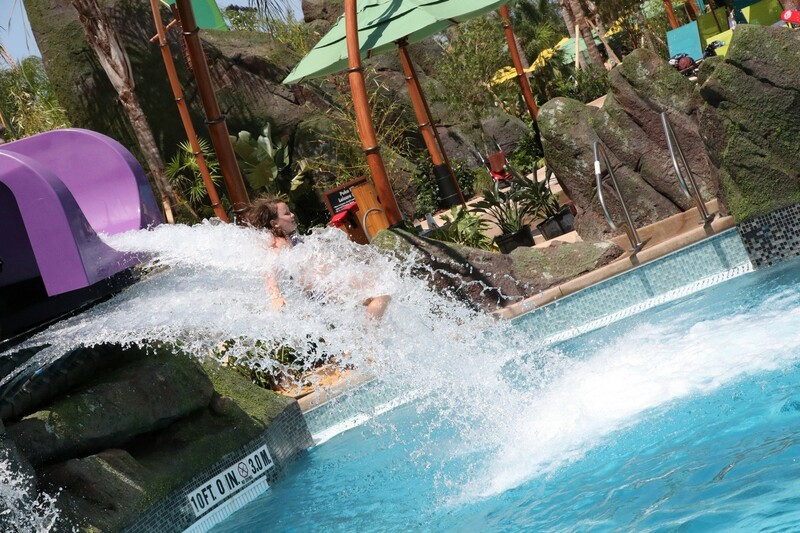 There are 11 slide attractions at Volcano Bay, with many of the pavilions featuring multiple experiences. 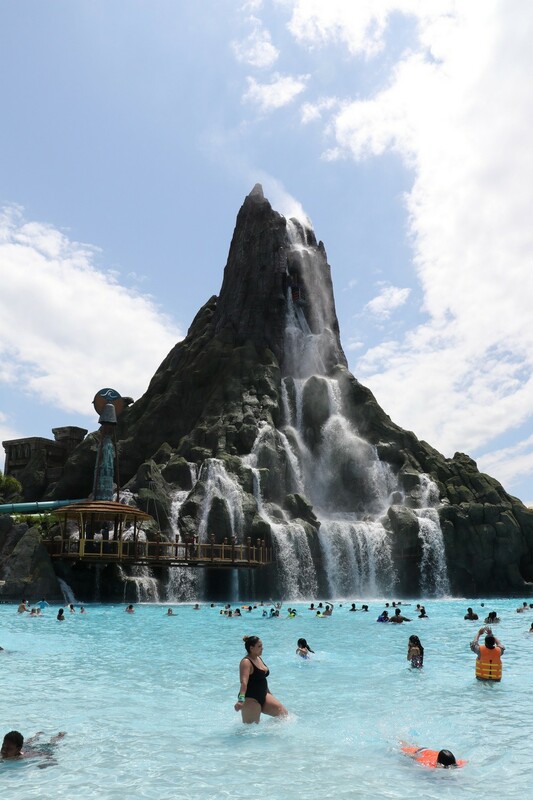 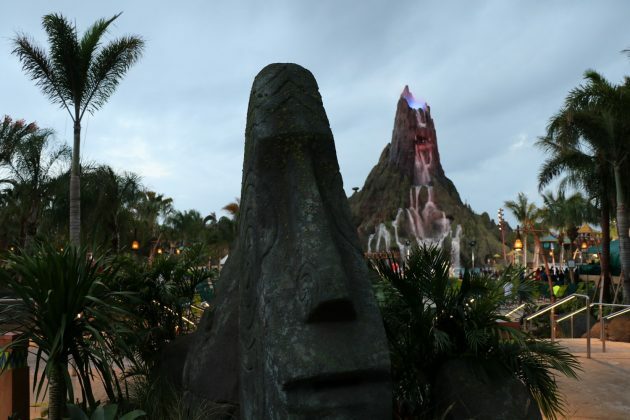 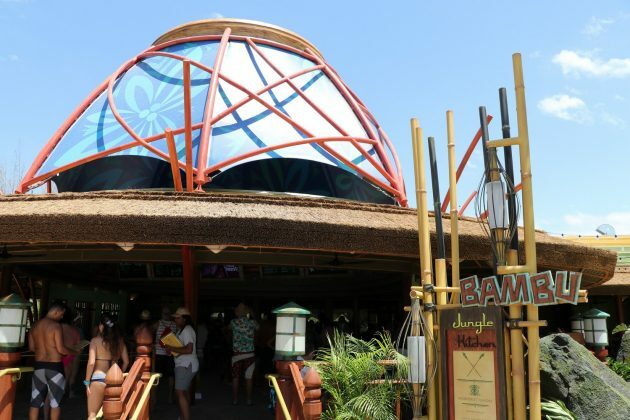 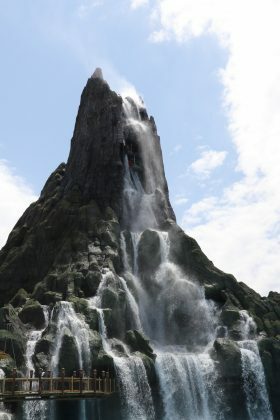 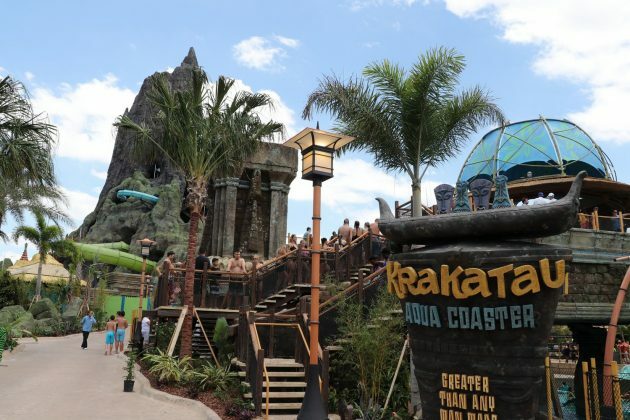 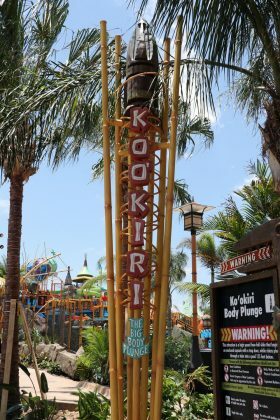 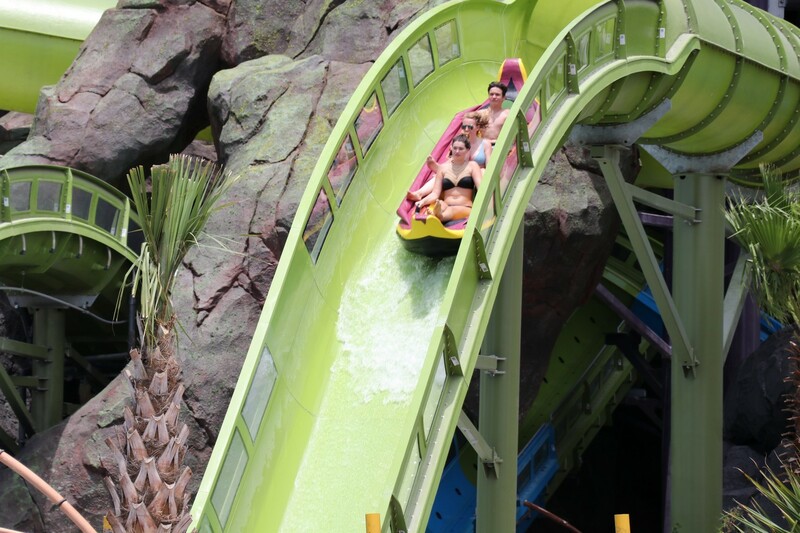 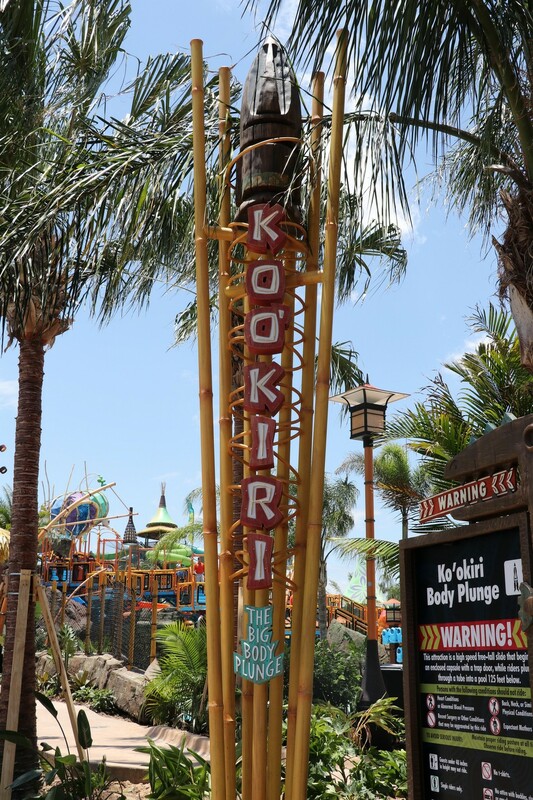 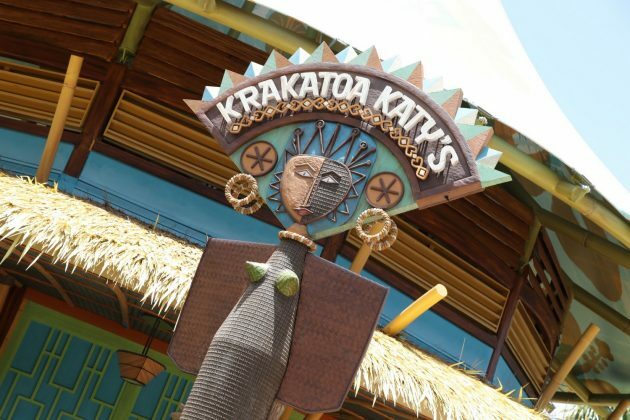 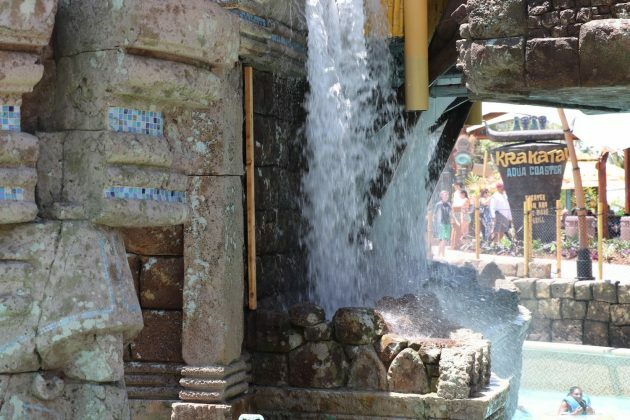 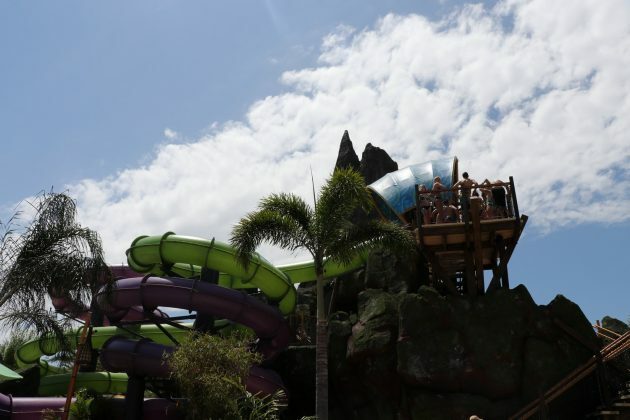 The marquee attractions are the Krakatau Aqua Coaster and the 3 slides located at the top of the Krakatau volcano – Ko’okiri Body Plunge, and the Kala & Ta Nui Serpentine Body Slides. 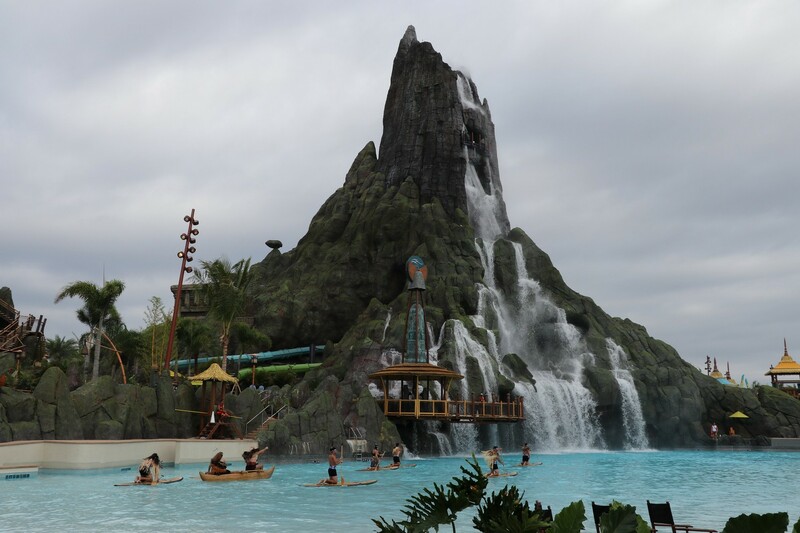 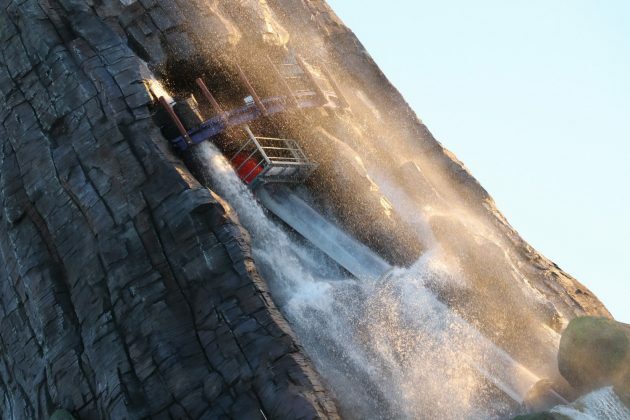 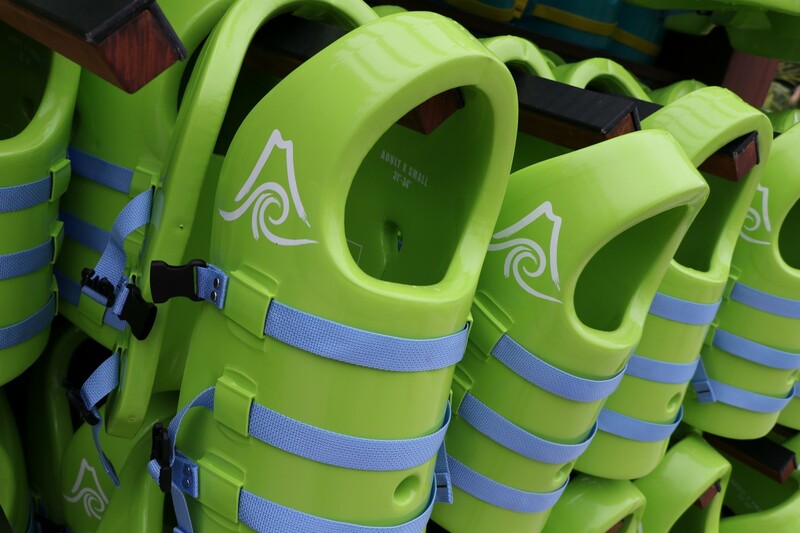 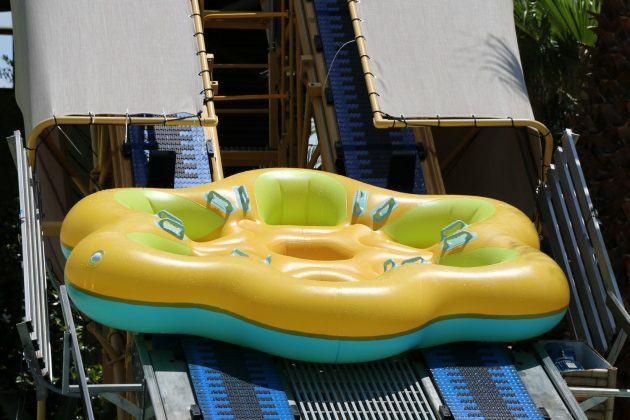 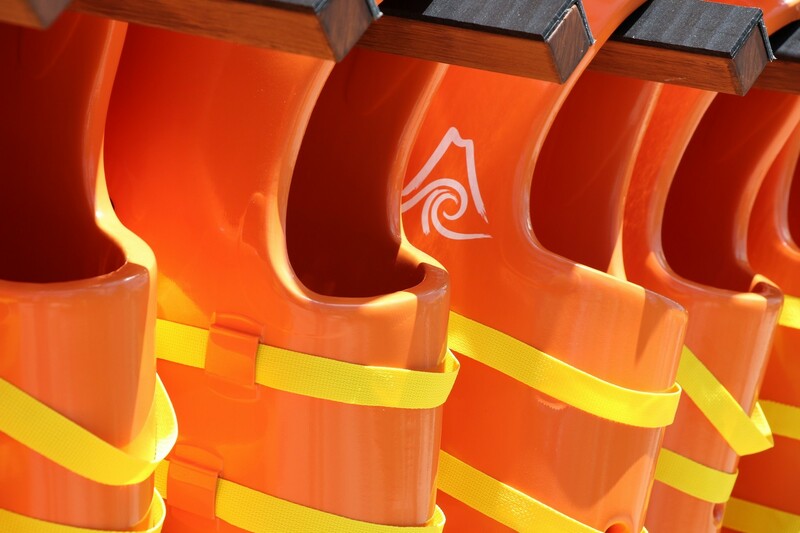 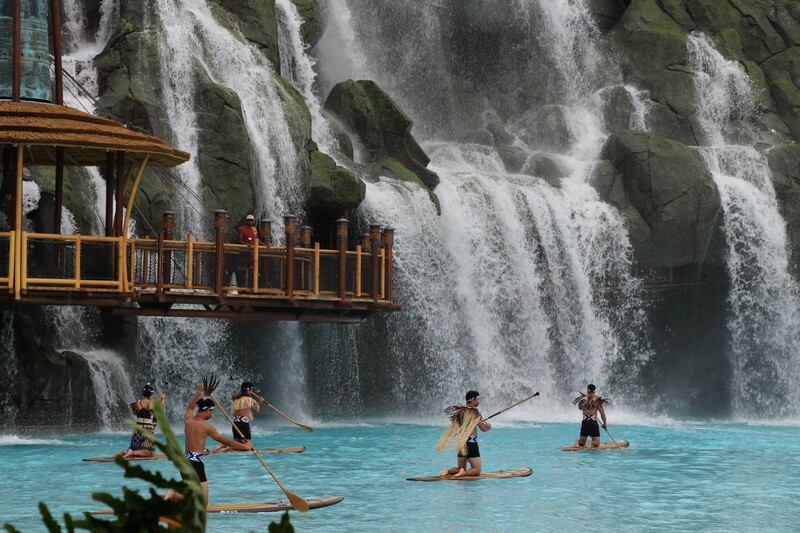 The headlining Krakatau Aqua Coaster features specially-designed canoes and linear induction motor technology that propel you up, down, and around the volcano. Since opening, this has been the attraction with the highest wait and overwhelming favorite. 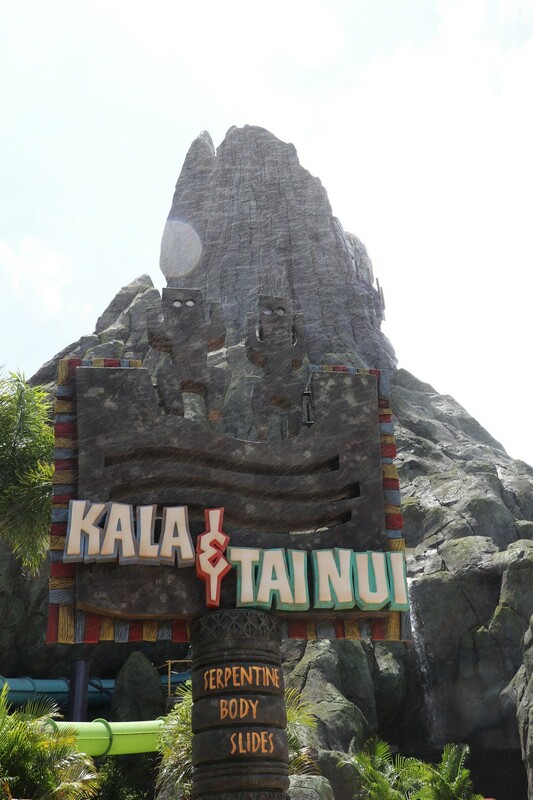 This attraction is an absolute blast! 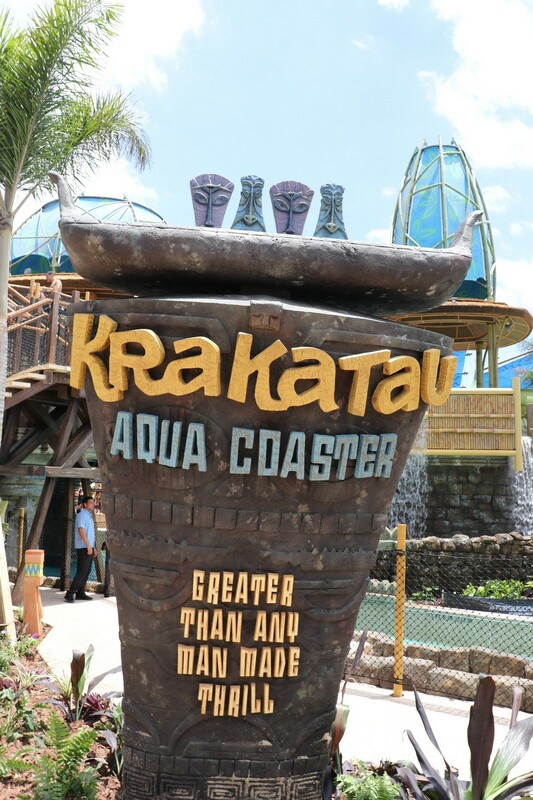 If there is one attraction you have to wait for, wait for the Aqua Coaster. 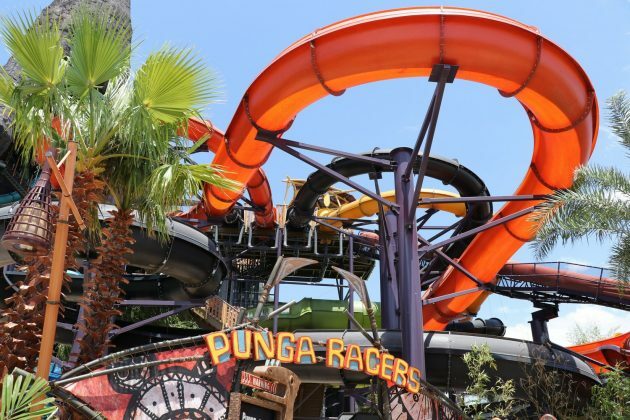 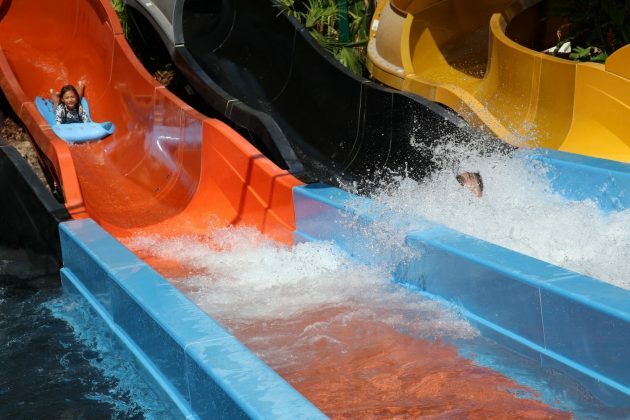 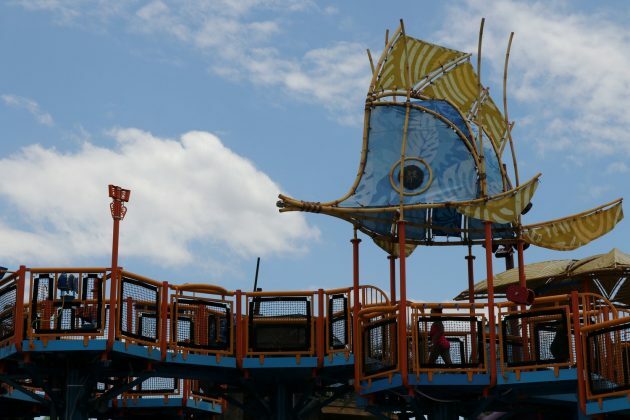 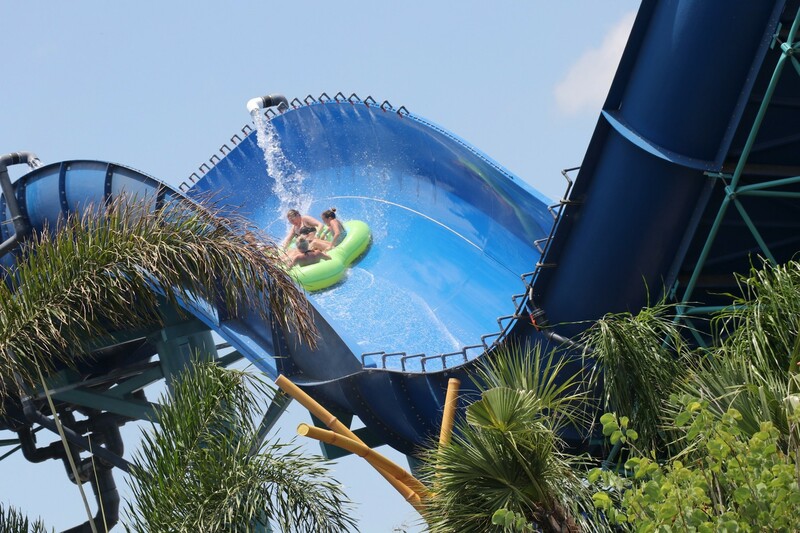 With its fun dips in the open air, and tight turns in enclosed spaces as you weave around Krakatau, the aqua coaster will leave you smiling ear to ear. 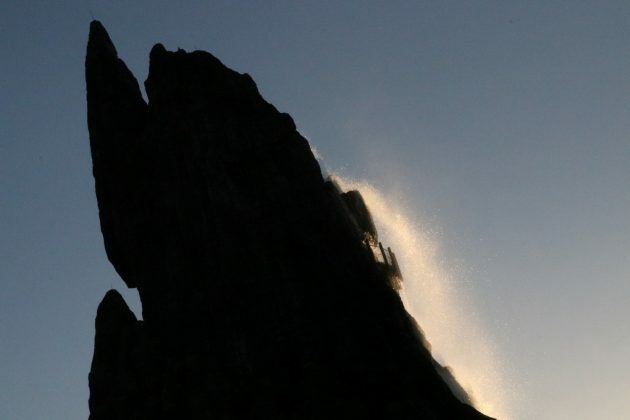 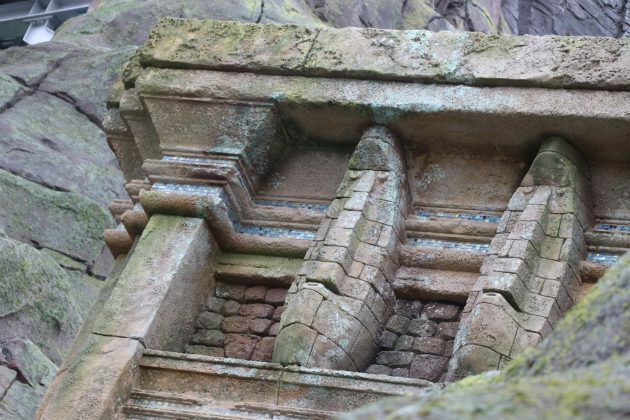 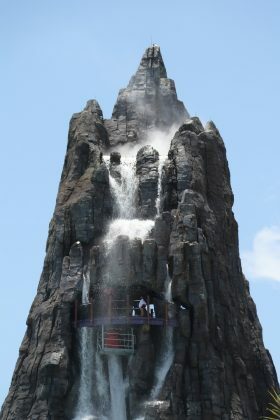 At the top of Volcano are the 3 trap-door body slides. 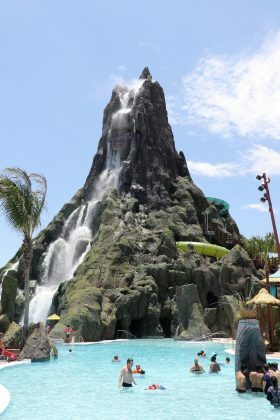 We opted to ride Ko’okiri Body Plunge, the slide that drops you straight down the heart of the volcano and into the pools immediately below. 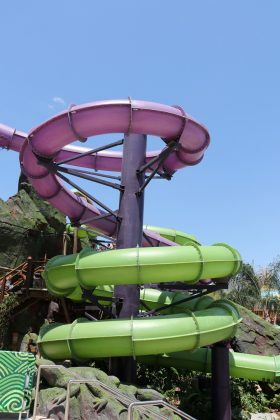 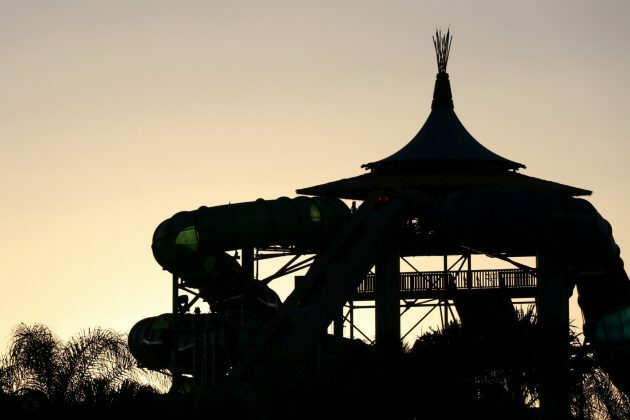 The slide drops guests 125 feet at a 70 degree angle through a clear tube where guests in wadding in Waturi Beach can spectate as you make your descent. 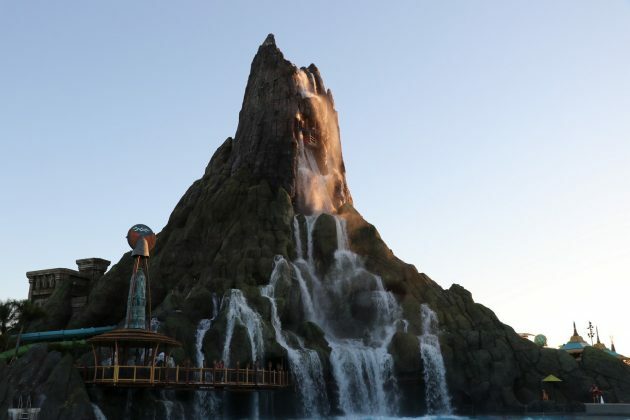 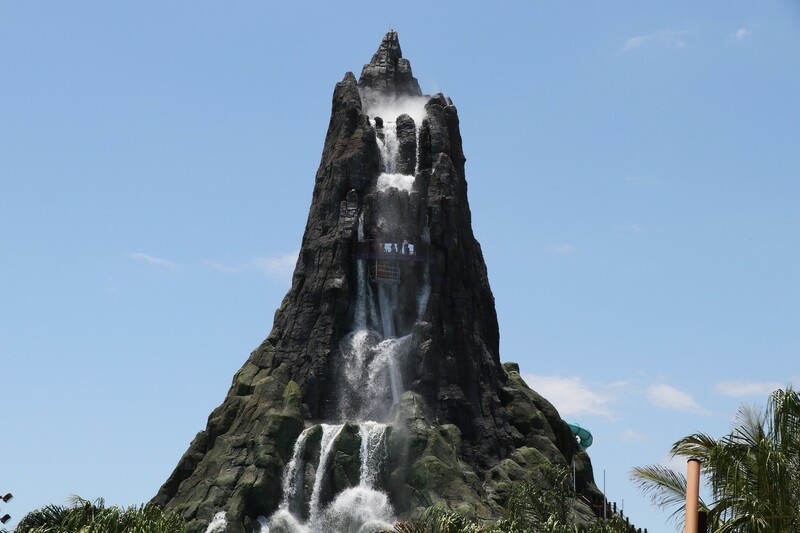 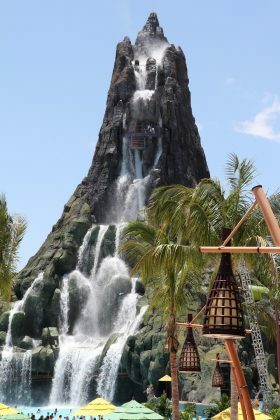 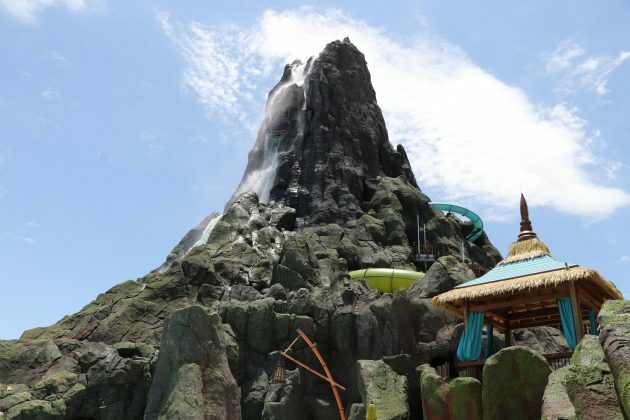 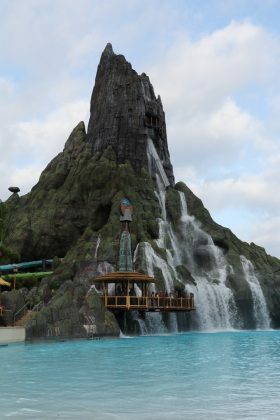 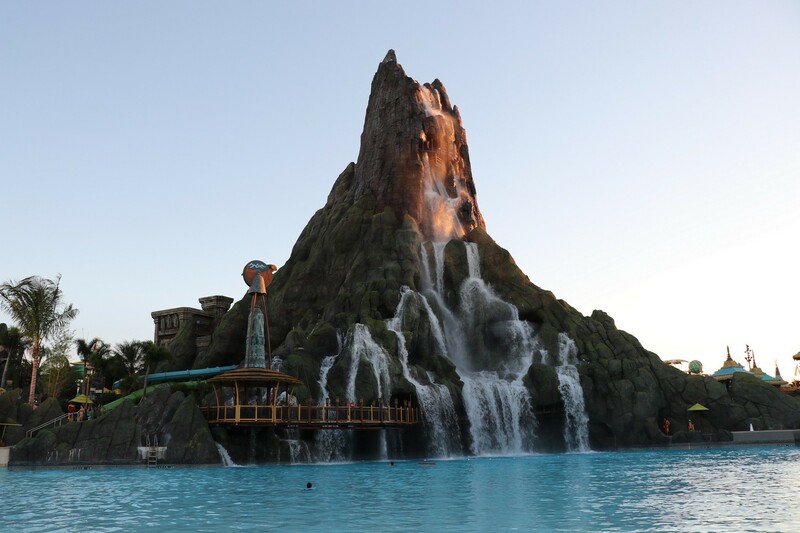 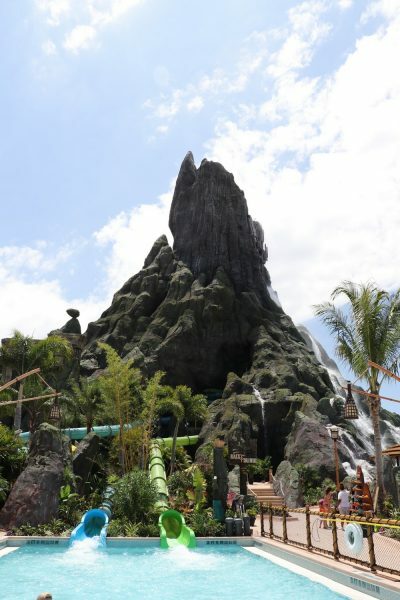 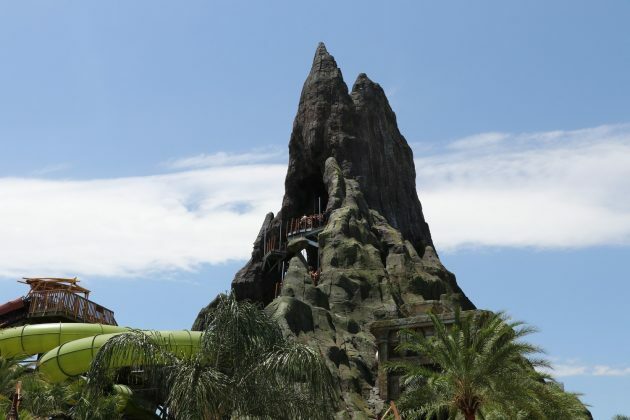 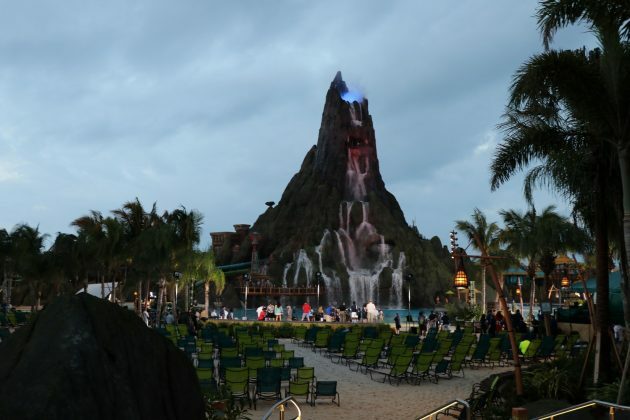 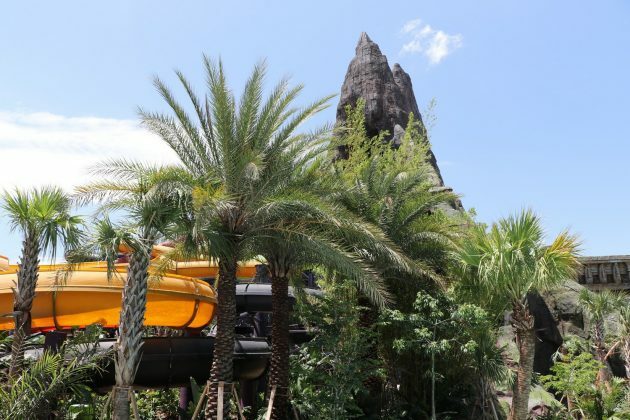 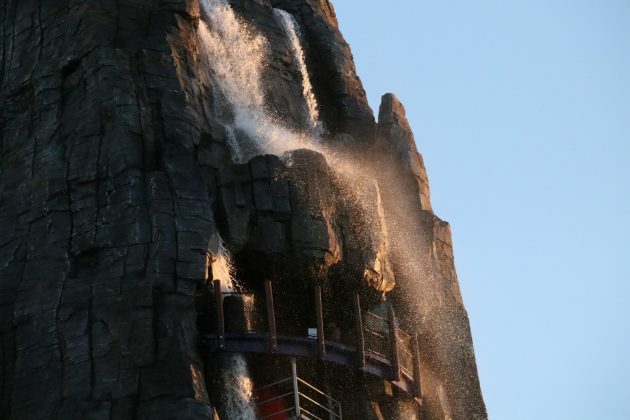 While waiting, the view from the top of Krakatau is stunning; seeing the surrounding park, as well as the rest of the Universal Orlando Resort and surrounding attractions. 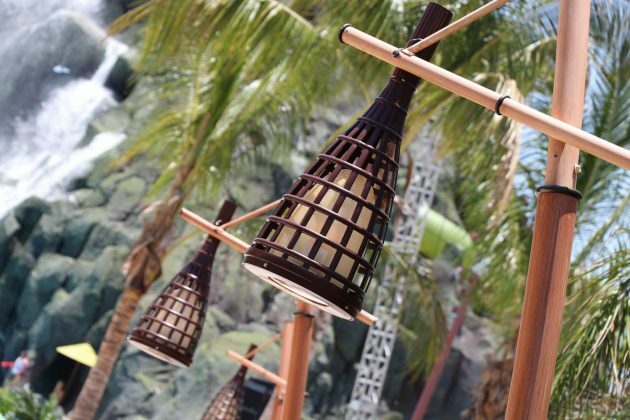 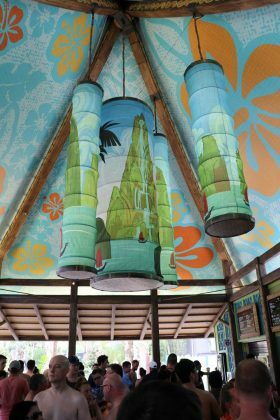 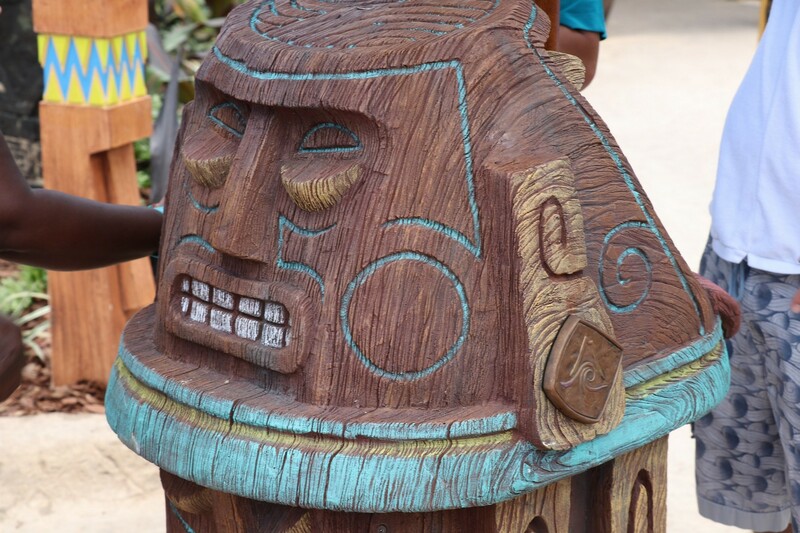 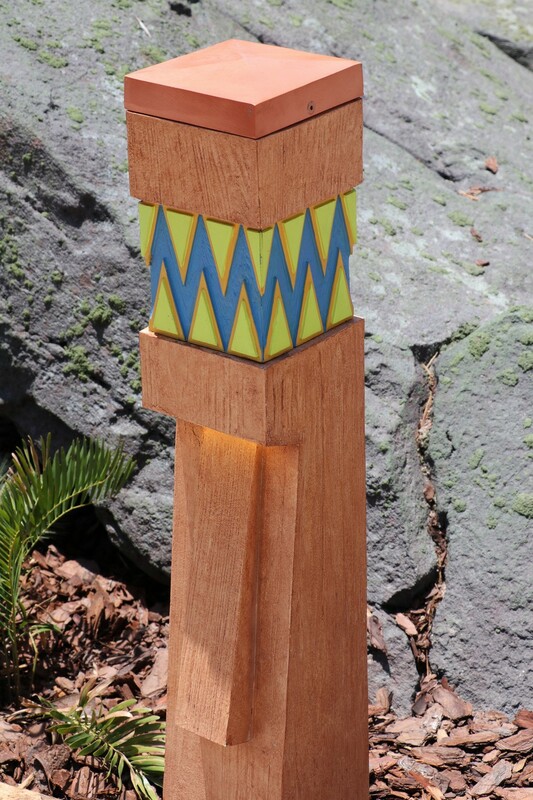 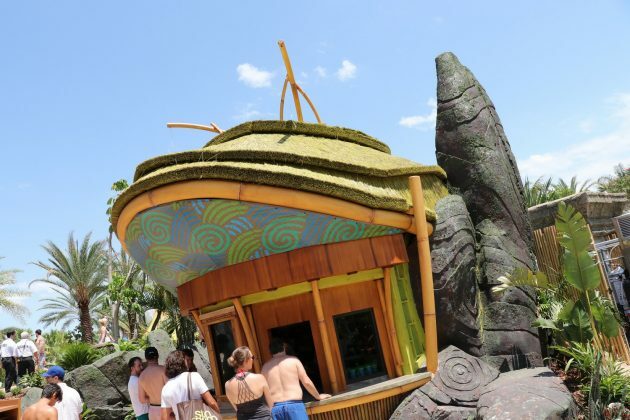 As you make your way into the drop capsule, tiki drums begin to play faster and faster, elevating your heart rate as you wonder when the door below will open and send you plummeting back to solid ground. To be honest, all the slides we experienced at Volcano Bay were great. Some were exhilarating, and some were just plain fun; but all together gives Volcano Bay a stellar attraction line-up. The Ohyah and Ohno Drop Slides were personal favorites of mine, with a slight favor to the Ohno slide as it features a higher drop into the water. 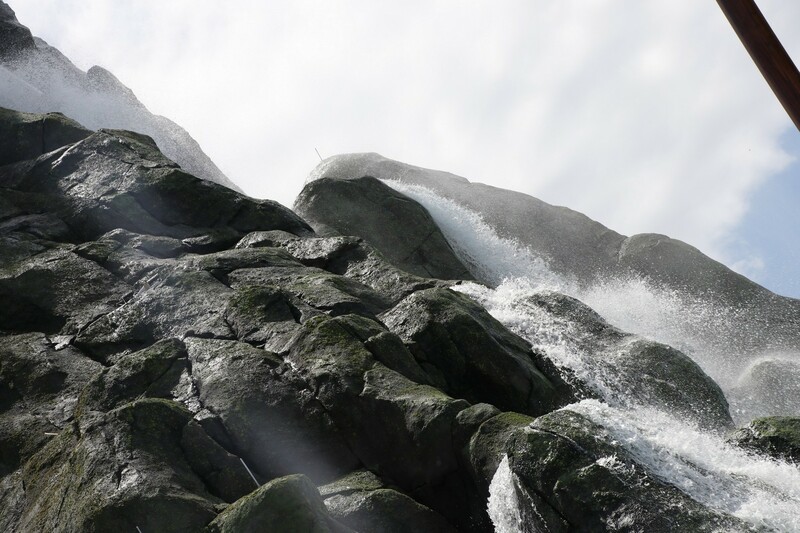 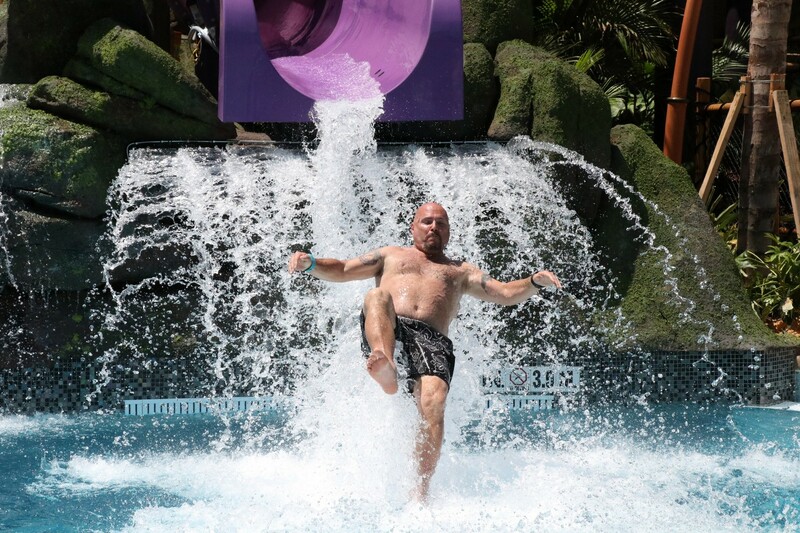 I do need to stress this point, but if you are not a strong swimmer – DO NOT go on these drop slides. 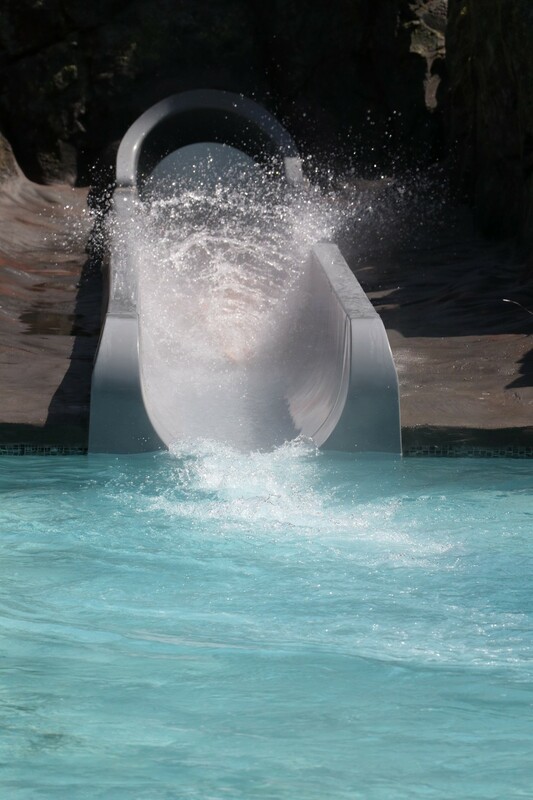 You are dropping 3-6 feet from the slide into a 10 foot pool, with about 10 feet to the stairs to get out. 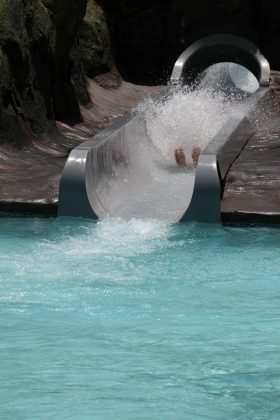 If you feel you cannot do this, do not slide! 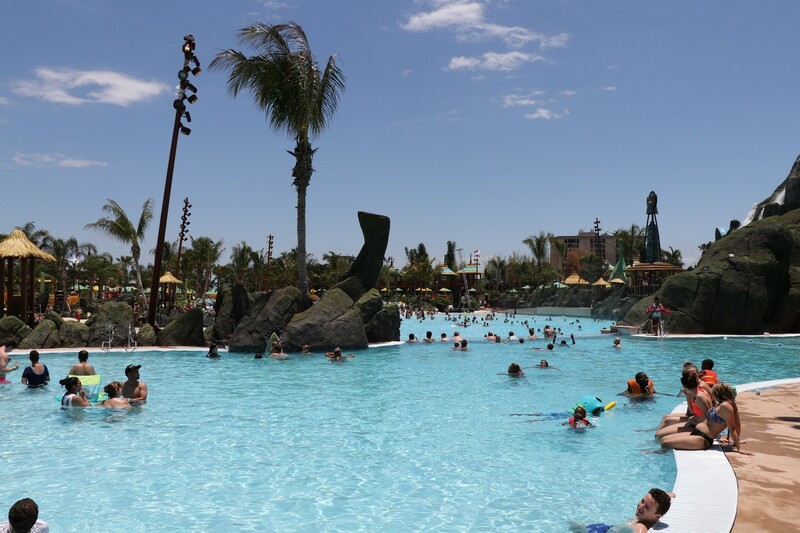 The Waturi Beach and wave pool is a great break from the slides, and offers guests a chance to relax on the sandy beach. 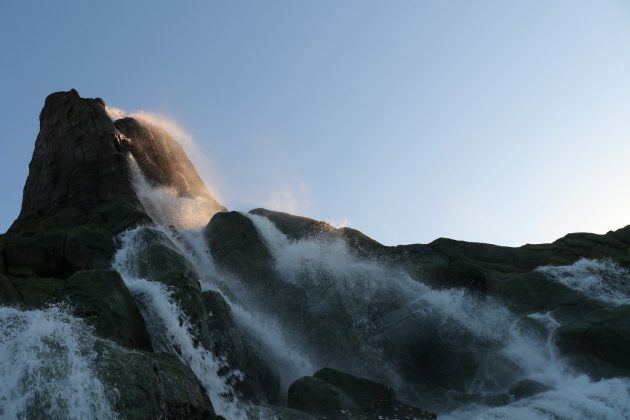 You can also sit on the shore line, enjoying the break of the waves; or get right in the thick of it and swim with the choppy waves. No answer is the wrong one. Of course, the big selling point of the beach is the view of Krakatau – it never gets old. 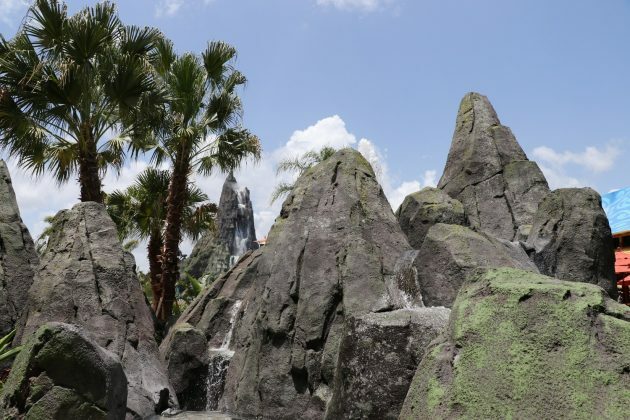 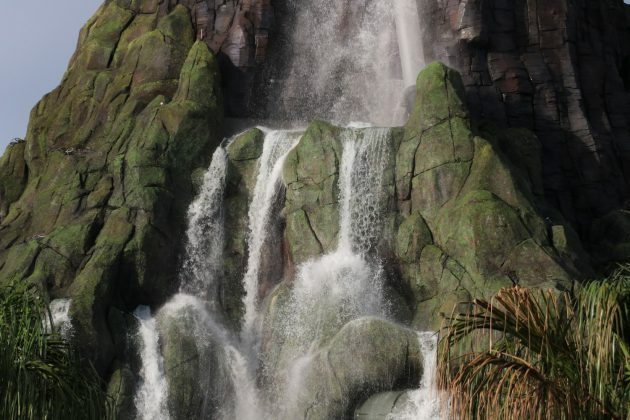 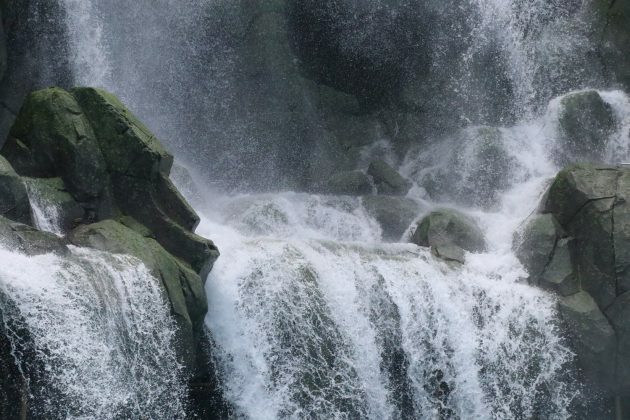 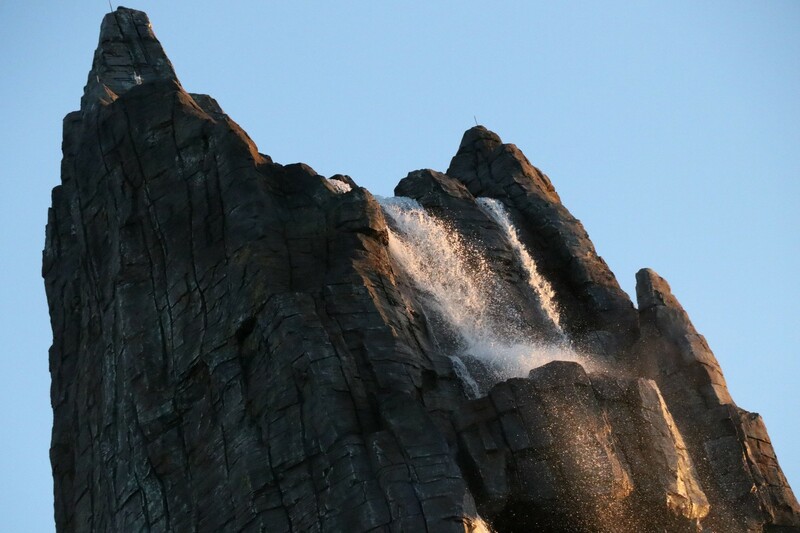 From the misty vent at the top, to the beautiful cascading waterfalls, there is no better view in any of the Orlando parks. 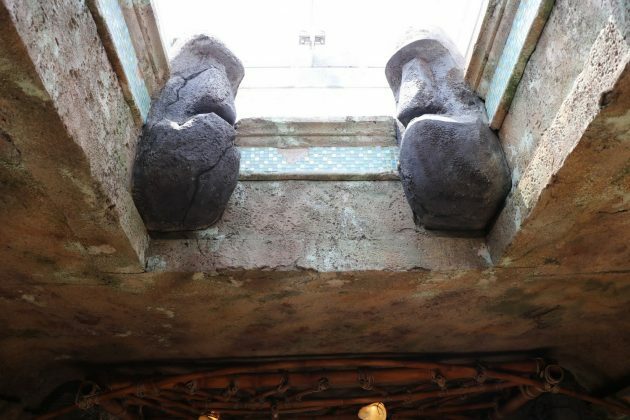 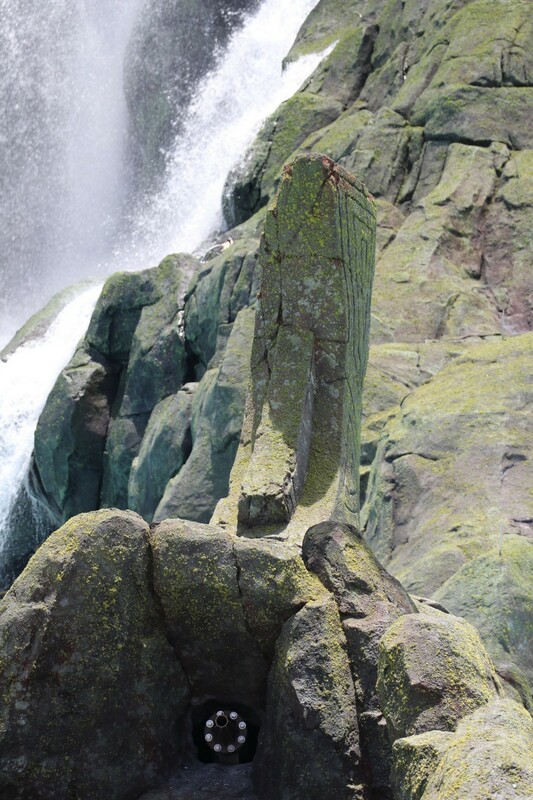 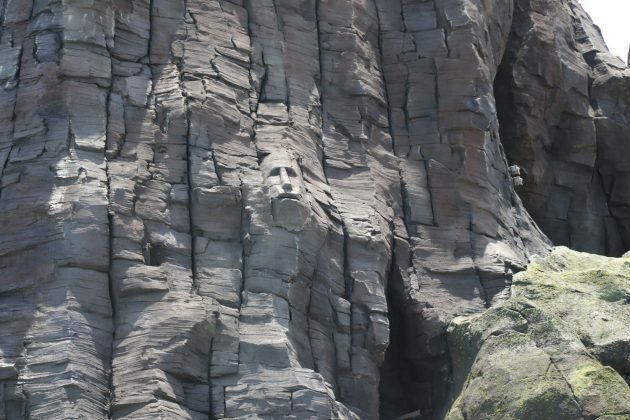 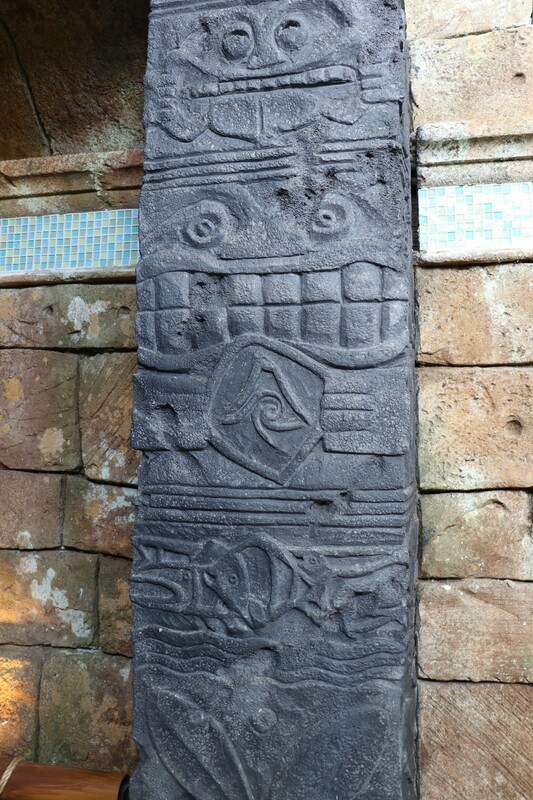 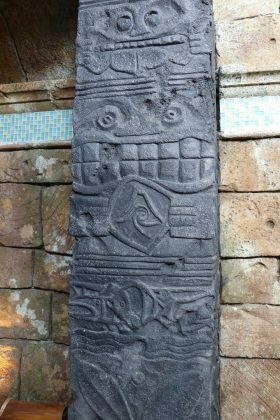 The design on Krakatau is exceptionally done, as you’ll be able to spot many tiki faces carved into the rocks, either subtly or prominently. A huge walkway jets out over the wave pool, that offers great views of the surrounding beaches and water. 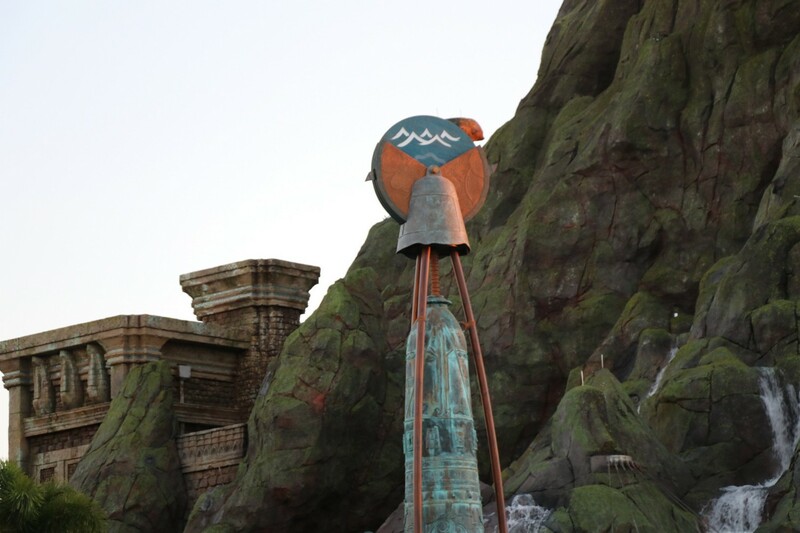 As of now, it’s not completely open; but still offers a nice scenic detour for the time being. Make sure to pay attention to the bell to the bottom left of Krakatau. 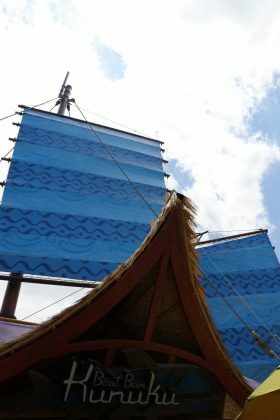 This neat little feature tells you what kind of waters to expect, whether it’ll be calm or high waves. If you want to avoid the waves completely, The Reef offers a more relaxing experience. 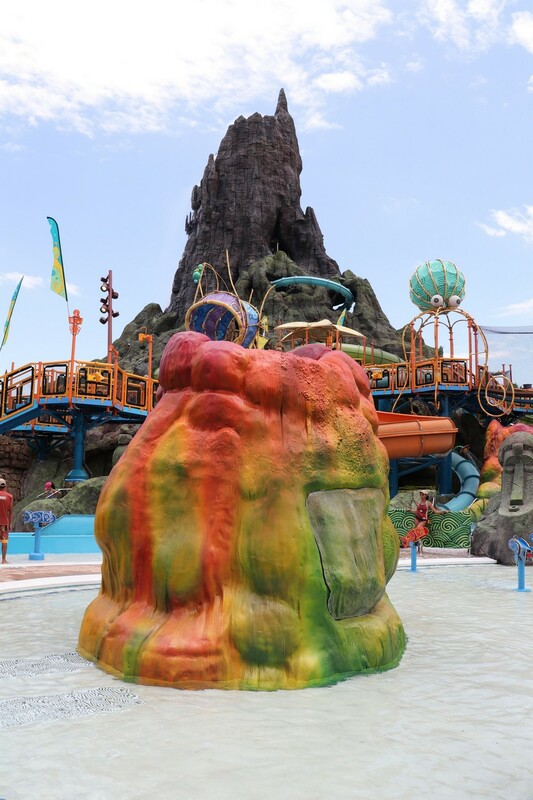 It also gives you a chance to see guests braving Ko’okiri, as there is a viewing area of the clear tube that divides the Reef from the Waturi Beach, which offers a sort of “Infinity Pool” view. 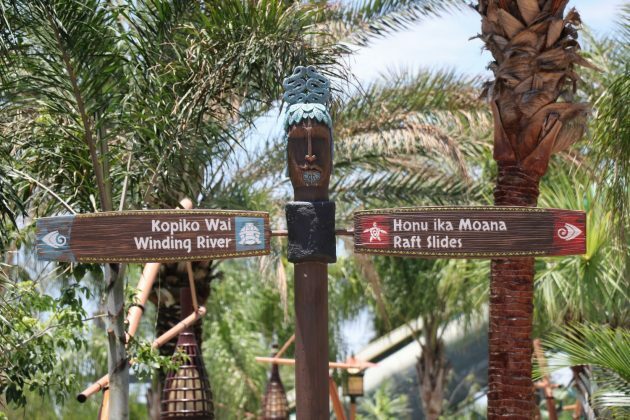 If there is one thing we have to be critical of, it’s the 2 rivers; Kopiko Wai Winding River and TeAwa The Fearless River. 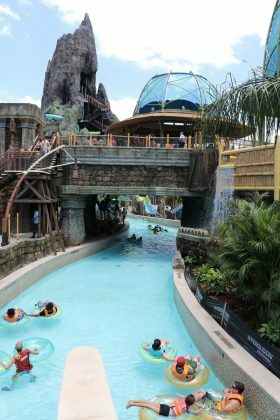 First, TeAwa the Fearless River is a fast-paced, wavy, lazy river where guests must be in a tube or life vest at all times. The Kopiko Wai Winding River is your traditional, calm, lazy river. The problem isn’t exactly with the rivers themselves, but the views. 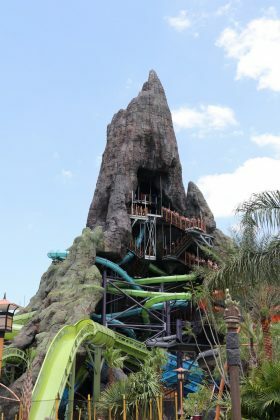 TeAwa goes right into the underbelly of Krakatau; the only problem is the backside of volcano isn’t as grandiose as the front – which means as you float on through underneath, you’ll be seeing pipes, beams, and supports of the surrounding slides. 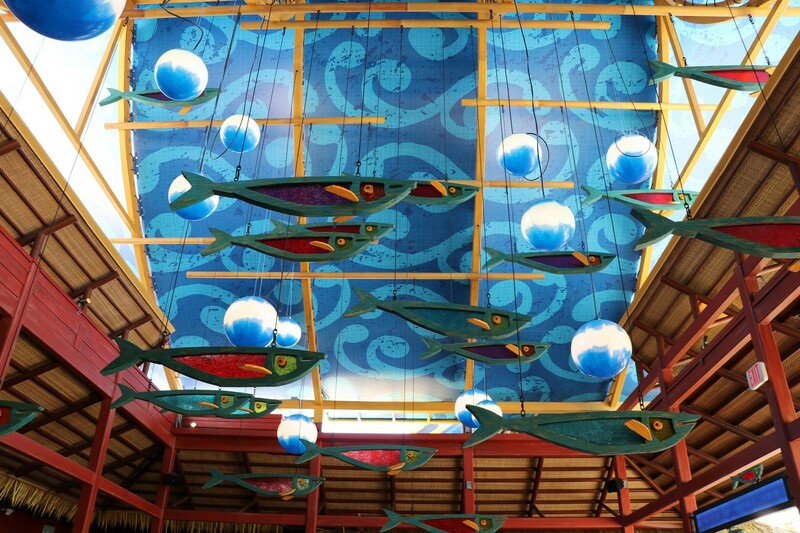 Kopiko Way’s issue isn’t as big, but more so due to creating the concept art into reality. 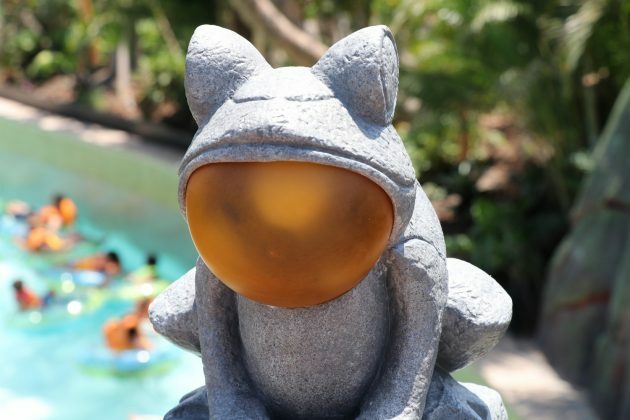 The Stargazer Cavern was a huge selling point for many, including yours truly. 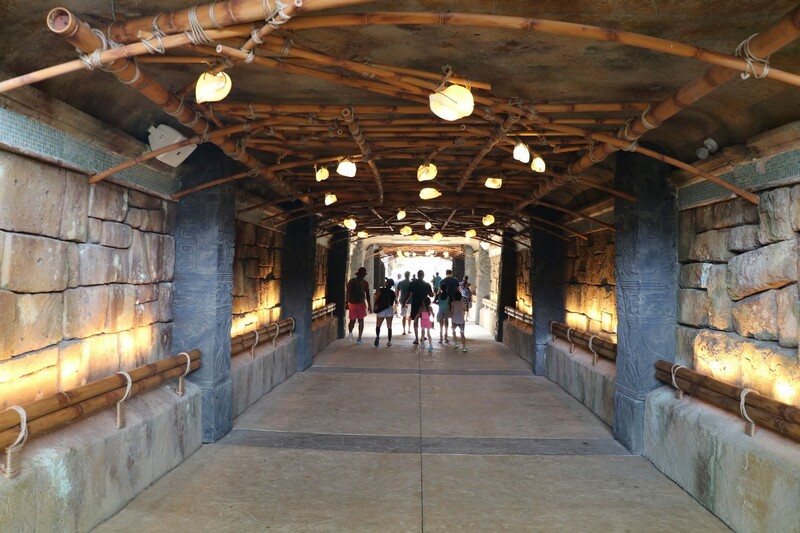 As you enter the cave, the cavern isn’t as cavernous as the concept art showed, and the glowing “star” effect has yet to be finished. 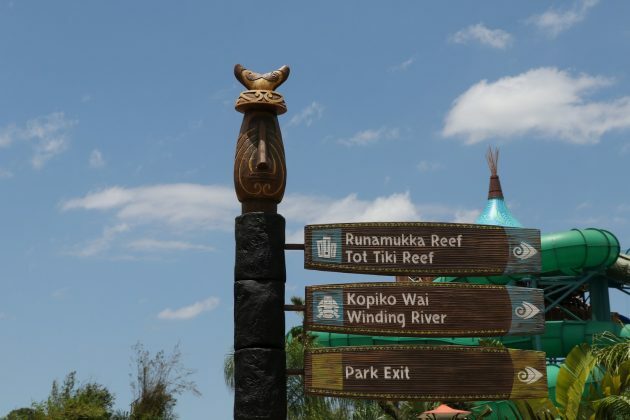 I have no doubt Kopiko Way Winding River will look better once that effect is complete, but we hope there is a plan to fix the views for TeAwa. 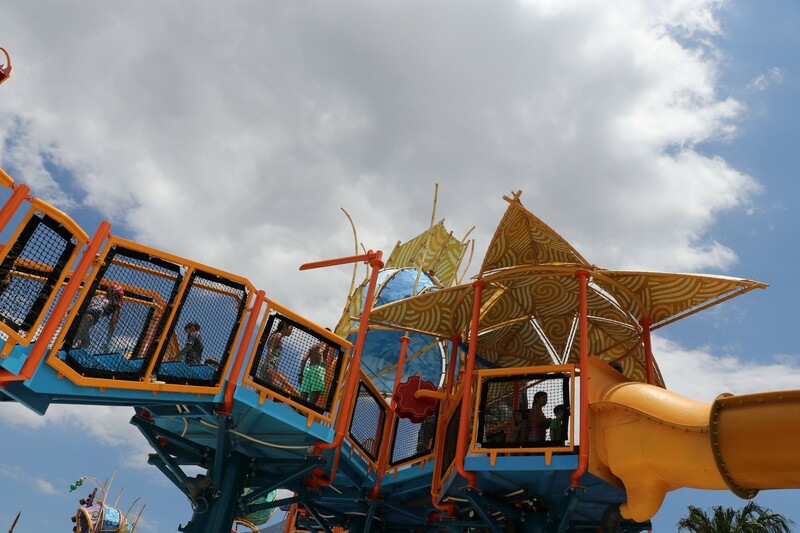 While we didn’t really get a chance to play in the kids area, being adults and all, it looked like kids will find themselves having a great time. 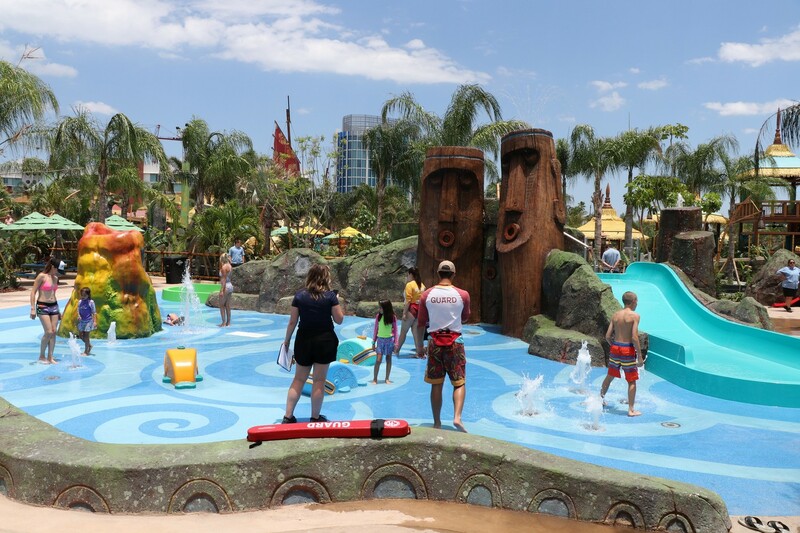 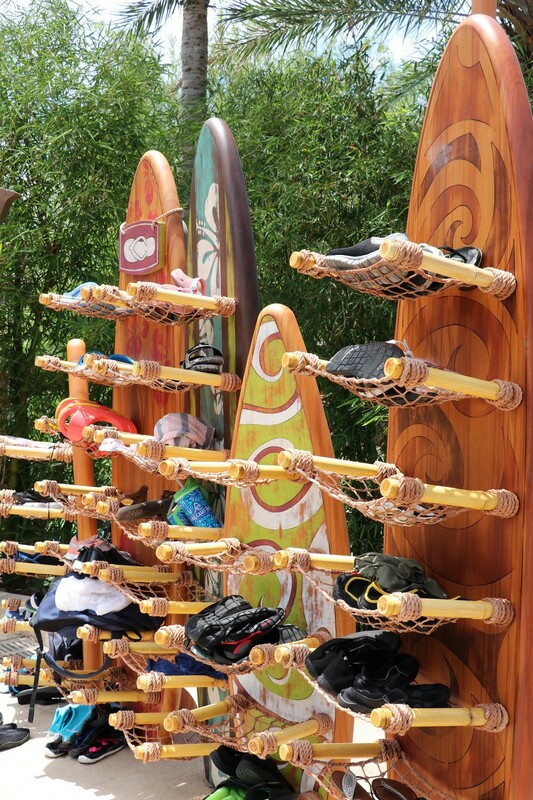 Toddlers have their own play area, called Tot Tiki Reef, which is a good way for them to get acclimated to water park fun. For bigger kids, Runamukka Reef (side note: we feel this is best name for a kids area, ever), offers a huge playground and numerous slides for all ages. 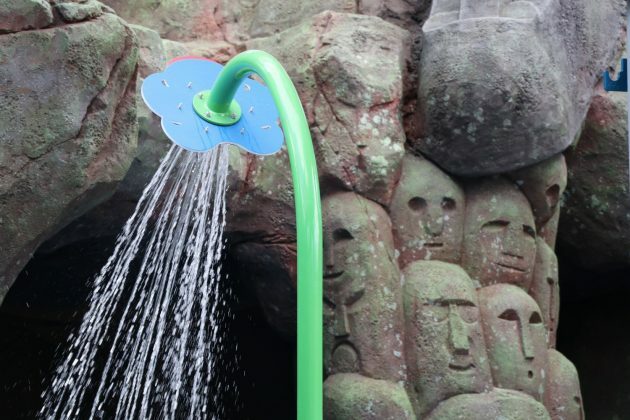 Once more of the TapuTapu interactive elements are working, more adults may find themselves joining along in the fun. 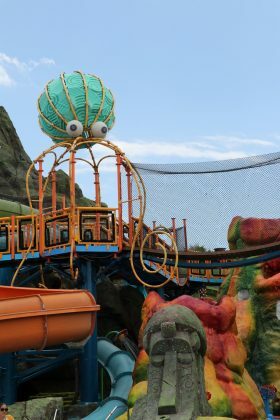 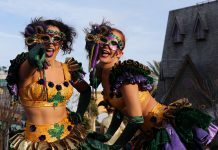 Either way, there are still plenty of opportunities for adults to partake in the interactive fun outside of the kids area; however most of them are still “under construction”. 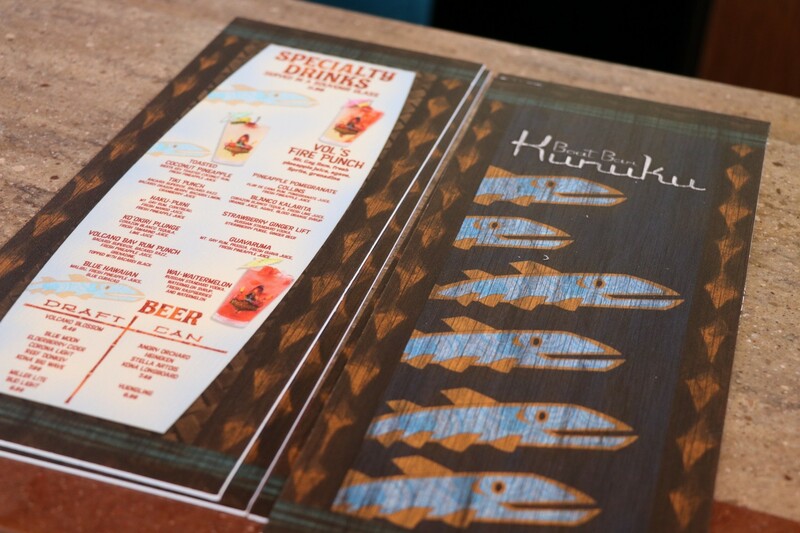 Now let’s talk food and drink! 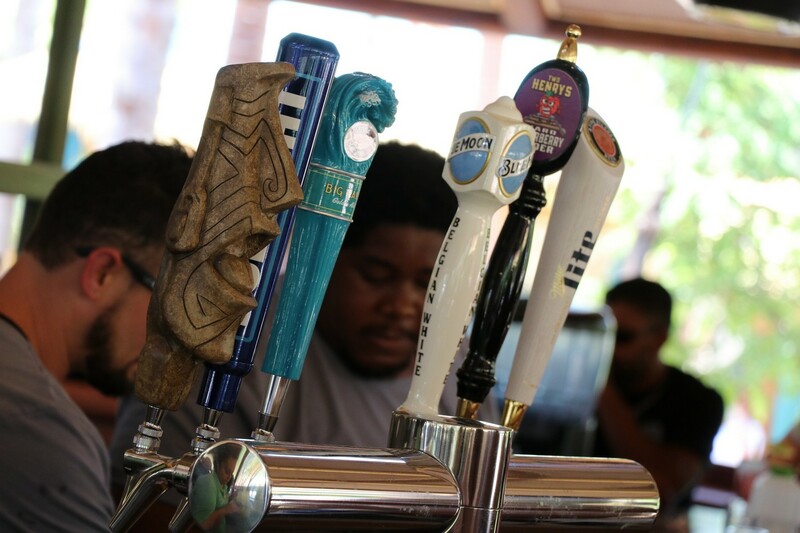 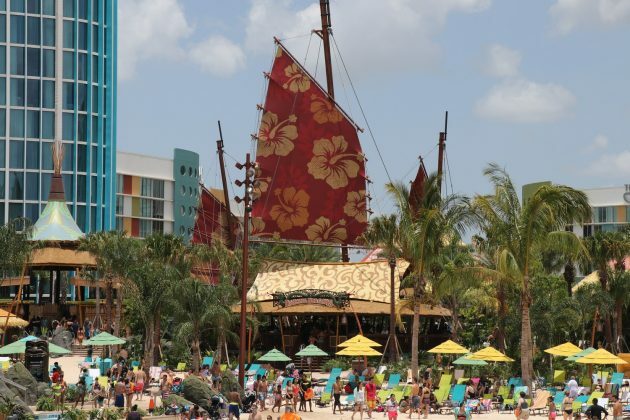 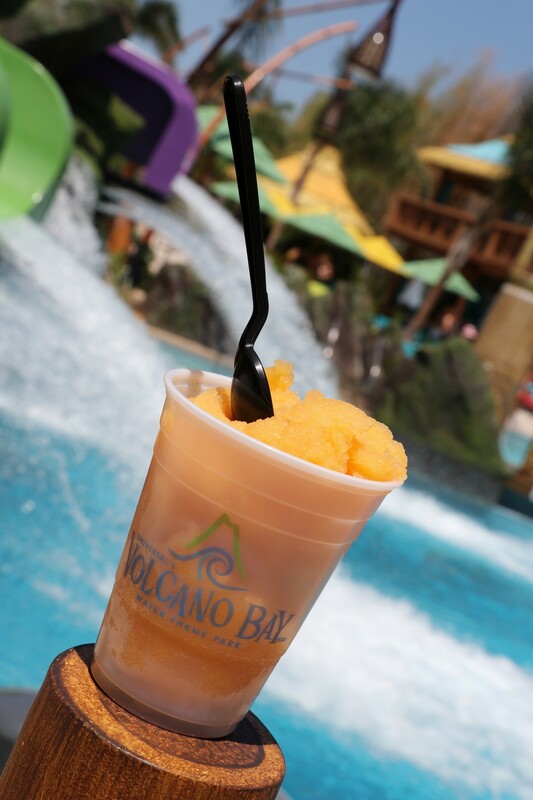 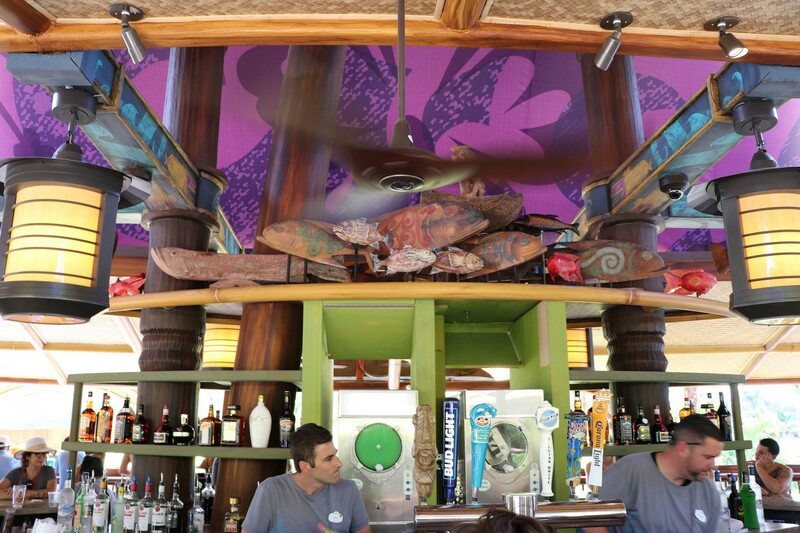 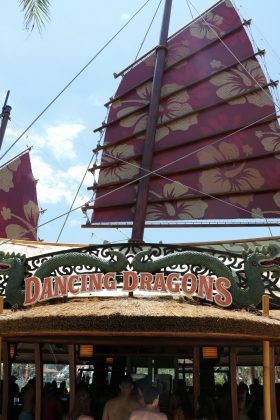 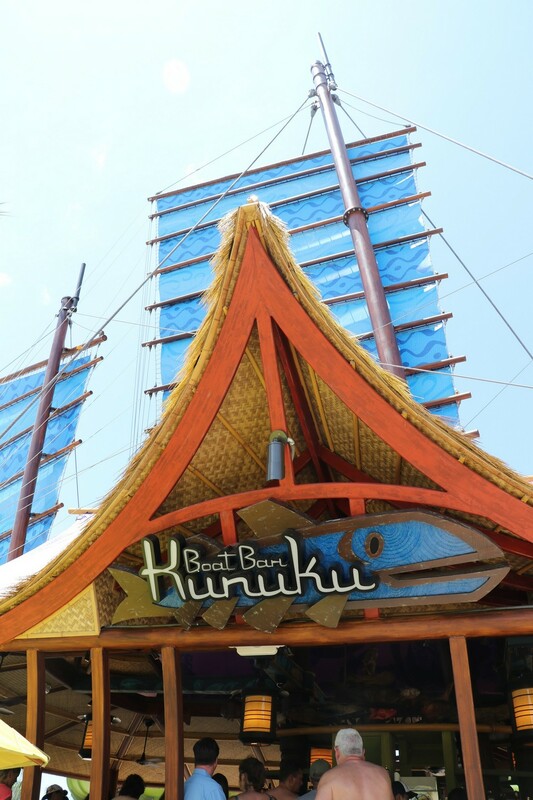 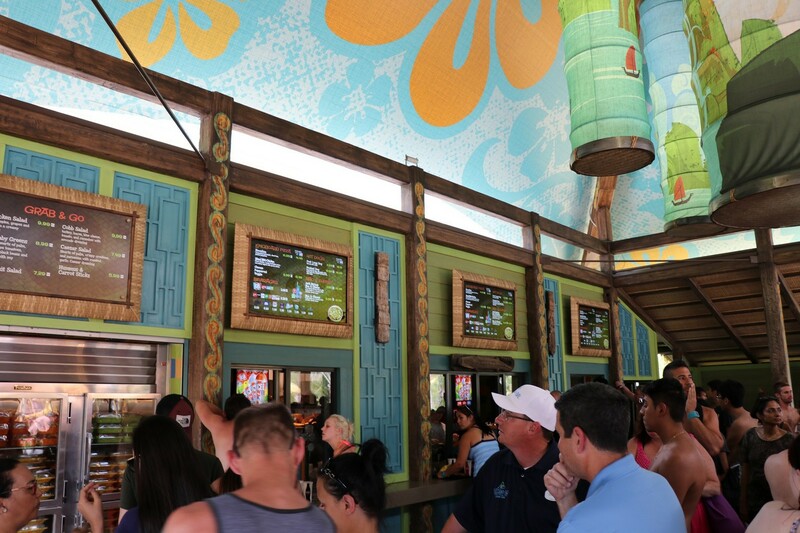 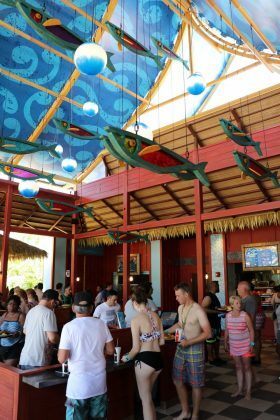 As bar connoisseurs, we enjoyed a few drinks (responsibly) that Volcano Bay’s bars – Dancing Dragons and Kunuku Boat Bar – offered. 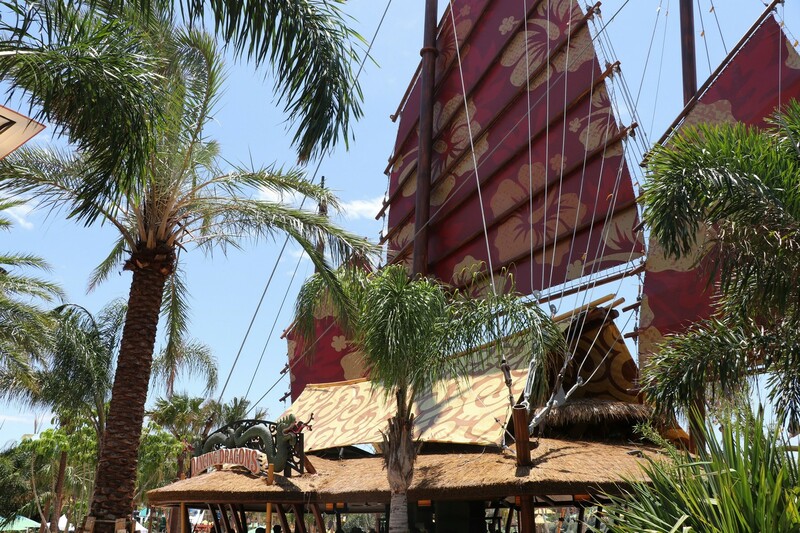 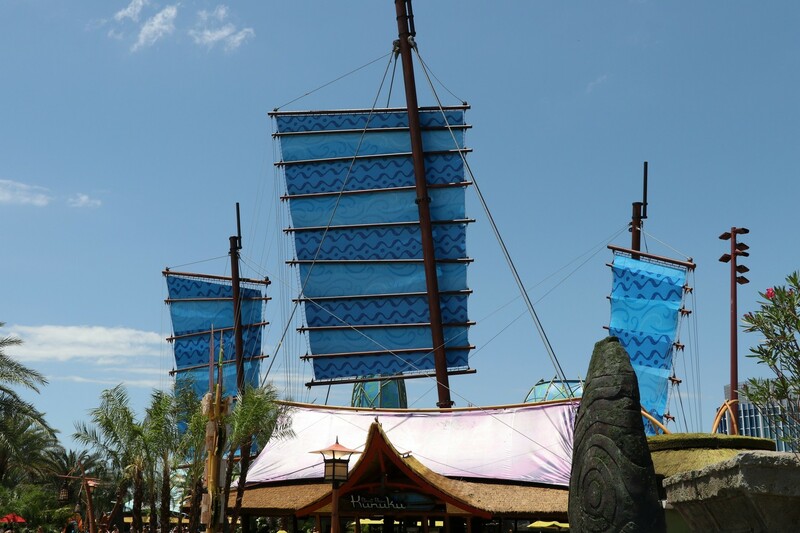 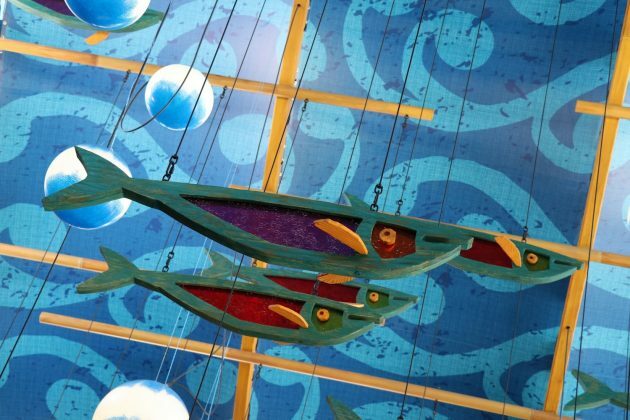 Both bars are themed to boats, with sails reaching in high in the air; but offer the same drink menu. The only differences between both are the colors (Dragons is red, while Kunuku is blue) and themeing (Dragons takes inspiration from the South China Seas, while Kunuku is inspired by the mystical fish). 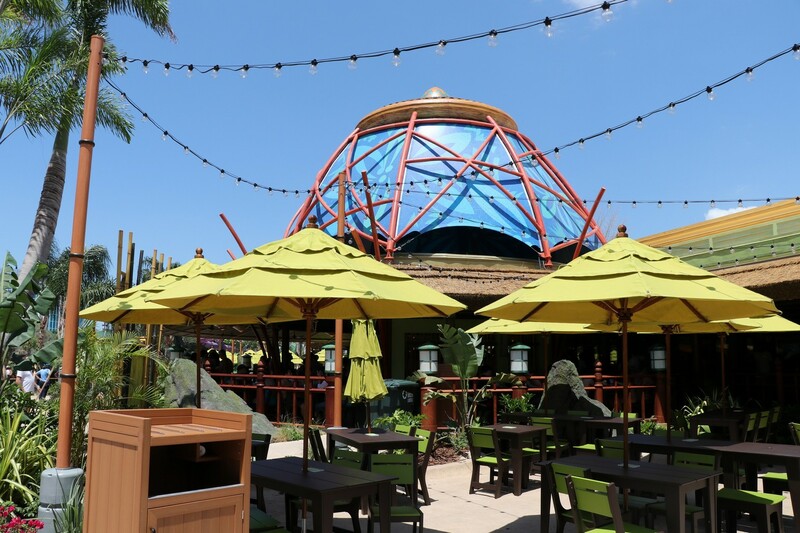 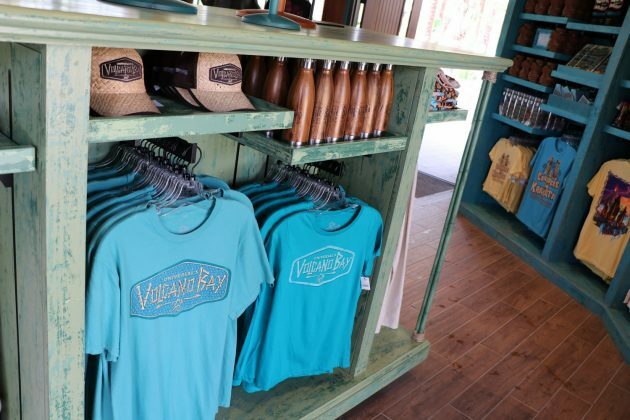 Volcano Bay offers their own pilsner beer, called “Volcano Blossom”, which is brewed exclusively for the park by Orange Blossom Brewing Company. 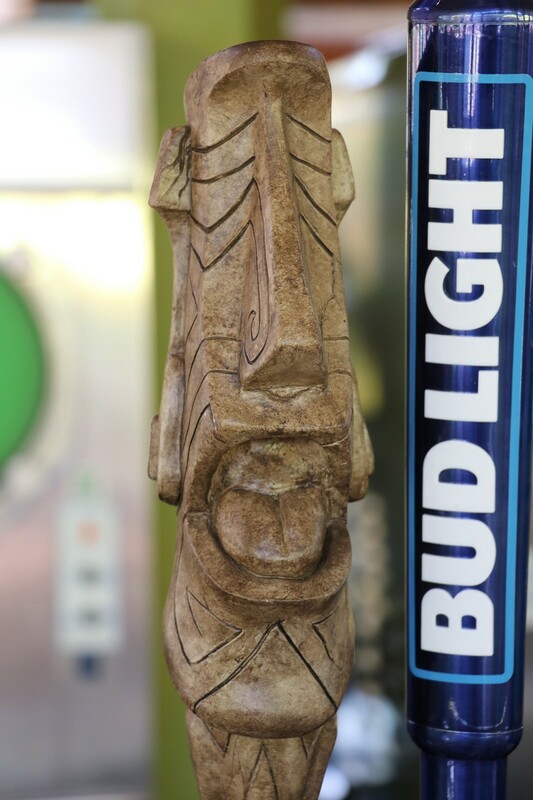 The beer has notes of star fruit and passion fruit; and has really smooth honey and floral taste. 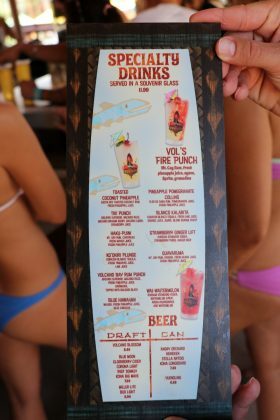 As far as the tropical drinks, the menu features an assortment of fruity, tropical drinks -headlined by their signature drink, “Vol’s Fire Punch”; which includes rum, pineapple juice, agave, sprite, and grenadine. 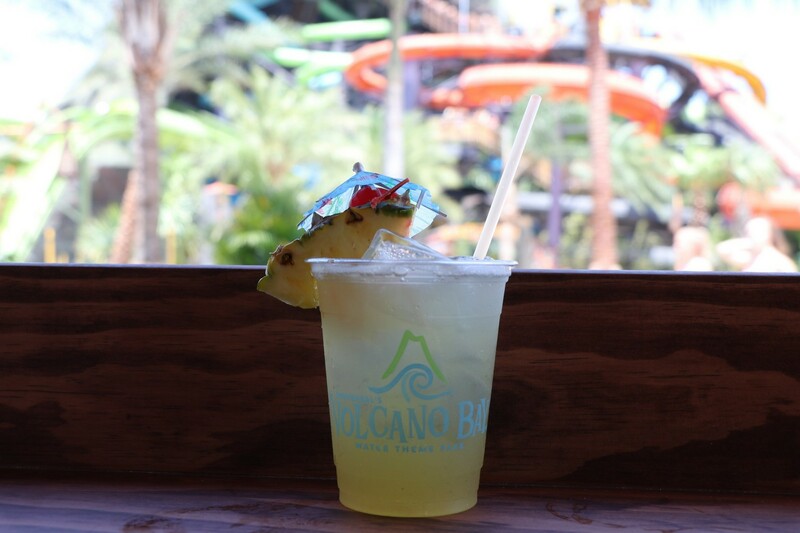 If you want something different, we highly suggest the Guavaruma; which features guava, pineapple, and rum. 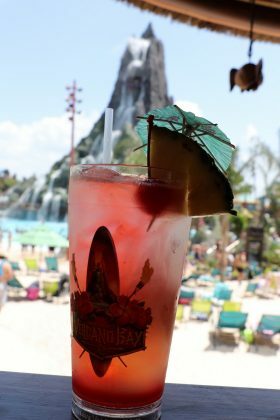 You don’t really see a lot of drinks featuring guava, so we gave it a go and found it quite refreshing. 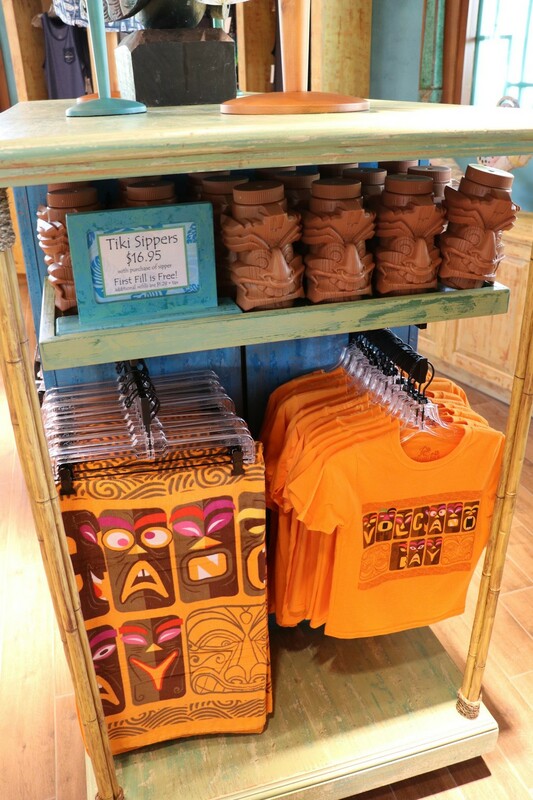 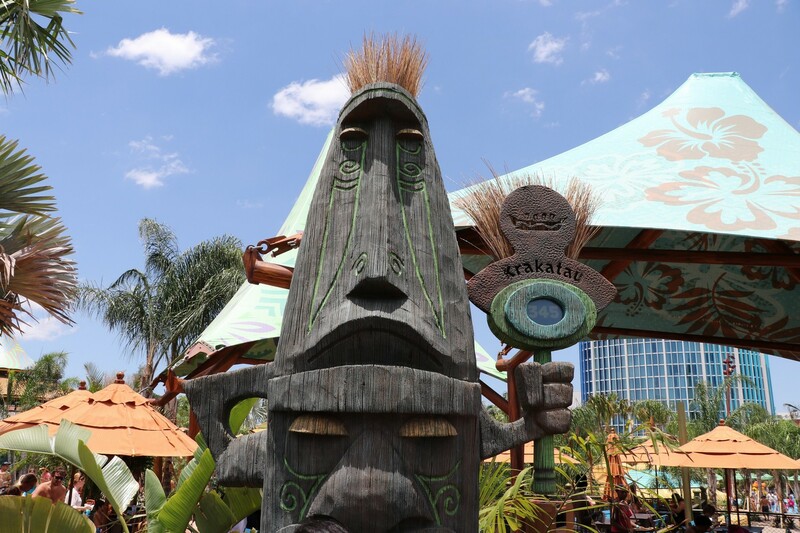 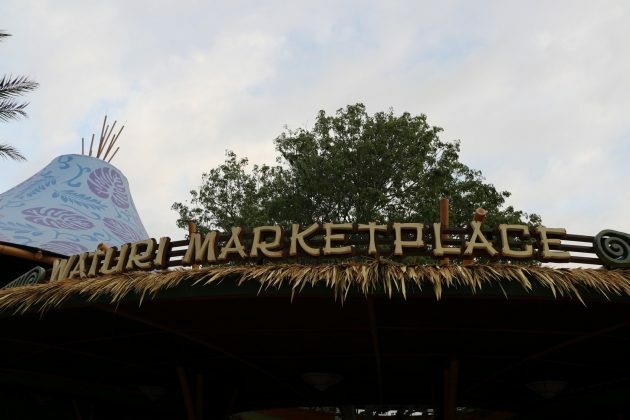 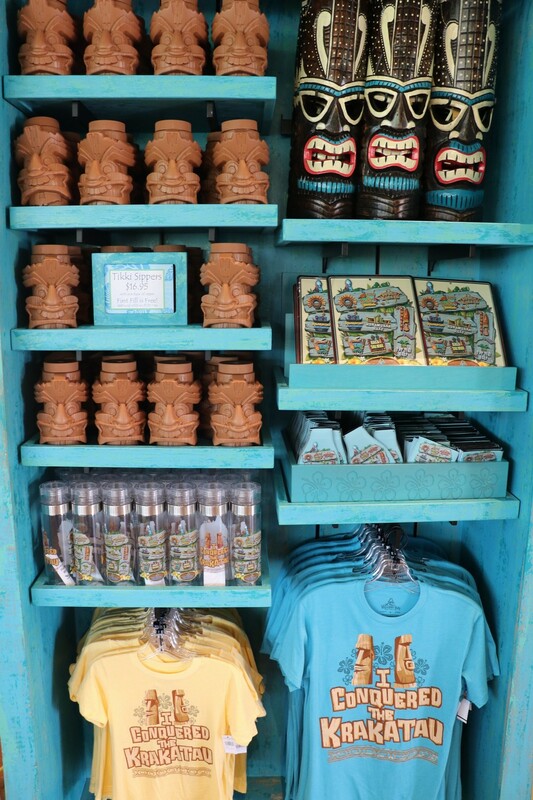 We were a bit surprised to see that a park the feature a presence of tikis – the bars feature no souvenir tiki cups, or traditional tiki drinks. 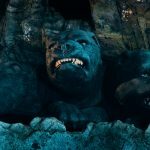 This isn’t really a criticism, just more of an observation. 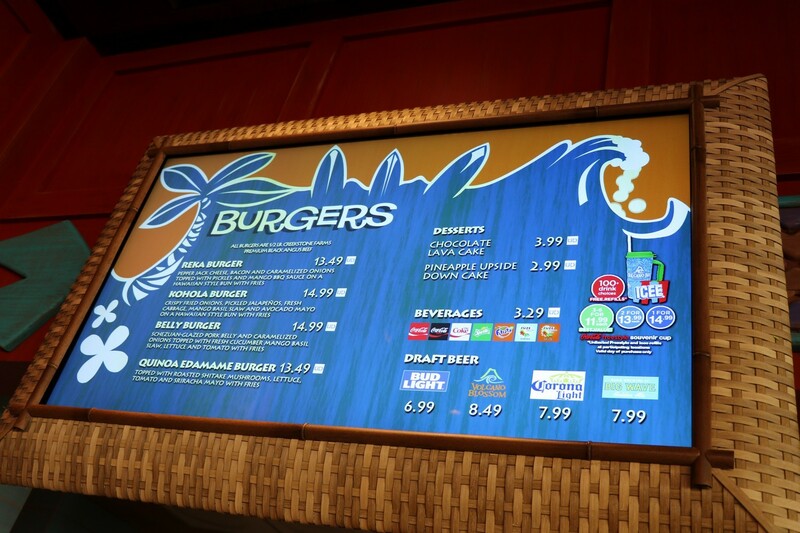 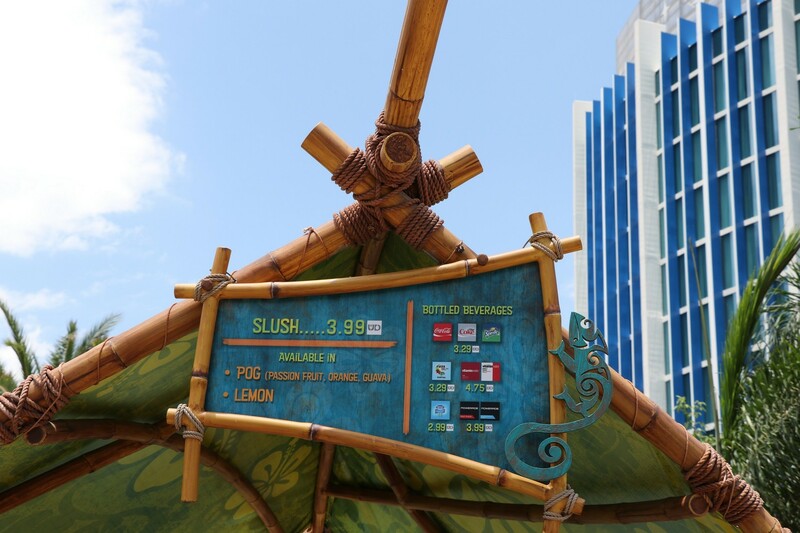 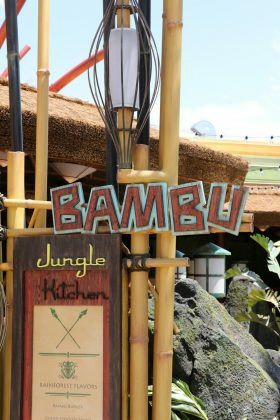 The menu featured at Volcano Bay is probably as unique of a menu you’ll find at a theme park, offering a variety of items that should satisfy any taste bud. 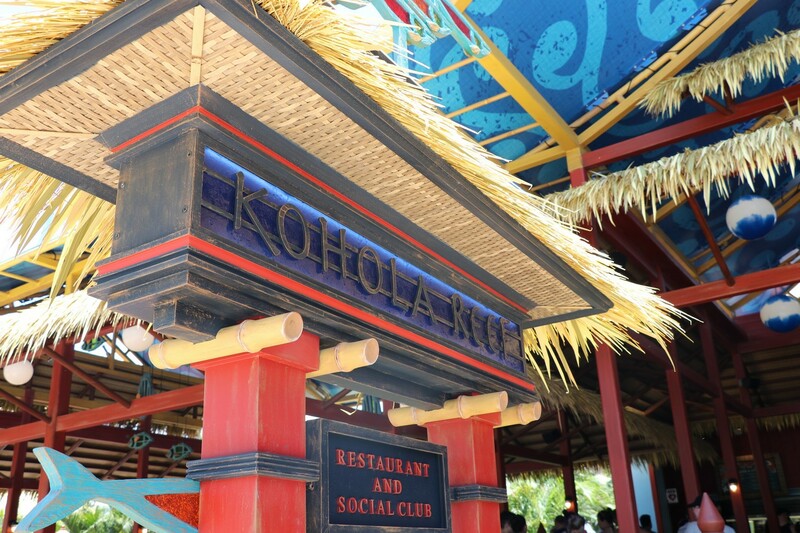 The park offers 4 different restaurants, but we suggest Kohola Reef Restaurant and Social Club for your lunch and/or dinner spot. 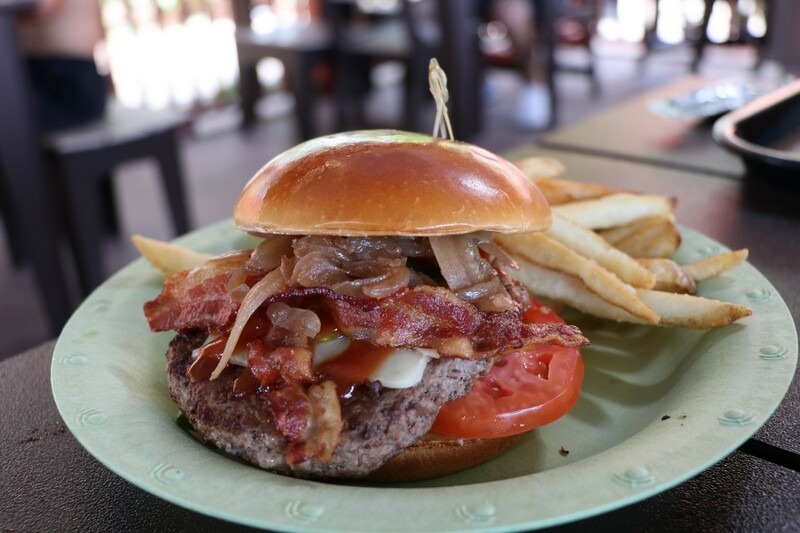 Their menu features BBQ, burgers, chicken, flatbreads, and more – so there is enough of a selection if your party is in the mood for different items. 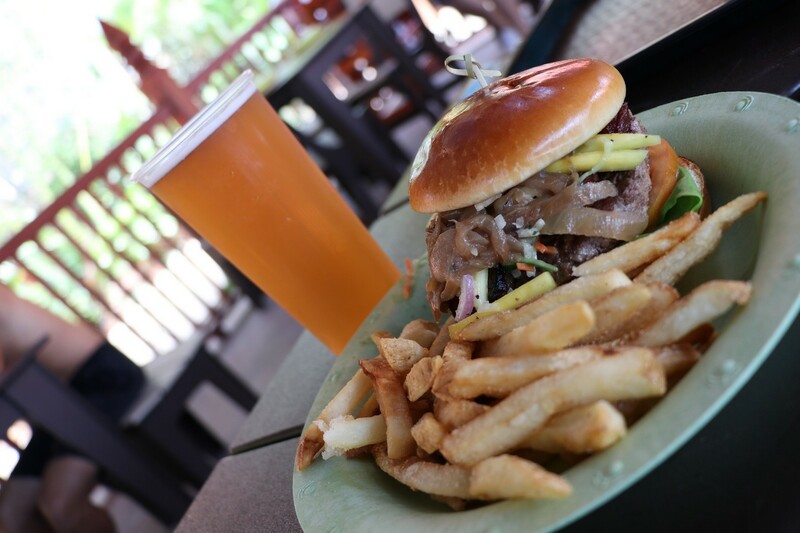 During our first visit, we tried the Belly Burger, the Reka Burger, the BBQ Pulled Pork sandwich, and Grilled Chicken sandwich and were very satisfied with each dish. During our 2nd day, we stopped by the Feasting Frog, which offers tacos. 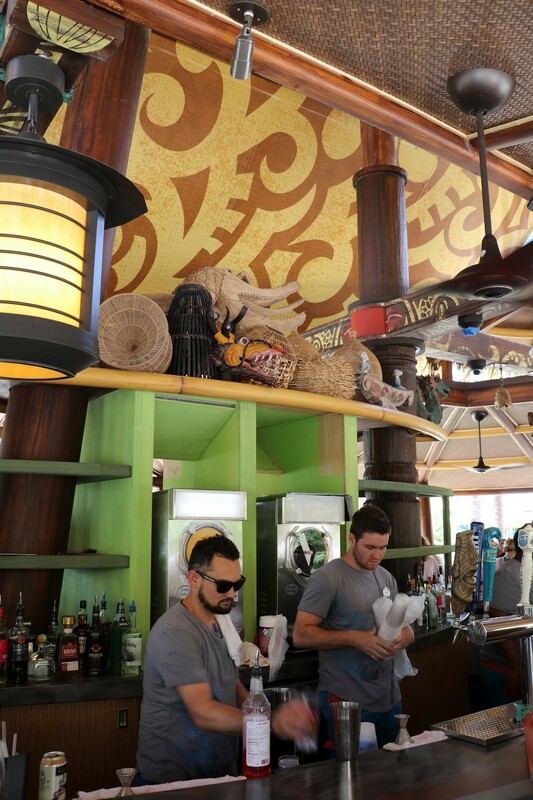 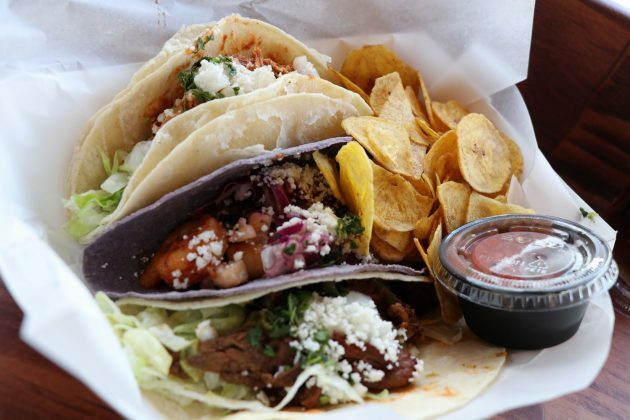 If you’re looking for a quick bite, this is a perfect spot to relax by the bar and enjoy any of the 3 different, delicious tacos they offer. 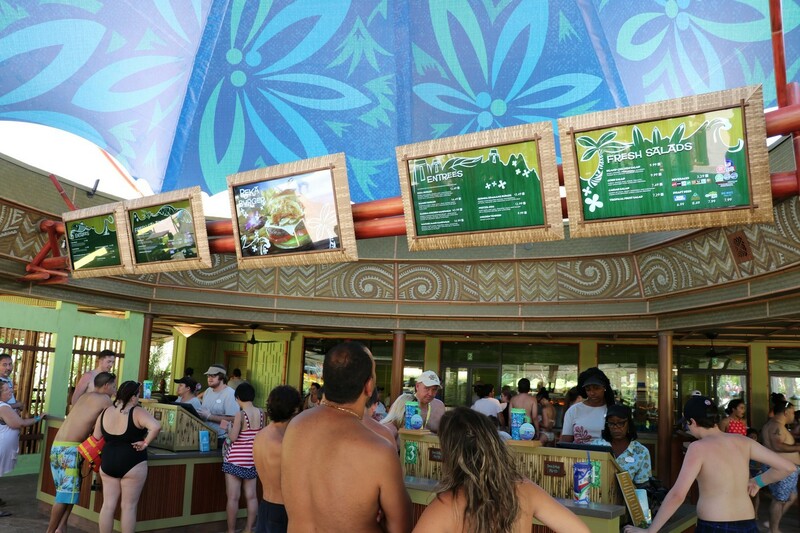 For quick snacks, they have plenty of spots located around the park to keep your refreshed and cool while spending your day in the hot sun. 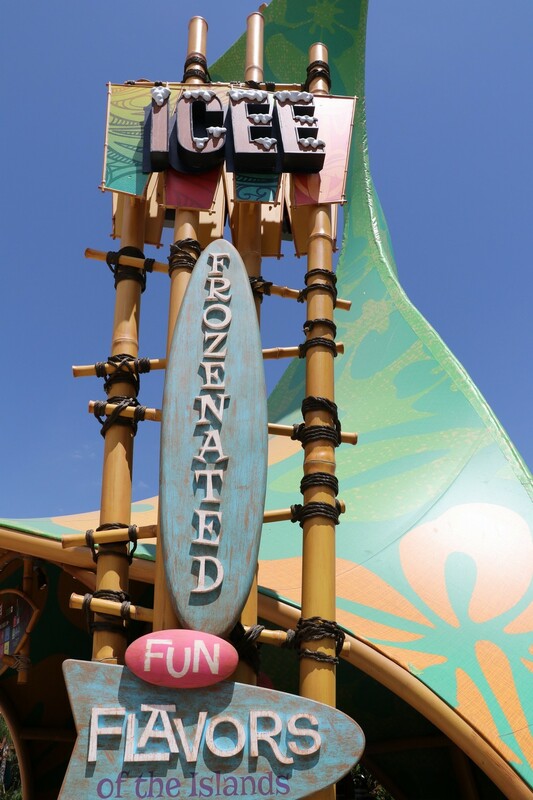 For a unique refresher, they offer a traditional Tiki POG (Pineapple, Orange, and Guava mix) slushie. 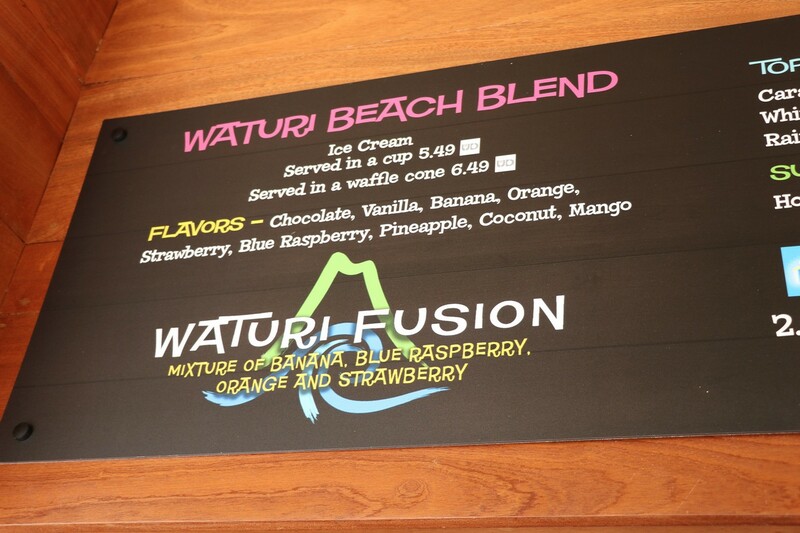 Those looking for a colder satisfaction can try the Waturi Beach Blend Ice Cream. 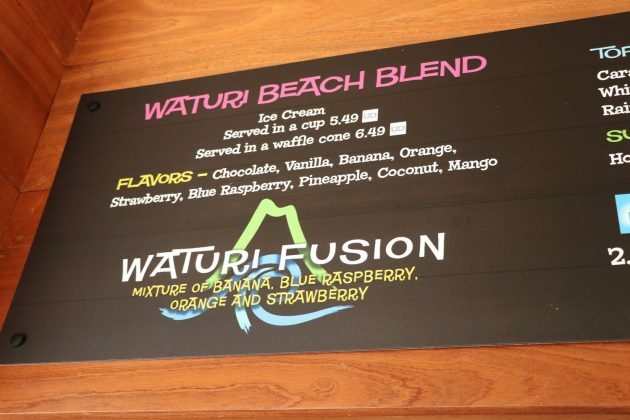 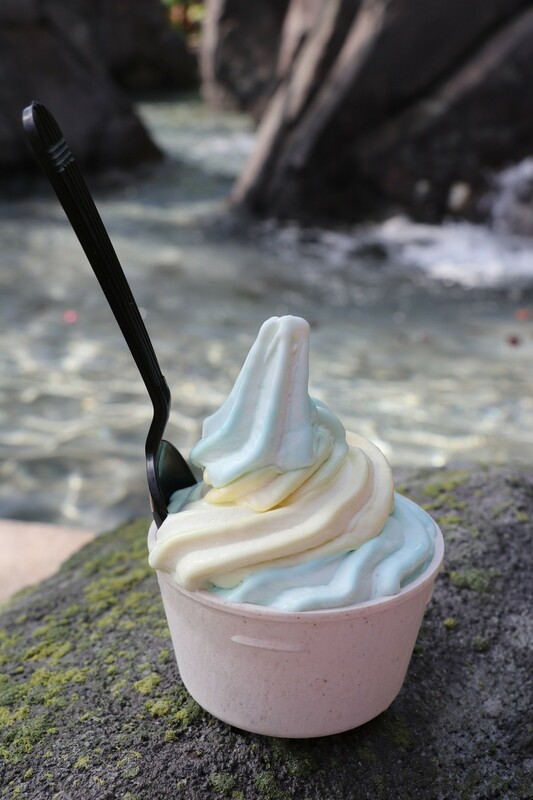 Guests can get creative and mix and match any of the 9 flavors together, or try the official “Waturi Fusion” blend; which mixes banana, blue raspberry, orange, and strawberry. While we didn’t rent a cabana, we sniffed around a few around the park that makes us want to rent one for our next visit with a big group. 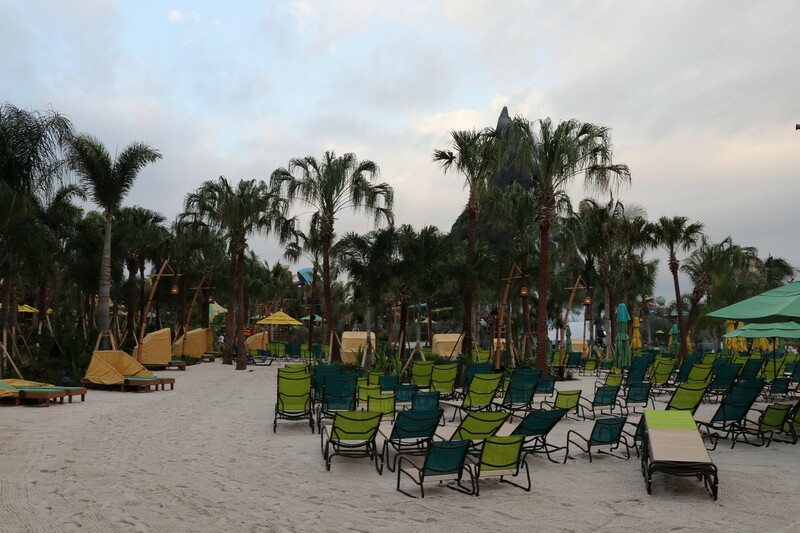 If you are planning to visit Volcano Bay with a good-sized group, we can’t encourage renting a cabana enough. 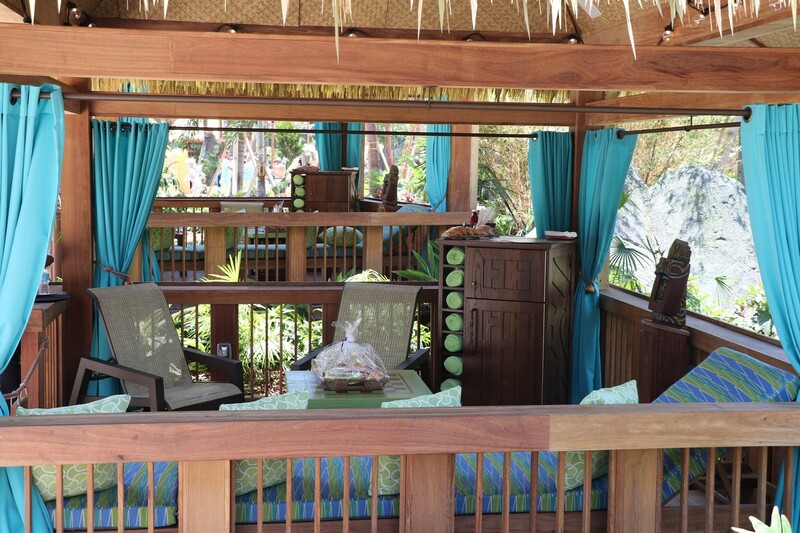 Each cabana comes with padded lounge chairs, a small refrigerator stocked with bottled water, complimentary fruit and snack basket, towel and locker service, plus concierge service with an exclusive menu of food and drink delivered directly to the cabana. 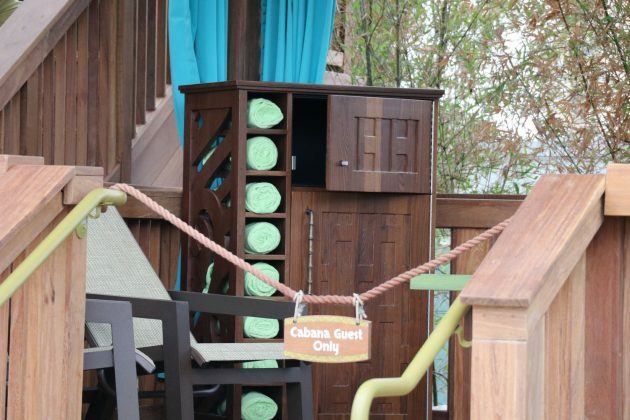 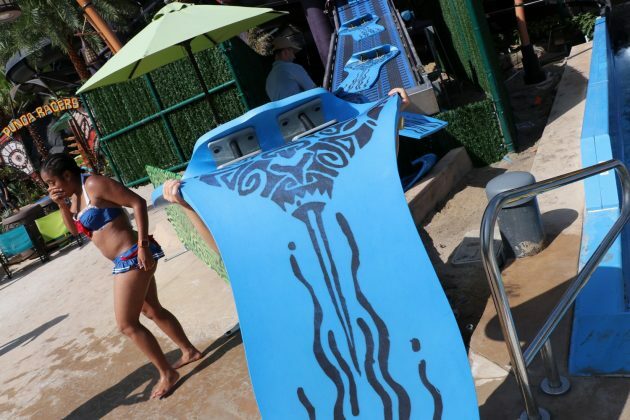 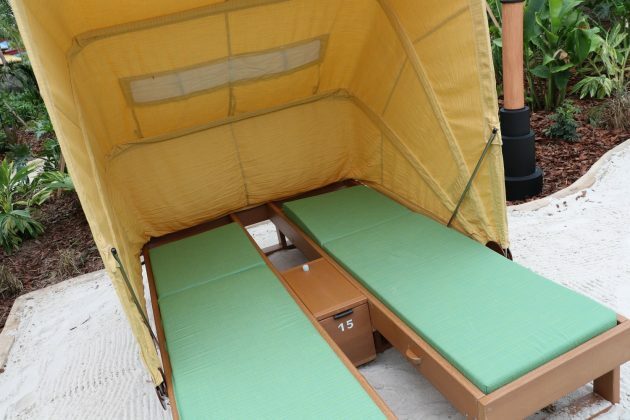 The biggest selling point is that each cabana features their own ride reservation point, meaning you do not have to go to each slide to make a reservation. 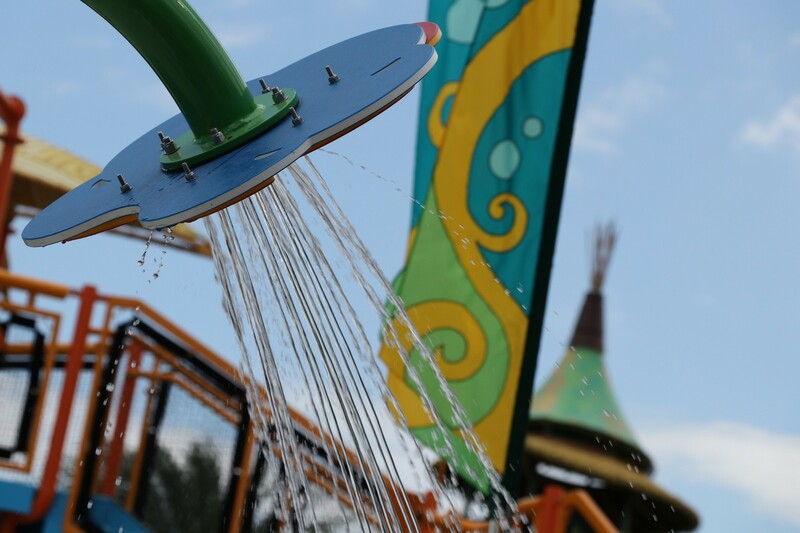 One last thing, we’re fine with calling it water theme park. 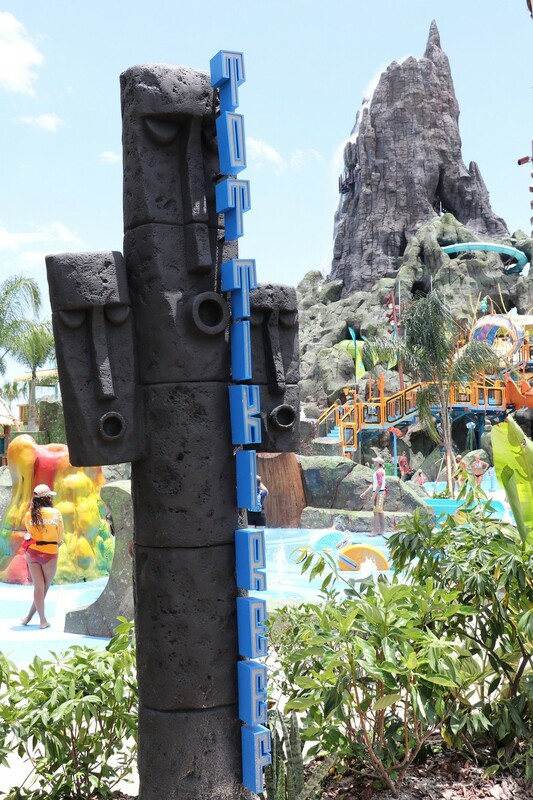 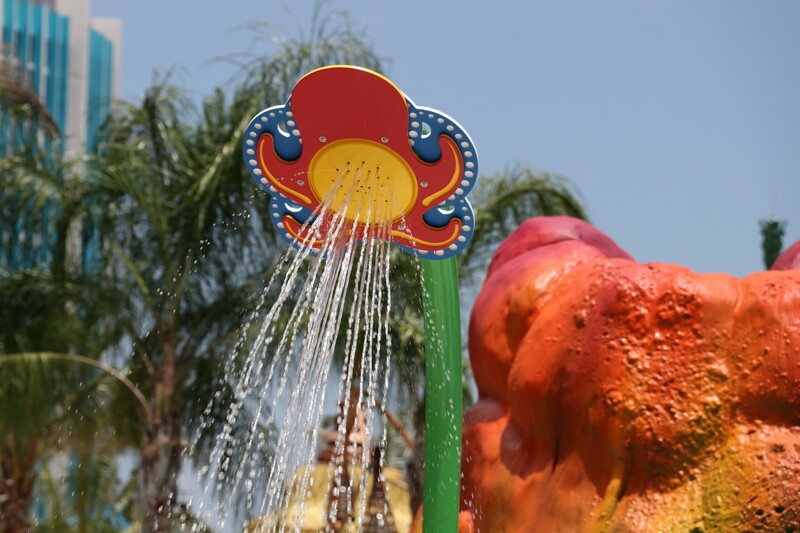 It’s themed, it’s a water park so we’re good with it; but at the end of the day – the marketing of the park does not a theme park make, all that matters is the fun you’re having. 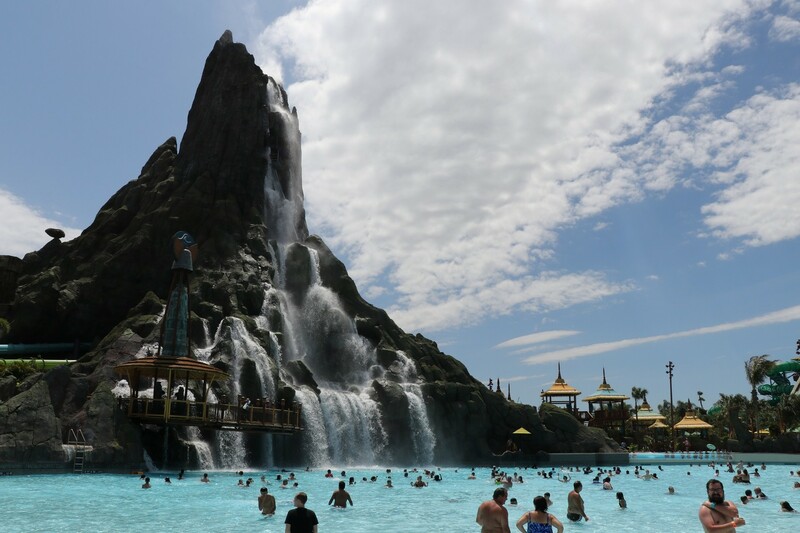 Volcano Bay is a wonderful addition to Universal Orlando’s growing resort, but still going through some tough growing pains. 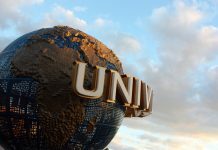 Once the dust settles, we have no doubts it will be a strong anchor as Universal continues to expand. 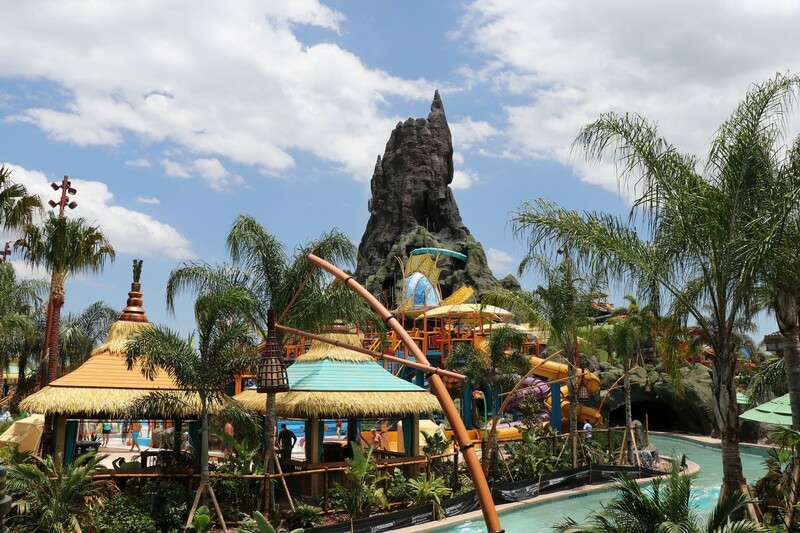 If you can look past the growing pains it’s experiencing now, make sure to visit; but we definitely feel Volcano Bay will definitely be tough to beat in a couple months. What did you think of Volcano Bay? 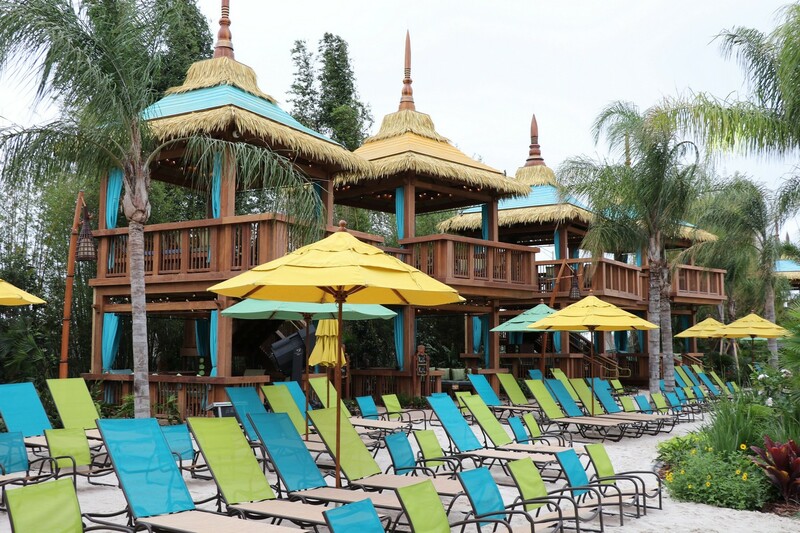 Make sure to join our discussion boards and share your thoughts and review! 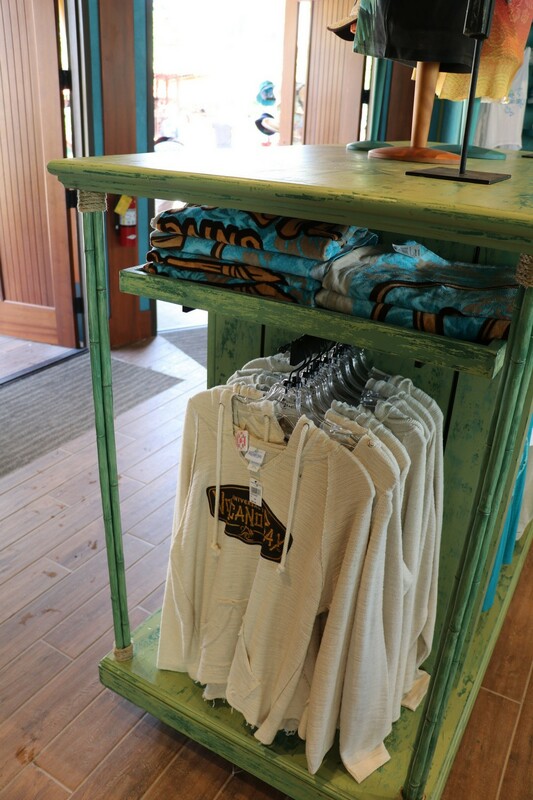 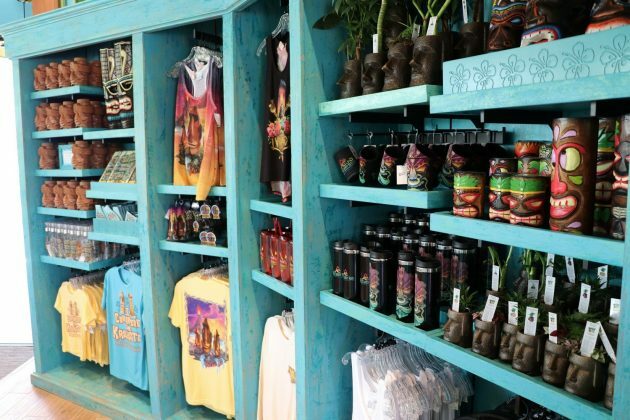 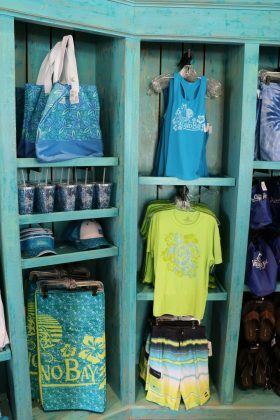 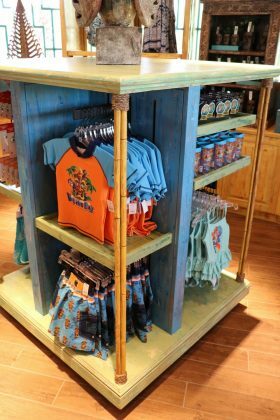 Check out the gallery below of everything Volcano Bay, from the Opening Ceremony, to the merch, to everything else!